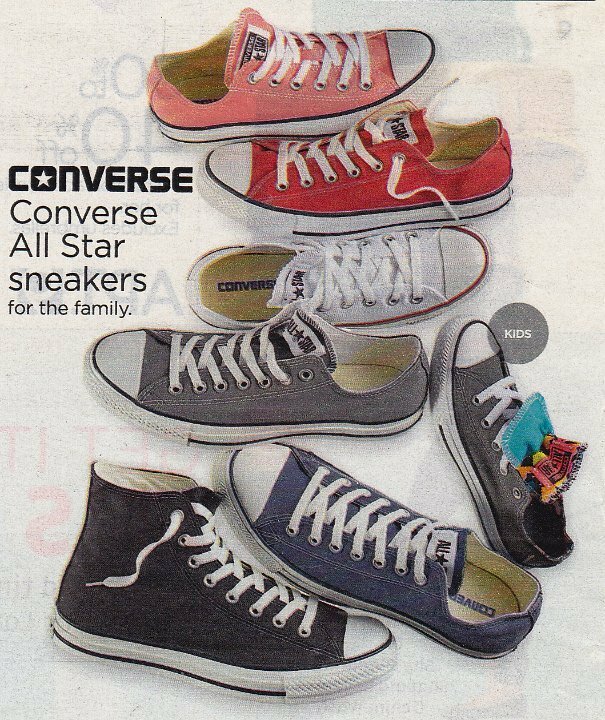 Photo gallery of newspaper supplement and other advertisements for Converse All Star Chuck Taylor sneakers. 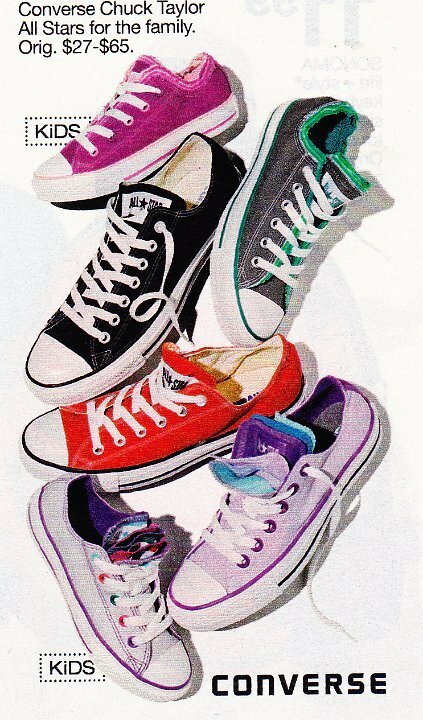 1 Ads for Chuck Taylor Shoes Ad showing black, green and amber foldover high top, distressed black high top, black and pink foldover high top, and navy and Carolina blue 2-tone low cut. 2 Ads for Chuck Taylor Shoes Ad for bamboo green low cut. 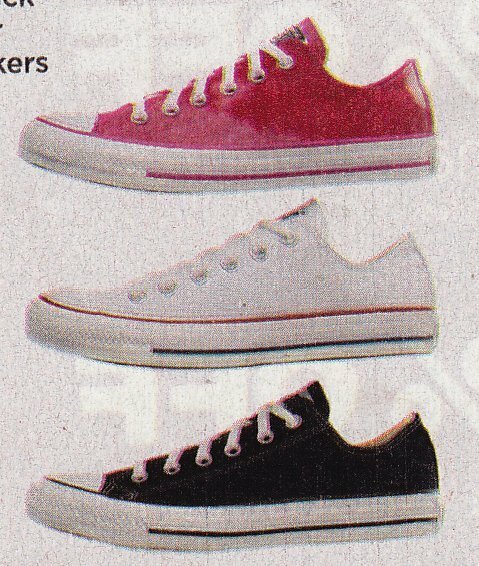 3 Ads for Chuck Taylor Shoes Ad for black high top and pink low cut chucks. 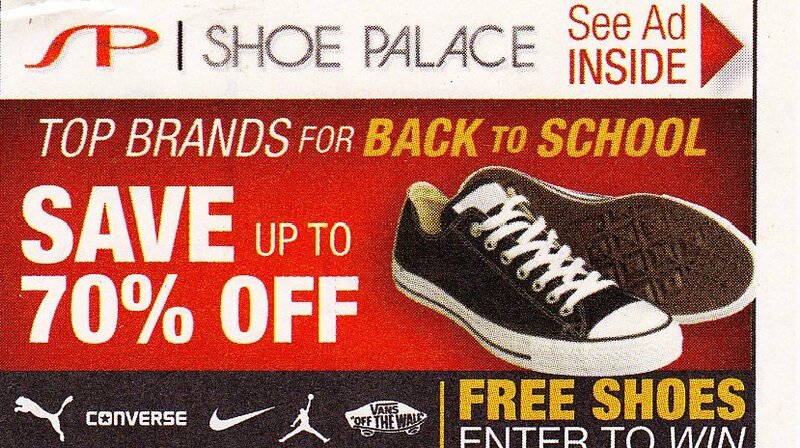 4 Ads for Chuck Taylor Shoes Back to school ad for low cut chucks in red and black. 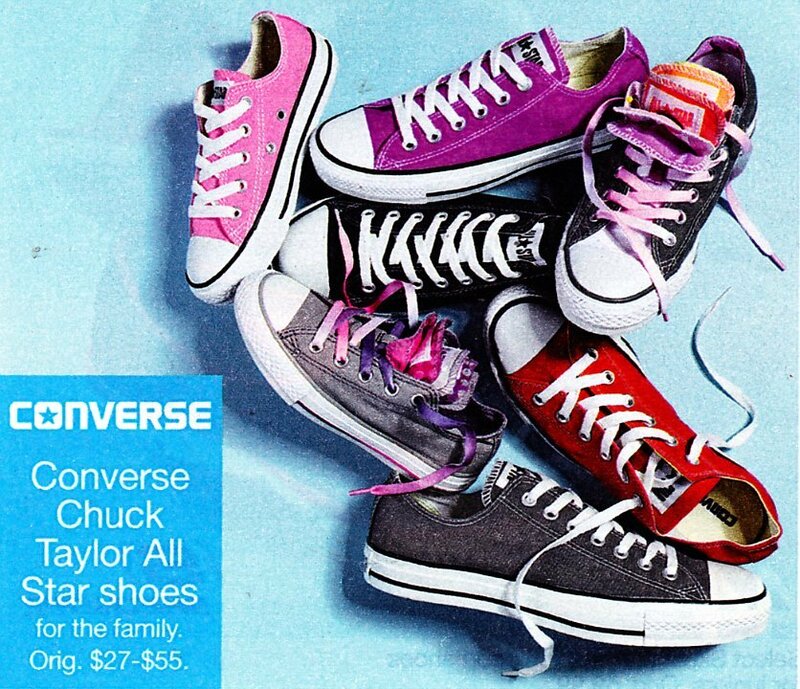 5 Ads for Chuck Taylor Shoes Ad for brown and pink foldover and black monochrome high top chucks. 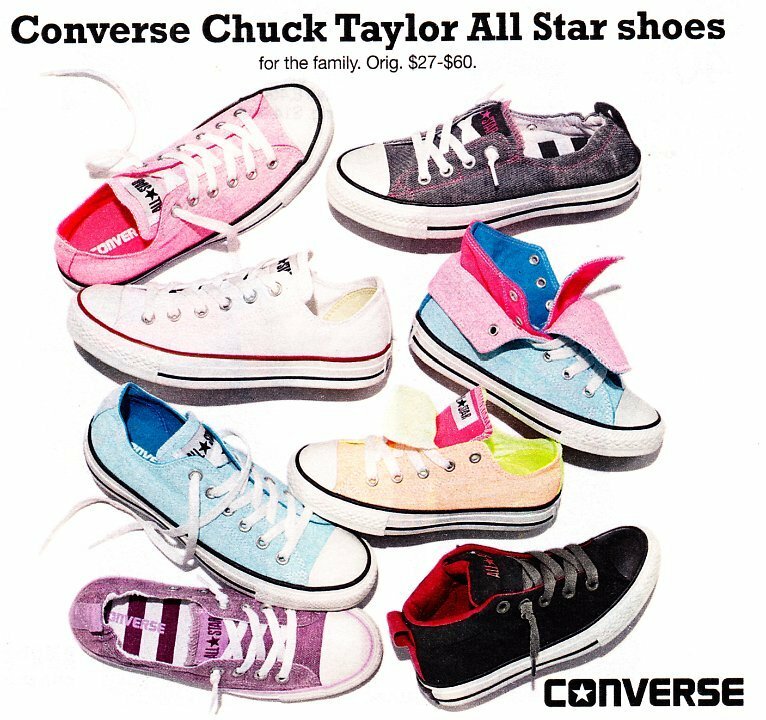 6 Ads for Chuck Taylor Shoes Ad for eight different models of chucks, including the black low cut, optical white high top, monochrome black flames, distressed red high top, apple green slip-on, monochrome black high top, and black and pink foldover. 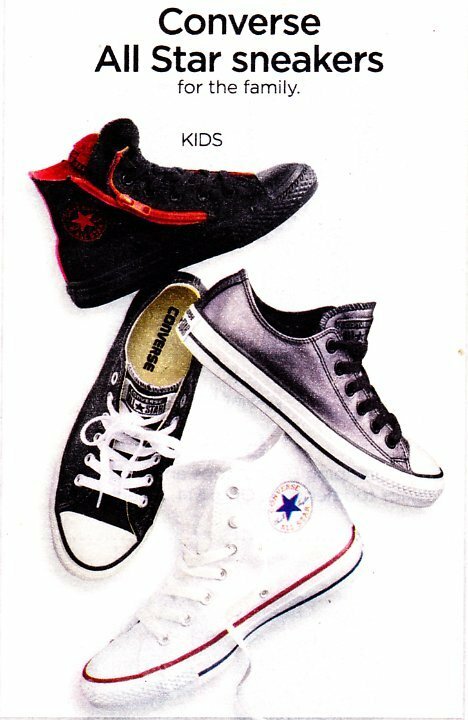 7 Ads for Chuck Taylor Shoes Ad for youth and infant chucks, including the black high top, black low cut, and black and red tattoo high top. 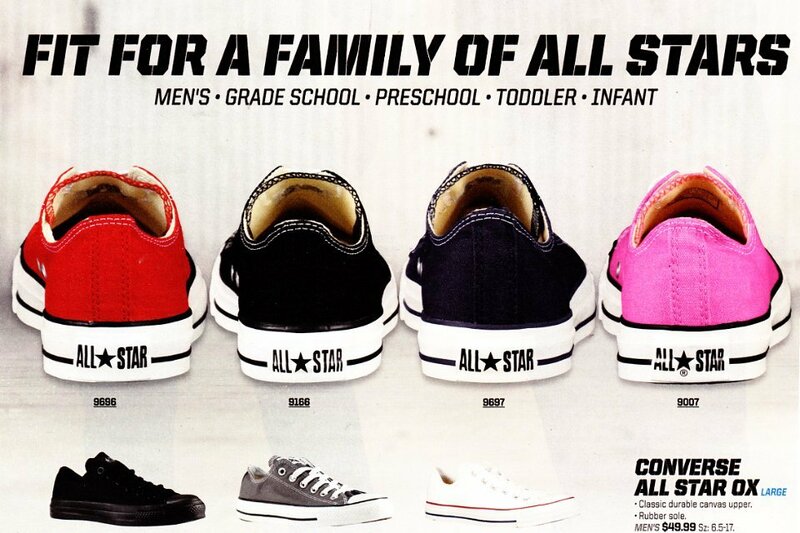 8 Ads for Chuck Taylor Shoes Ad for kids and toddlers chucks. 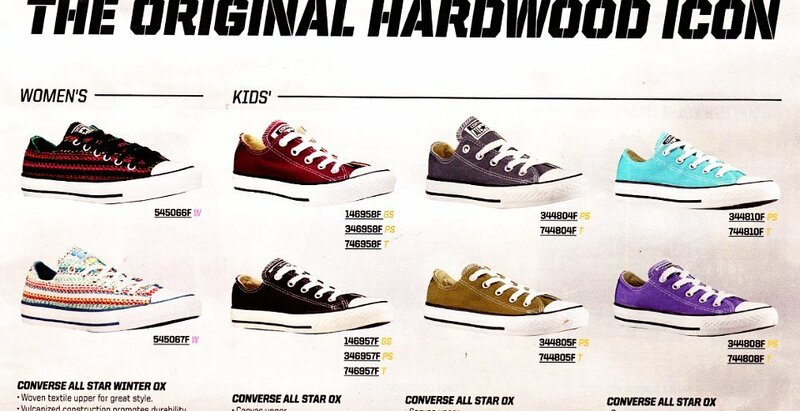 9 Ads for Chuck Taylor Shoes Converse ad showing the black and pink rolldown high top and the bamboo green low cut. 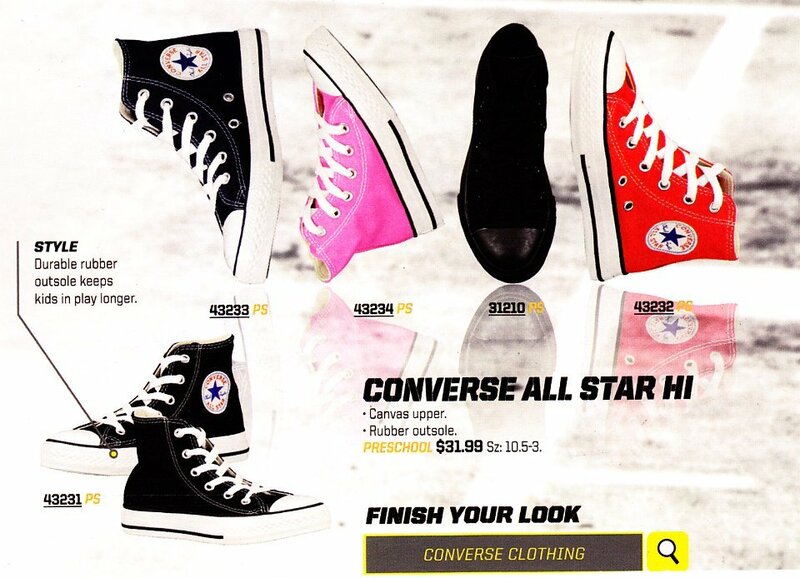 10 Chuck Taylor Shoe AdsAds for Chuck Taylor Shoes Ad showing the black high top, pink and black and pink low cut, and two models of the star player low cut. 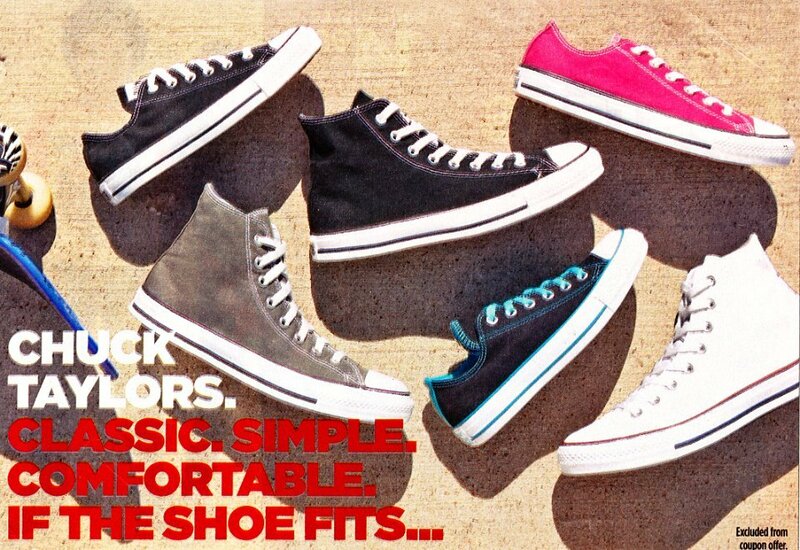 11 Ads for Chuck Taylor Shoes Ad showing black high top and a variety of low cut chucks. 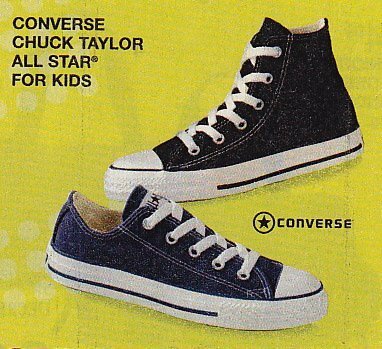 12 Ads for Chuck Taylor Shoes Ad showing black high top and blue low cut chucks for kids. 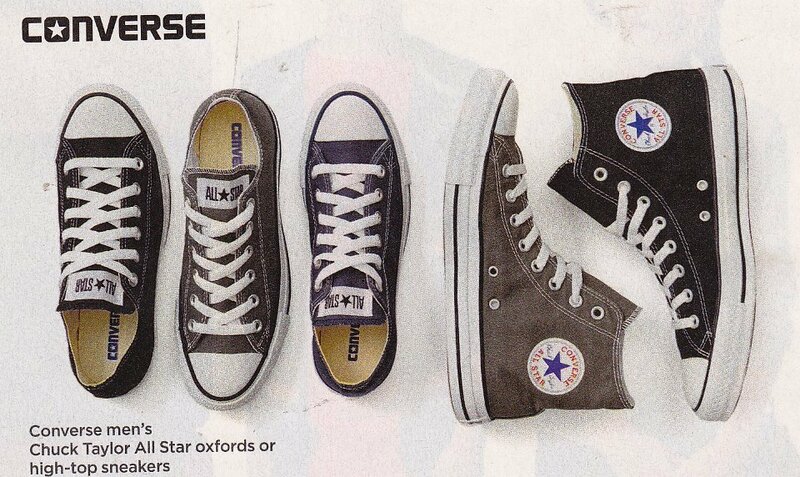 13 Ads for Chuck Taylor Shoes Ad for black low cut, star print low cut, and grey slip on. 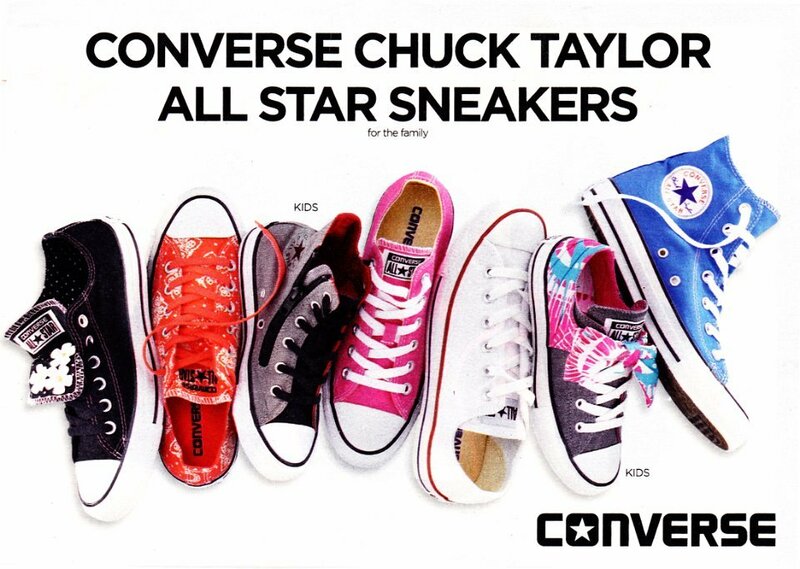 14 Ads for Chuck Taylor Shoes Ad showing various models of chucks for kids. 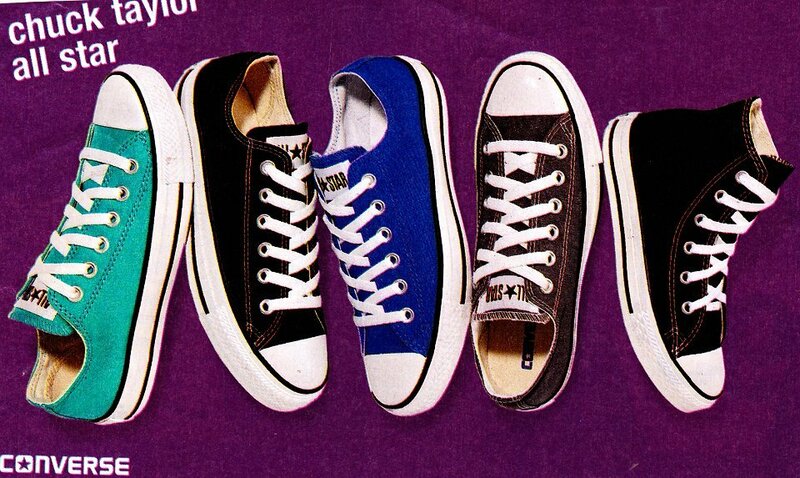 15 Ads for Chuck Taylor Shoes Ad showing black, charcoal, navy, royal and turquoise low cut chucks. 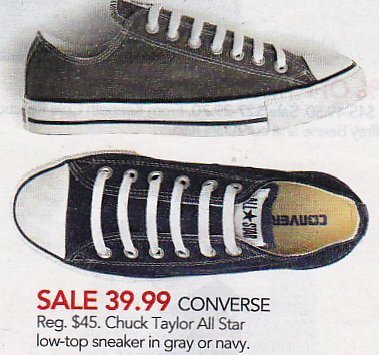 16 Ads for Chuck Taylor Shoes Ad showing gray and navy low cuts. 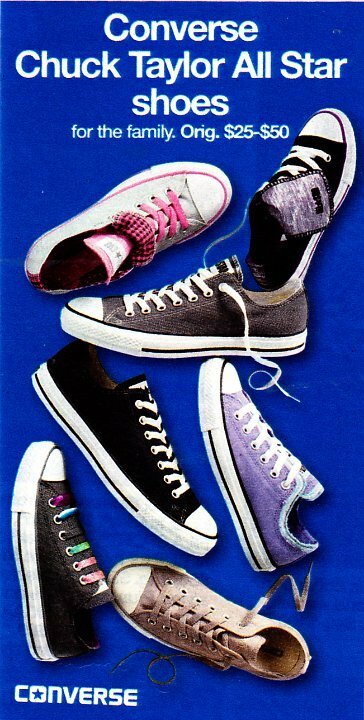 17 Ads for Chuck Taylor Shoes Ad showing black, grey, royal blue, black and pink doiuble tongue, and sliver low cut chucks. 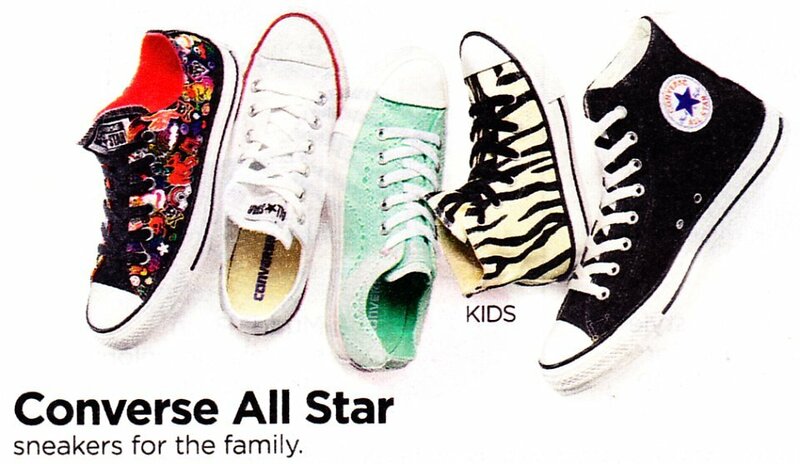 18 Ads for Chuck Taylor Shoes Ad showing seasonal print models for kids. 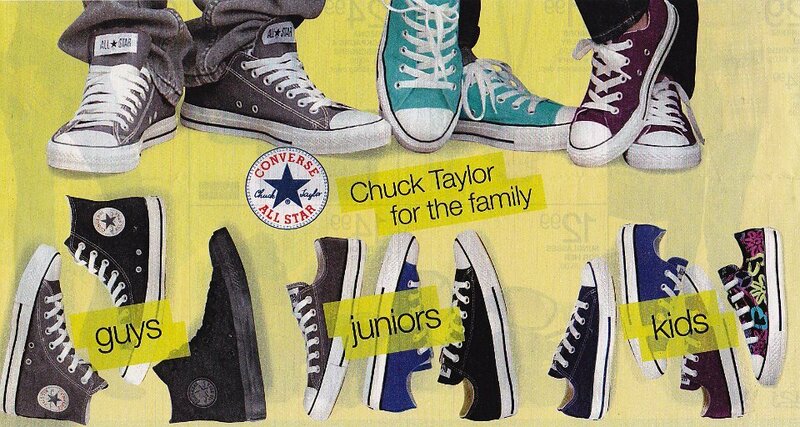 19 Ads for Chuck Taylor Shoes Ad showing black high top and several seasonal low cut models. 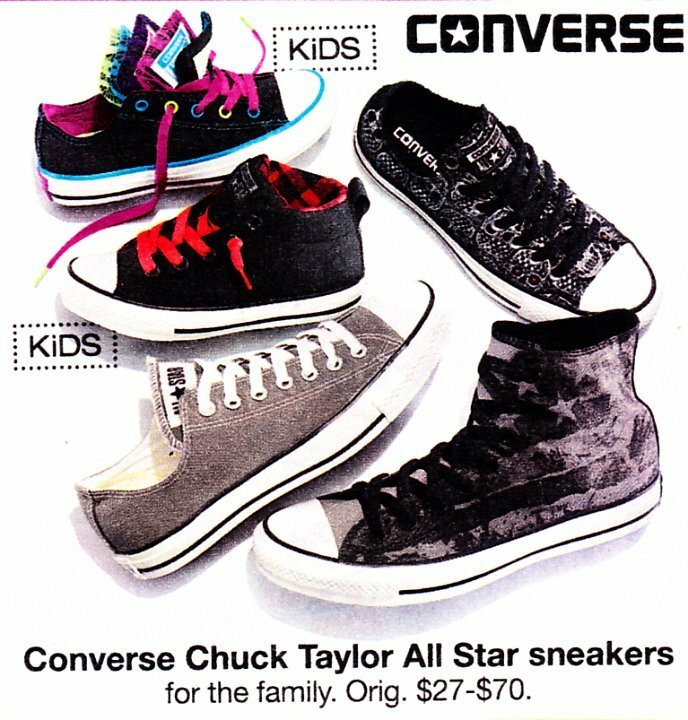 20 Ads for Chuck Taylor Shoes Ad showing black high top, silver, grey, and black and pink double tongue low cut chucks. 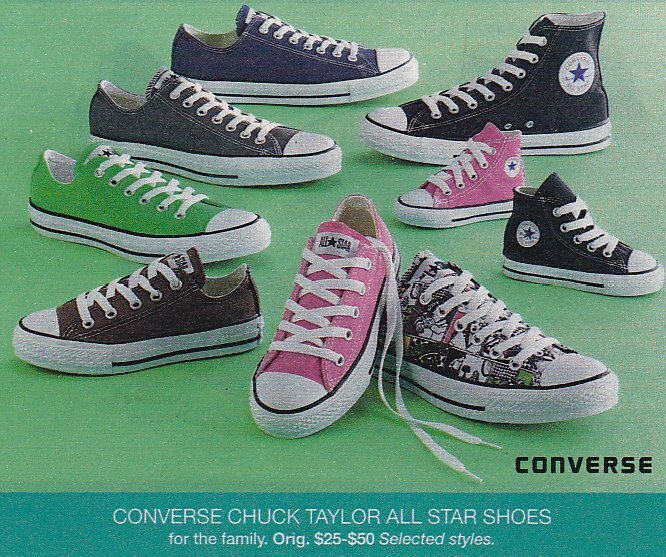 21 Ads for Chuck Taylor Shoes Ad for the black high top, black and pink foldover high top, and the bamboo green low cut. 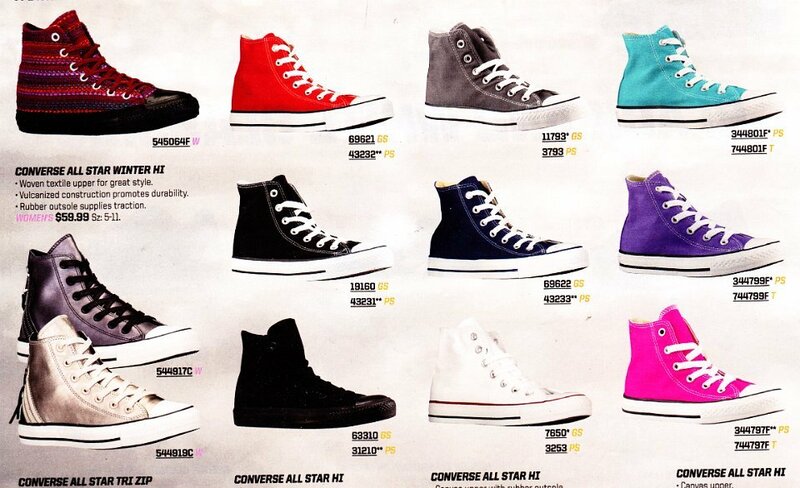 22 Ads for Chuck Taylor Shoes Ad showing black high top and low cut along with severl seasonal models. 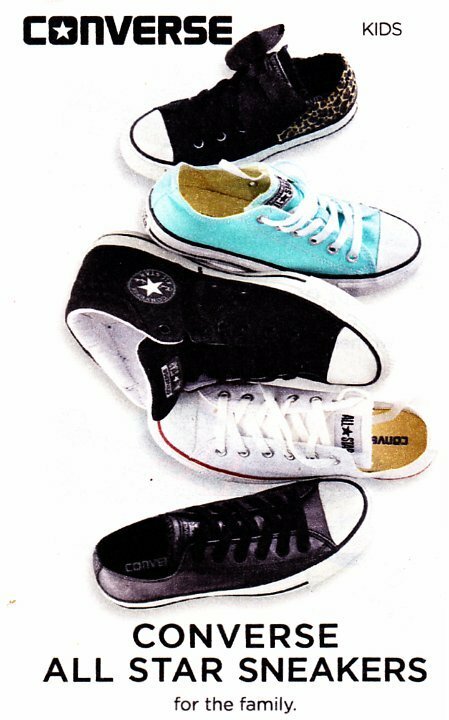 23 Ads for Chuck Taylor Shoes Ad showing black high top and low cut, along with navy, grey, pink, turquoise, and character print low cuts. 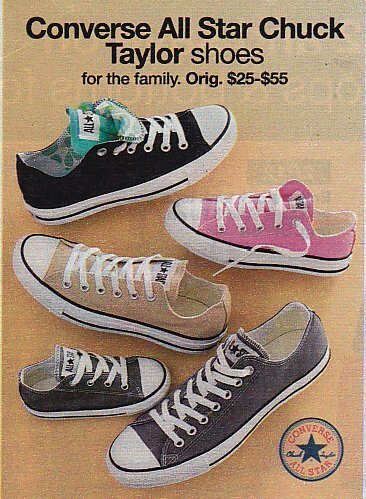 24 Ads for Chuck Taylor Shoes Ad showing grey, tan, pink, tan, and doiuble tongue low cuts. 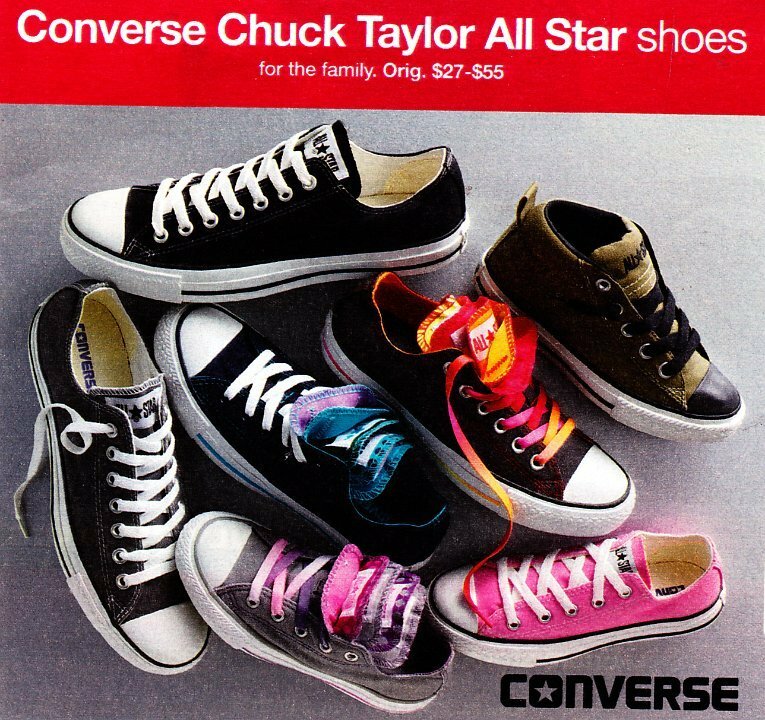 25 Ads for Chuck Taylor Shoes Ad showing black high tops and low cut, along with grey, turquoise, navy, and double tongue low cut models. 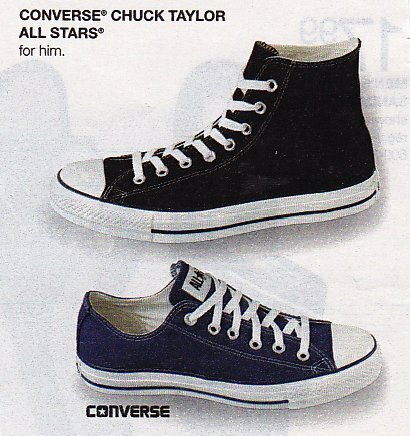 26 Ads for Chuck Taylor Shoes Ad showing grey and navy blue low cuts. 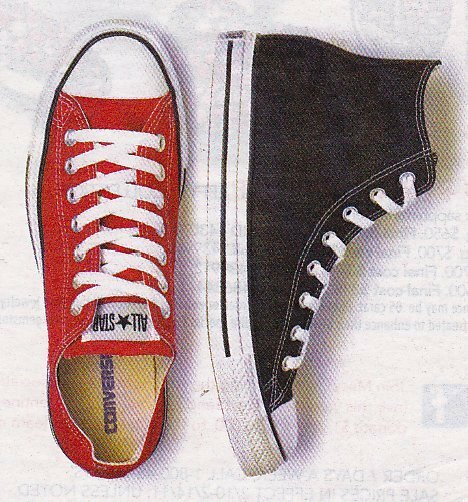 27 Ads for Chuck Taylor Shoes Ad showing a black high top and red low cut. 28 Ads for Chuck Taylor Shoes Ad for white, red, and black 'Chuck It' seasonal chucks. 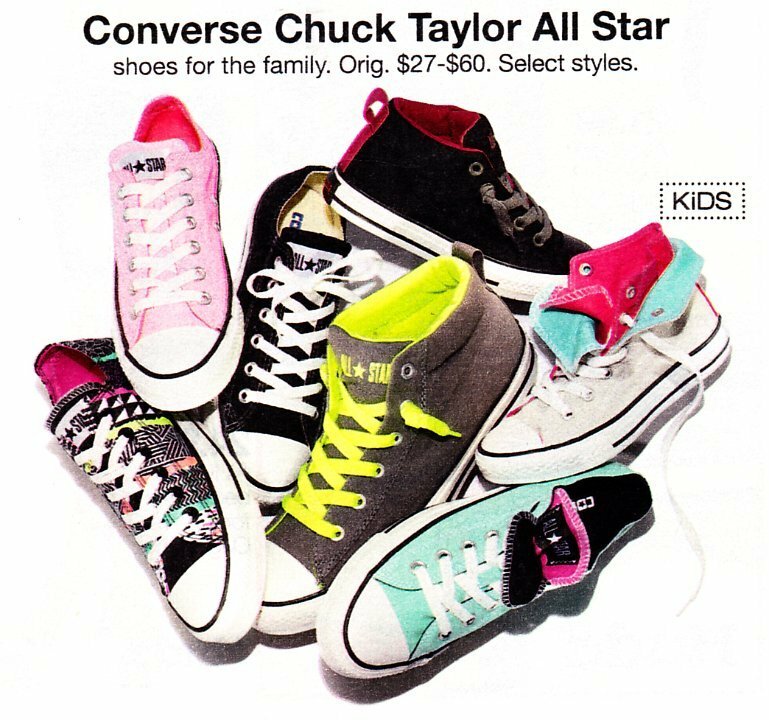 29 Ads for Chuck Taylor Shoes Ad showing black, gray, pink, and green high top chuck all stars. 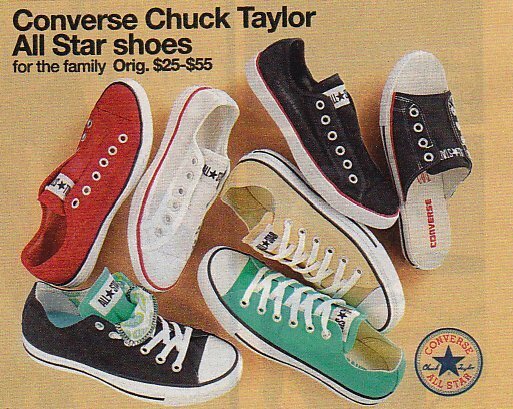 30 Ads for Chuck Taylor Shoes Ad showing red, white, tan, mint green, and black All Star chucks. 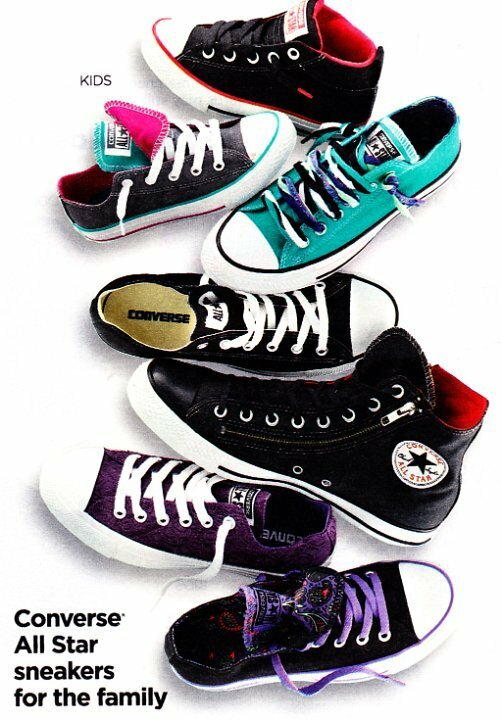 31 Ads for Chuck Taylor Shoes Ad showing black, gray, green, pink, purple, and red chucks. 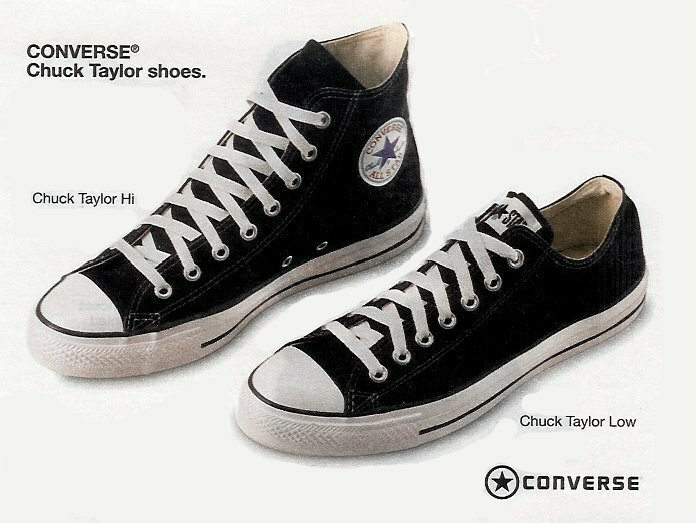 32 Ads for Chuck Taylor Shoes Ad for the black high top and black low cut canvas Chuck Taylor. 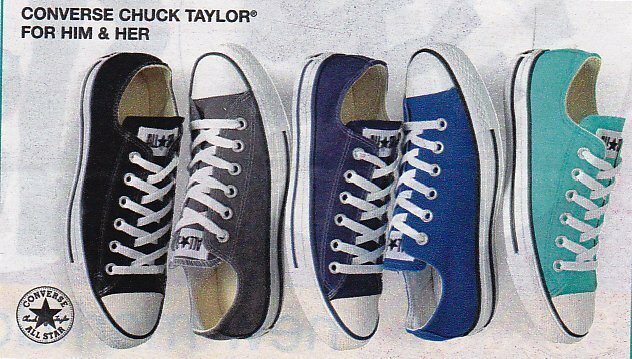 33 Ads for Chuck Taylor Shoes Ad for black and blue chucks. 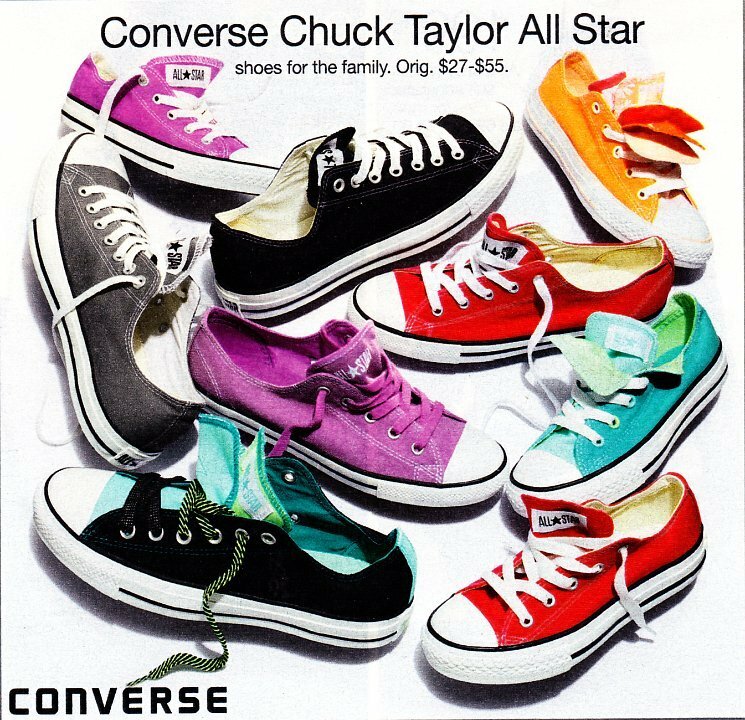 35 Ads for Chuck Taylor Shoes Ad showing chucks with many colors. 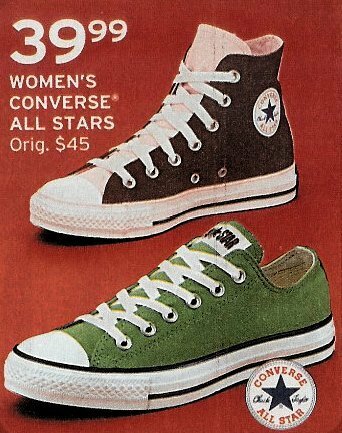 36 Ads for Chuck Taylor Shoes Ad showing black, green, and brown chucks. 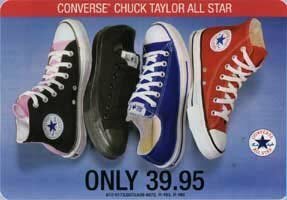 37 Ads for Chuck Taylor Shoes Ad for black high top and low cut chucks. 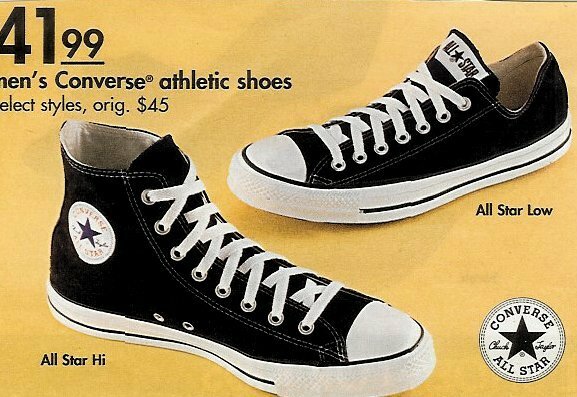 38 Ads for Chuck Taylor Shoes Ad showing black. 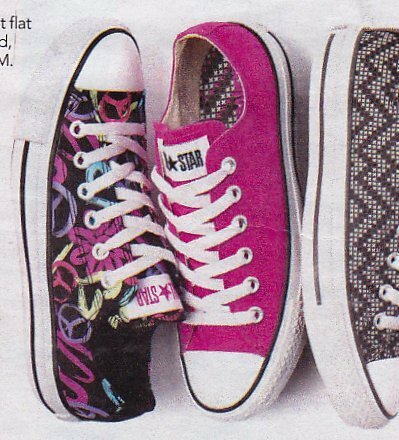 pink, purple, gray, and white All Star chucks. 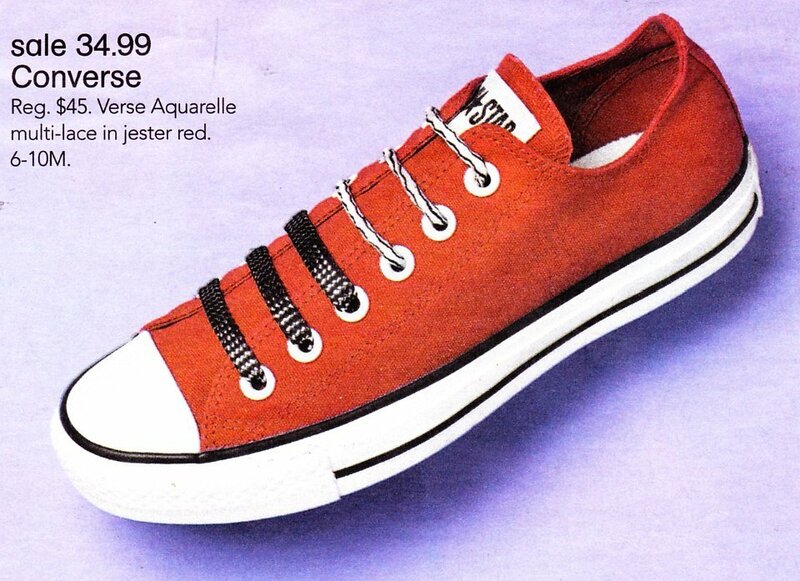 39 Ads for Chuck Taylor Shoes Ad for jester red low cuts with Verse Acquarelle multi-laces. 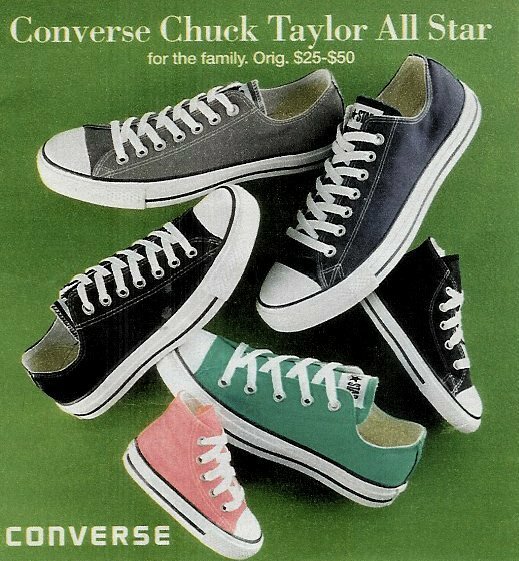 42 Ads for Chuck Taylor Shoes Ad showing green, black, and blue chucks. 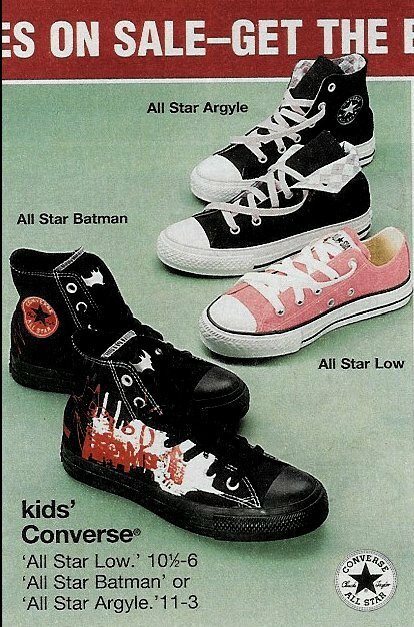 43 Ads for Chuck Taylor Shoes Chucks for kids including Batman and argyle foldover models. 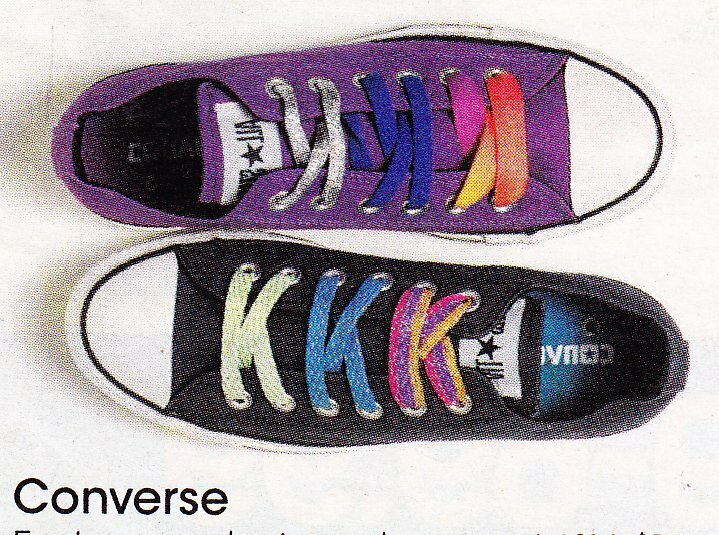 44 Ads for Chuck Taylor Shoes Ad showing white, purple, pink, gold, and black chucks. 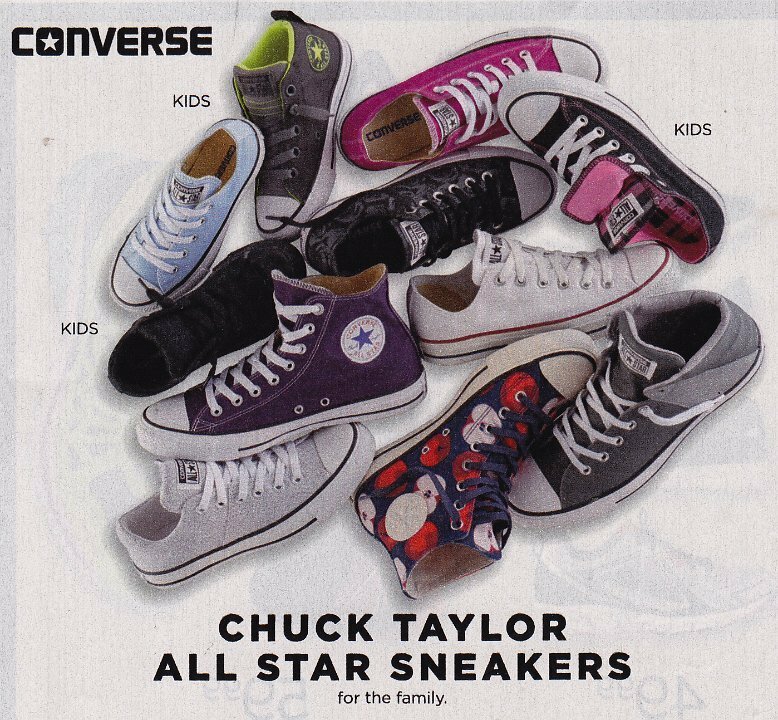 46 Ads for Chuck Taylor Shoes Ad showing black high top and low cut chucks, along with kids and double tongue low cut models. 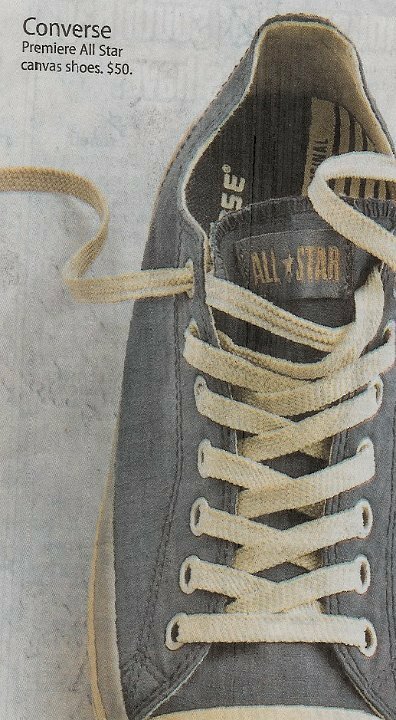 47 Ads for Chuck Taylor Shoes Ad for black and blue print double tongue osford chuck. 49 Ads for Chuck Taylor Shoes Ad for various low cut regualr and double tongue chucks. 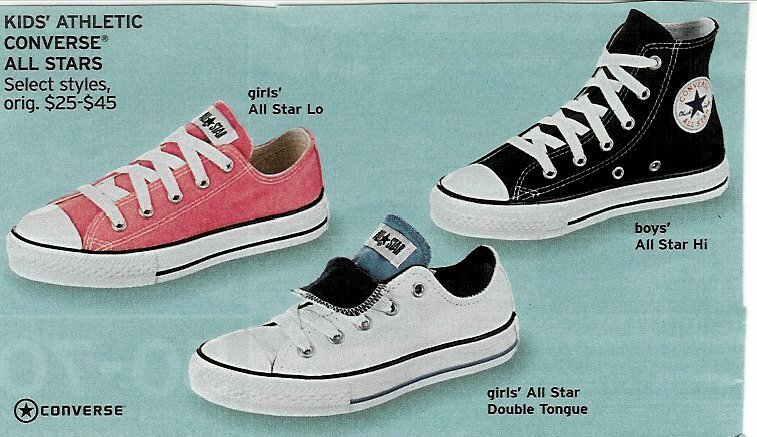 50 Ads for Chuck Taylor Shoes Ad for black high top and low cut chucks, along with pink, gray and gray/red double tongue models. 51 Ads for Chuck Taylor Shoes Partial view of core low cut chucks. 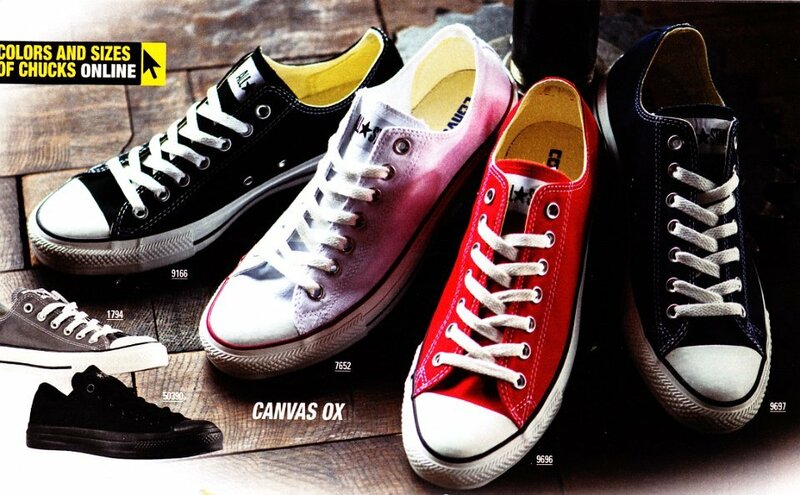 52 Ads for Chuck Taylor Shoes Ad for black, red, and raspberry low cut chucks. 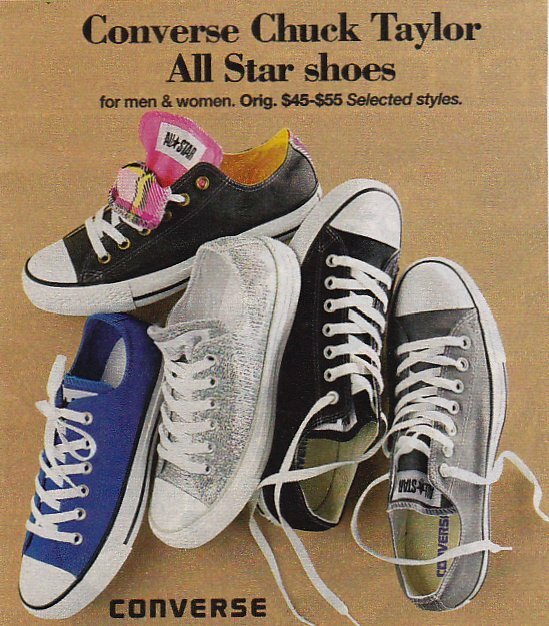 53 Ads for Chuck Taylor Shoes Ad showing monochrome black high top chucks along with mid high collar seasonal models. 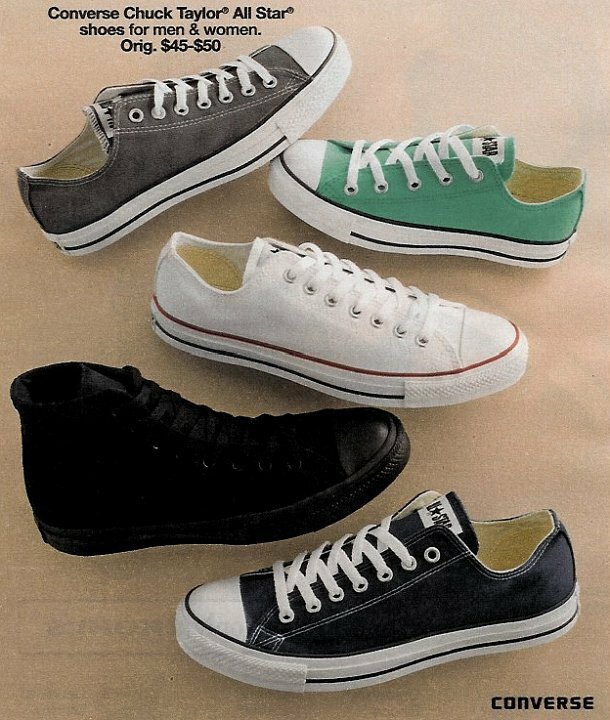 54 Ads for Chuck Taylor Shoes Ad for black high top and low cut chucks, black slip on chucks, and bamboo green low cut chucks. 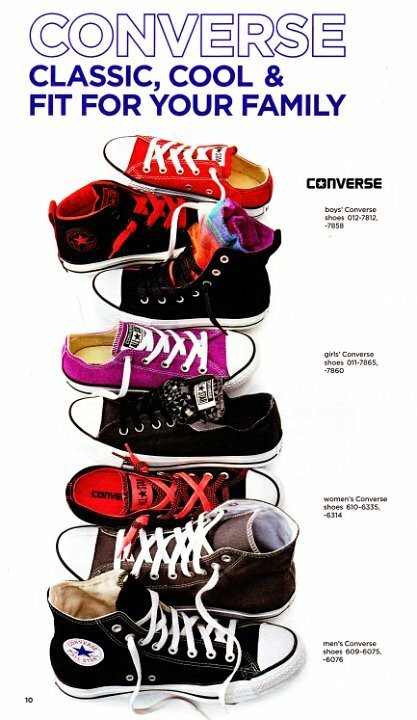 55 Ads for Chuck Taylor Shoes Ad for pink, purple, red, charcoal and several double tongue models. 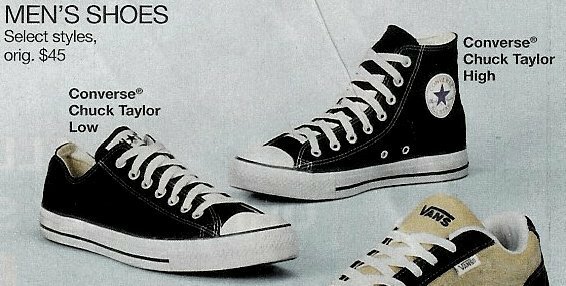 56 Ads for Chuck Taylor Shoes Ad for black. gray, and red core low cuts along with iris orchid and gray multiple tongue. 57 Ads for Chuck Taylor Shoes Ad for various low cut chucks. 58 Ads for Chuck Taylor Shoes Ad for low cut chucks. 59 Ads for Chuck Taylor Shoes Ad for low cut chucks. 60 Ads for Chuck Taylor Shoes Ad for low cut chucks. 61 Ads for Chuck Taylor Shoes Ad for low cut chucks. 62 Ads for Chuck Taylor Shoes Ad for low cut chucks. 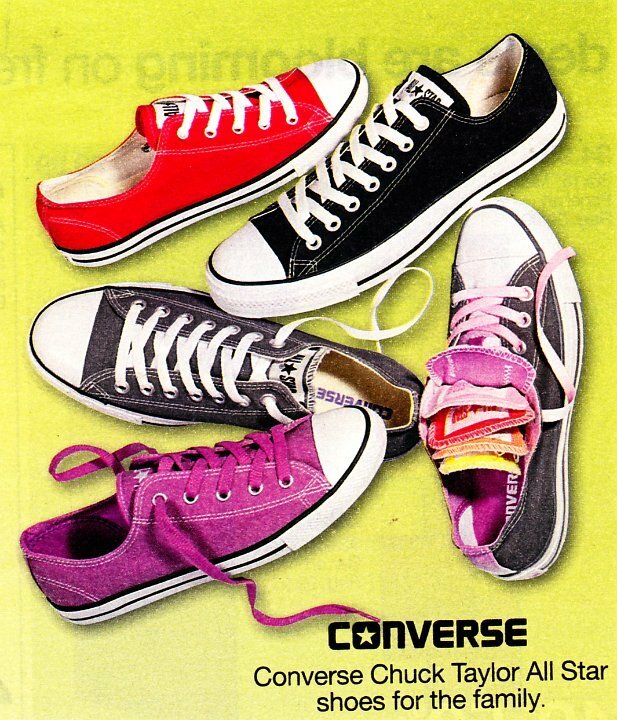 63 Ads for Chuck Taylor Shoes Ad for low cut chucks with fun laces. 64 Ads for Chuck Taylor Shoes Ad for black low cut chucks. 65 Ads for Chuck Taylor Shoes Vintage Converse ad for the black Chuck Taylor high top, showing the shoe making impressions with its unique outer sole pattern. 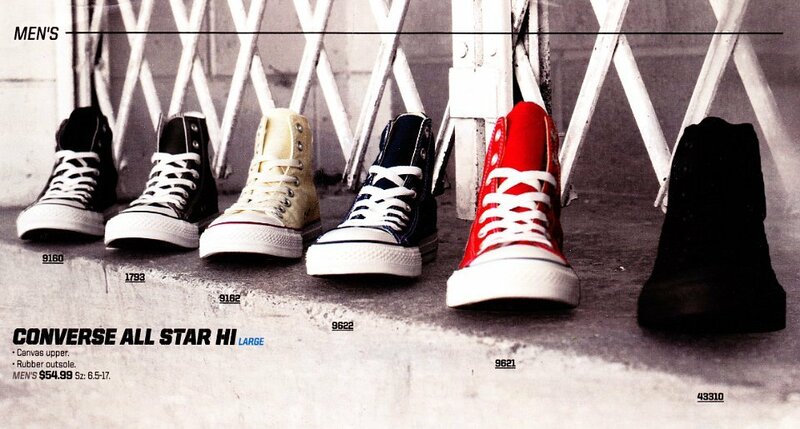 66 Ads for Chuck Taylor Shoes Ad for various core and seasonal high top and low cut chucks. 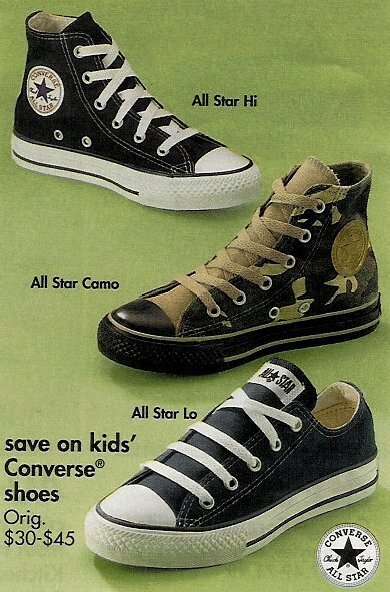 67 Ads for Chuck Taylor Shoes Ad showing low cut and mid chucks, mostly for kids. 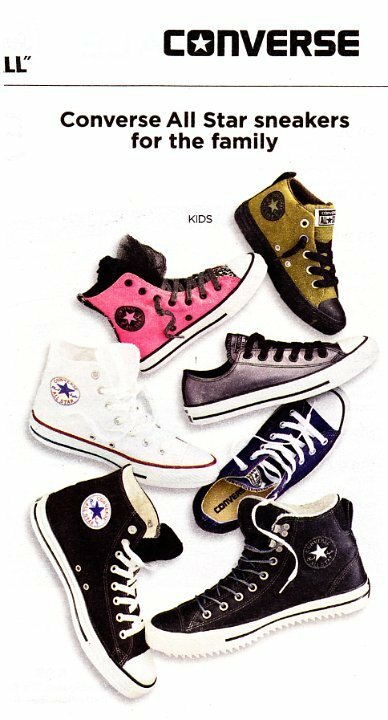 68 Ads for Chuck Taylor Shoes Ad showing the black high top, charocal low cut, and multi-layer and mid high chucks for kids. 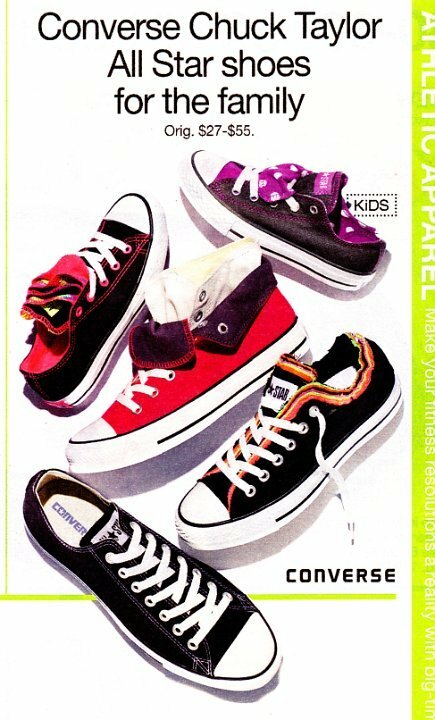 69 Ads for Chuck Taylor Shoes Ad showing a selection of low cuts and double tongue chucks along with a red foldover high top. 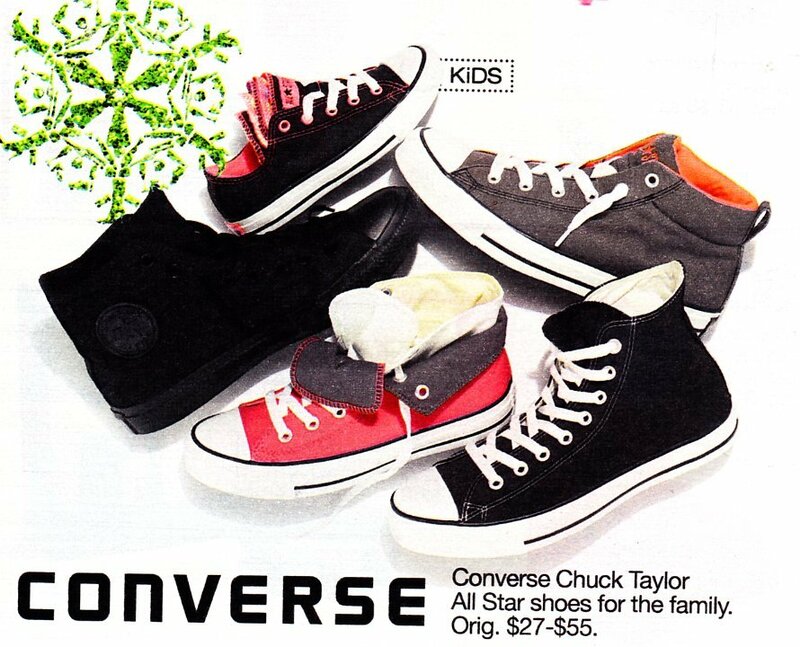 70 Ads for Chuck Taylor Shoes Ad showing black, black monochrome, and red foldover high tops, with grey mid high, and black multi-tongue low cut chucks. 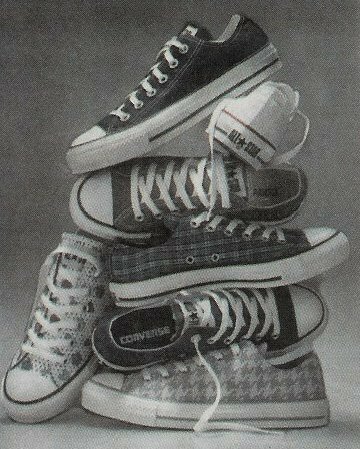 71 Ads for Chuck Taylor Shoes Ad showing core high top chucks. 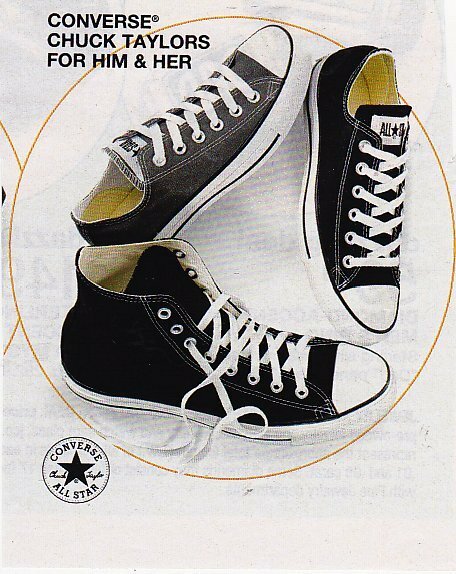 72 Ads for Chuck Taylor Shoes Ad with black and tan extra high chucks. 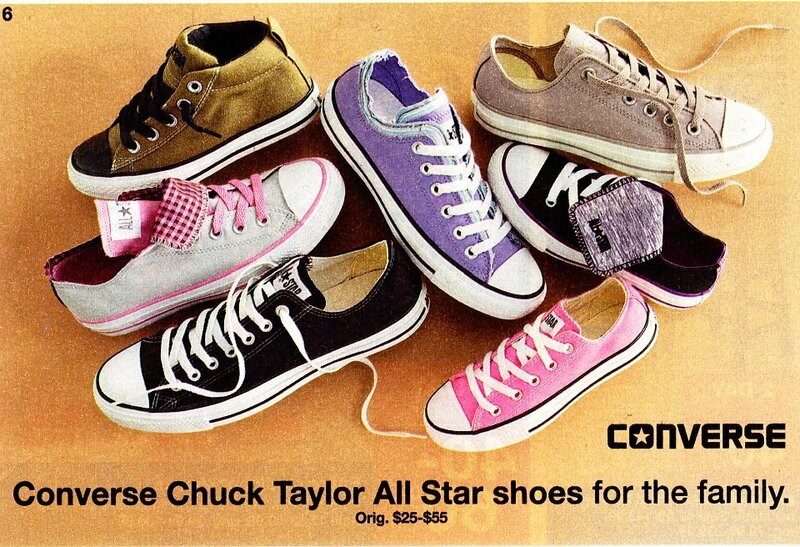 73 Ads for Chuck Taylor Shoes Ad showing a variety of low cut chucks with unusual lacings. 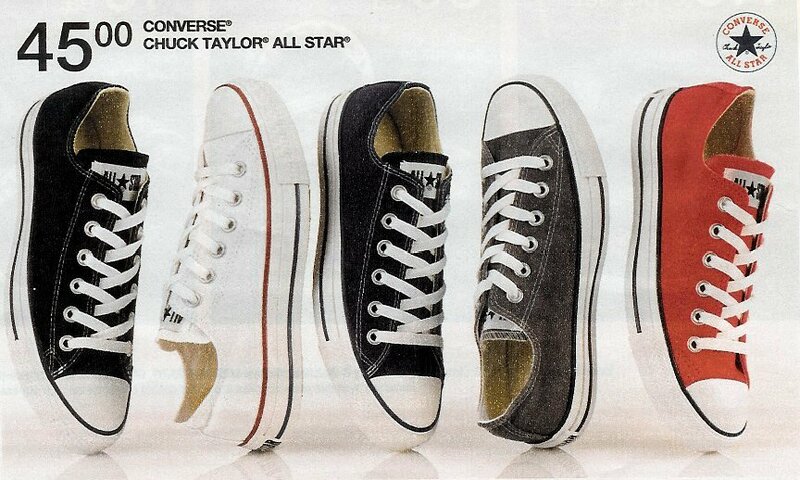 74 Ads for Chuck Taylor Shoes Ad showing a top view of core low cut chucks. 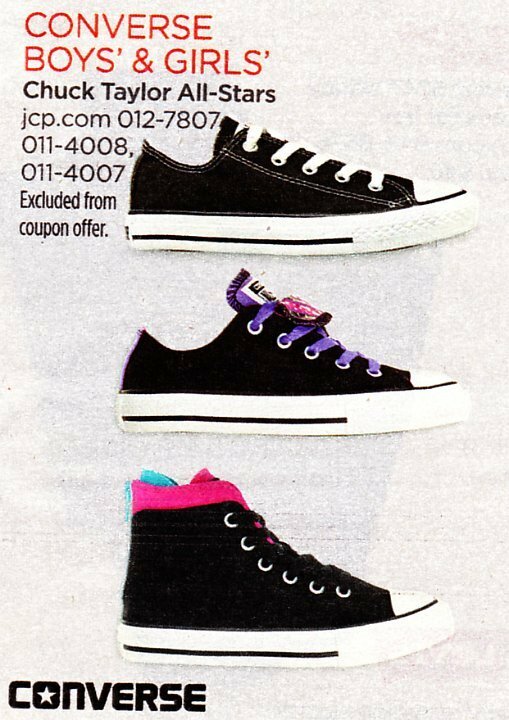 75 Ads for Chuck Taylor Shoes This JC Penney Chuck Taylor ad shows the black and pink foldover high top, monochrome black and navy blue low cuts, and the red high top. 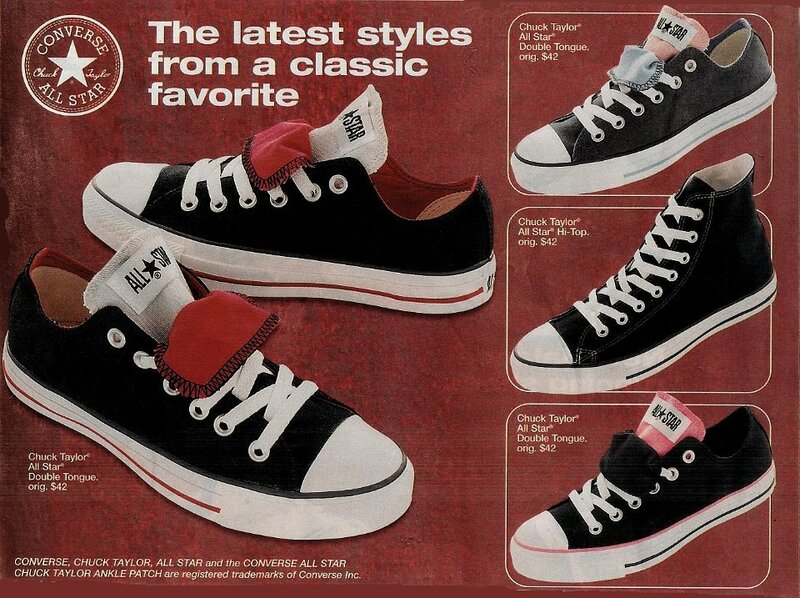 76 Ads for Chuck Taylor Shoes Ad showing a red double upper foldover, black low cut, and black multi-layer, multi-tongue, and doiuble tongue low cuts. 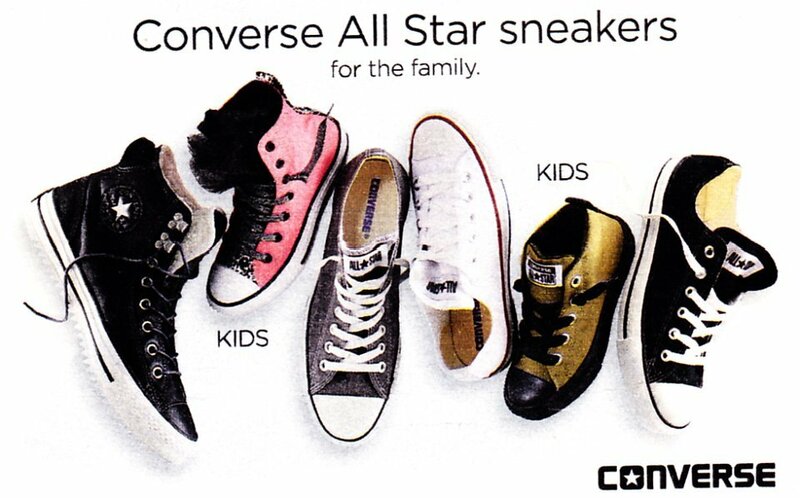 77 Ads for Chuck Taylor Shoes Ad featuring mid and low cut models mostly for kids. 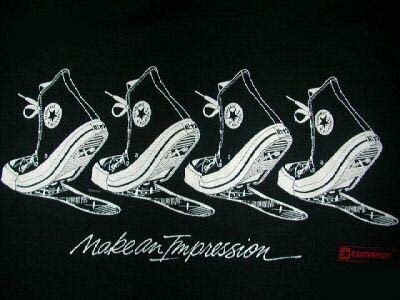 78 Ads for Chuck Taylor Shoes Mid high and low cut models in standard design and with double tongues. 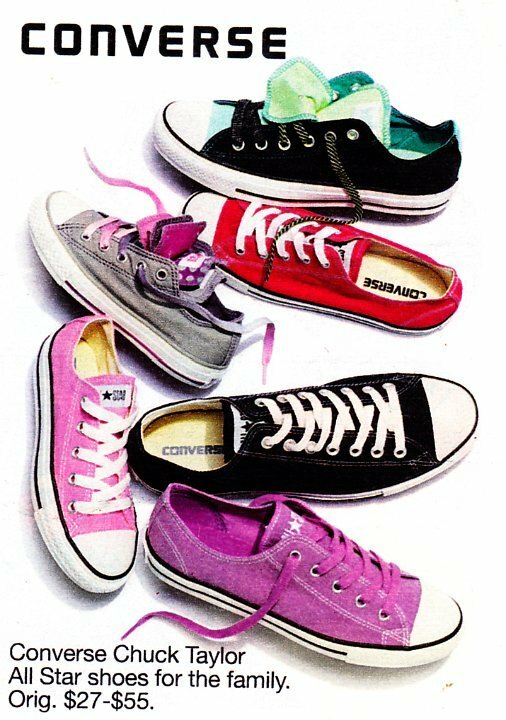 79 Ads for Chuck Taylor Shoes Chuck Taylor low cut and mid high models in pink, green, charcoal, black, and natural white. 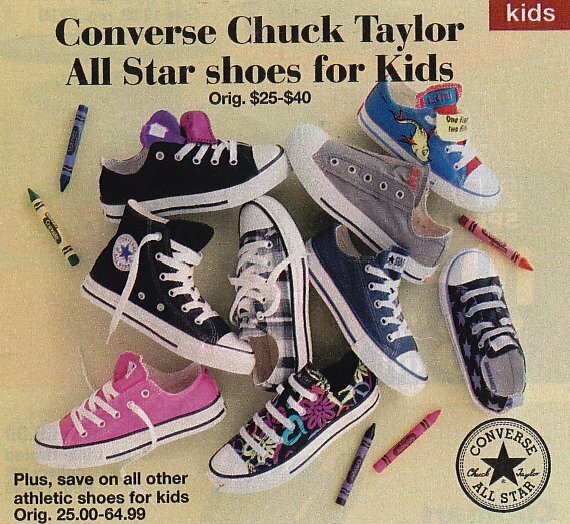 80 Ads for Chuck Taylor Shoes Multi colored chucks for kids. 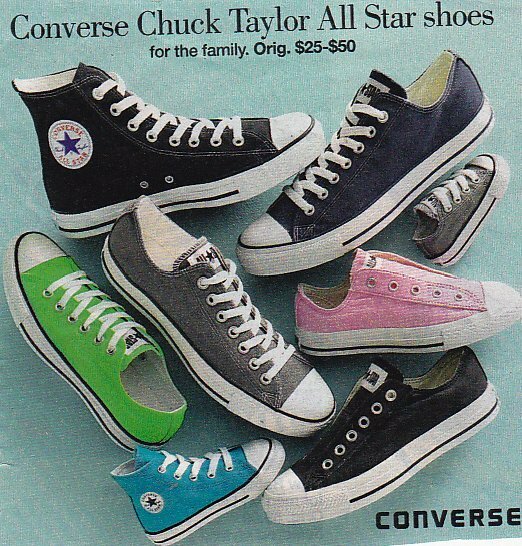 81 Ads for Chuck Taylor Shoes Core color low cut and high top chucks, and charcoal and neon green mid high. 82 Ads for Chuck Taylor Shoes Top views of core Chuck Taylor canvas ox low cuts. 83 Ads for Chuck Taylor Shoes Front view of core Chuck Taylor oxfords. 84 Ads for Chuck Taylor Shoes Top view of core low cut chucks and outside views of core high tops. 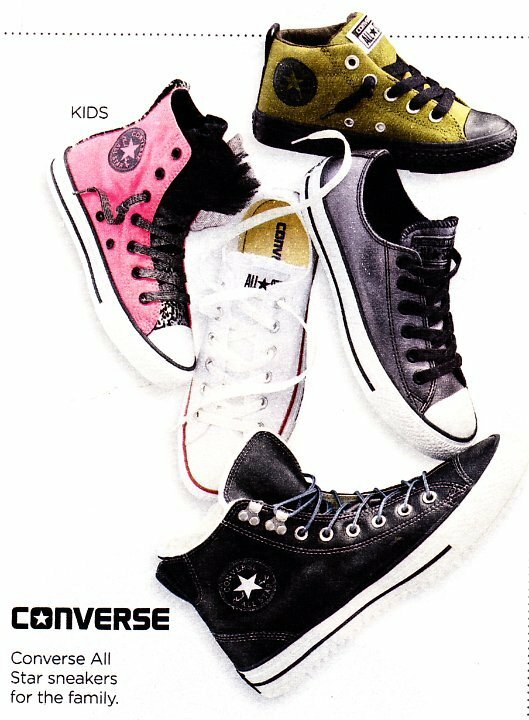 85 Ads for Chuck Taylor Shoes Ad for youth model black high top, black and olive camouflage high top, and black low cut chucks. 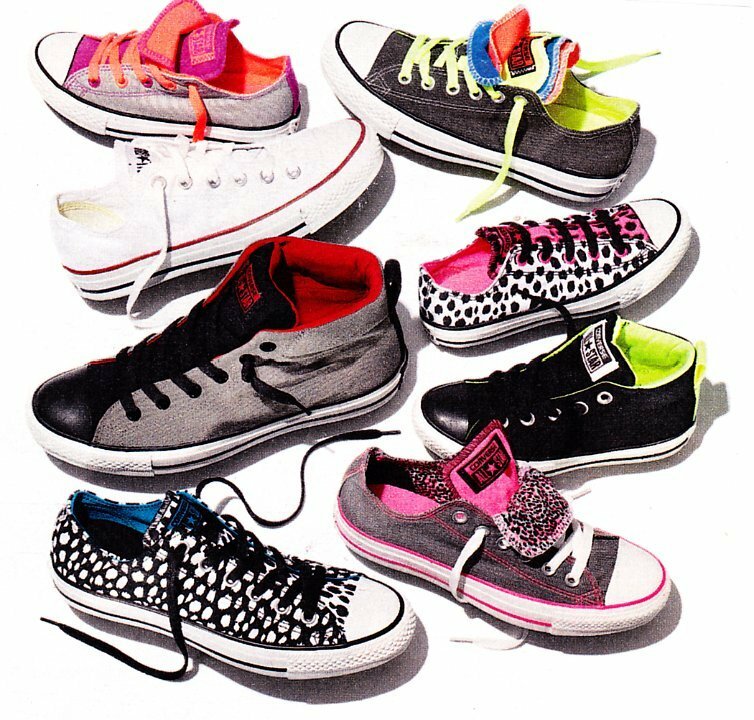 86 Ads for Chuck Taylor Shoes Ad with mostly print pattern chucks for kids. 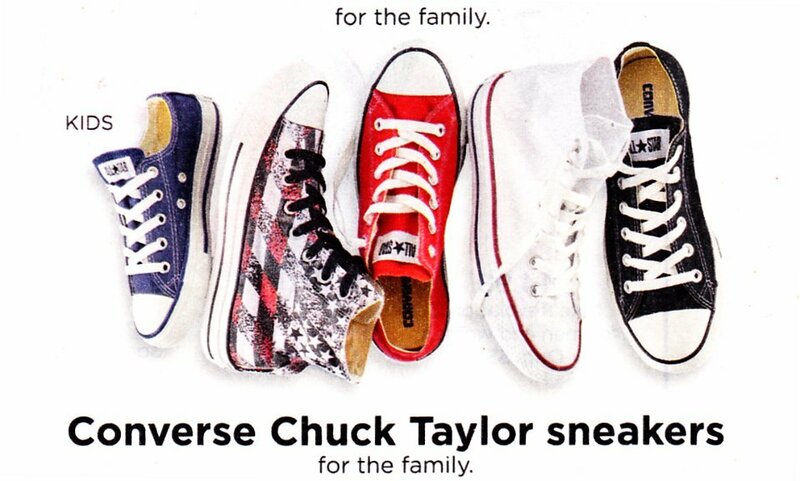 87 Ads for Chuck Taylor Shoes A selection of core and seasonal models for the family. 88 Ads for Chuck Taylor Shoes Ad shwoing seasonal low cut and high top chucks. 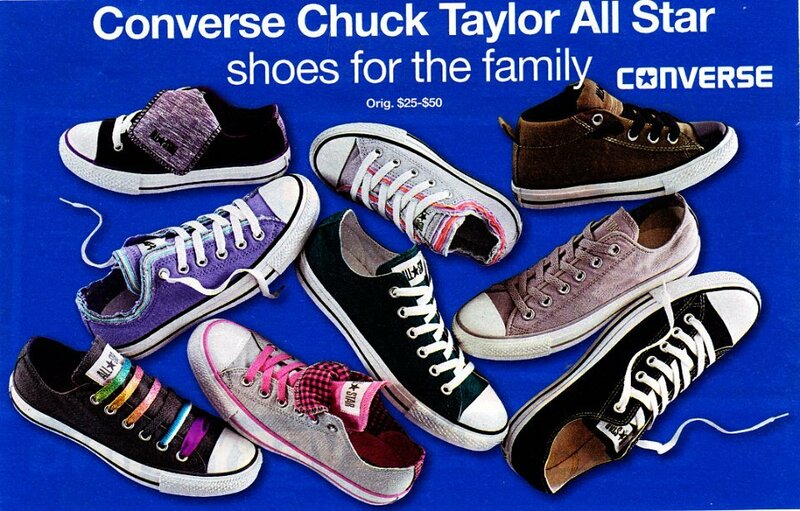 89 Ads for Chuck Taylor Shoes Ad showing mostly seasonal models of chucks. 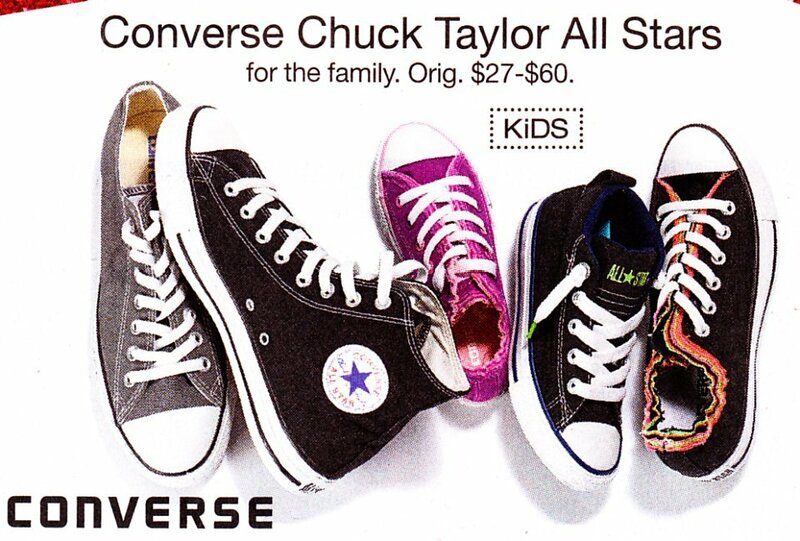 90 Ads for Chuck Taylor Shoes Chucks for kids plus core models for the entire family. 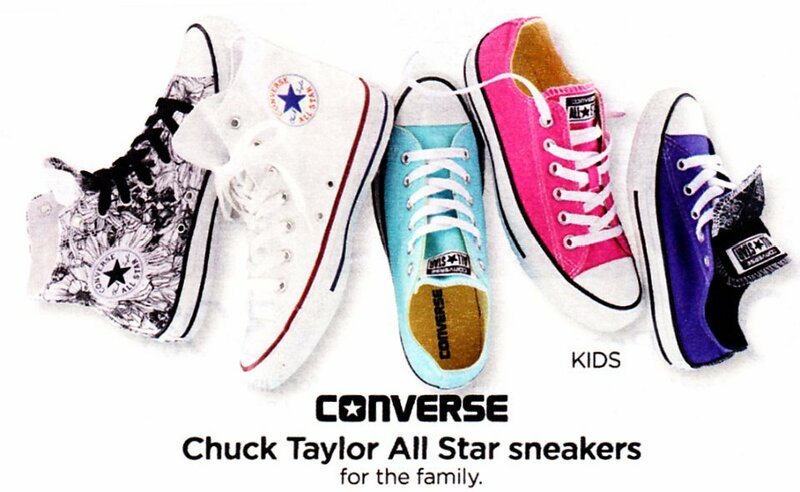 91 Ads for Chuck Taylor Shoes Print upper chucks for adults plus double upper chucks for kids. 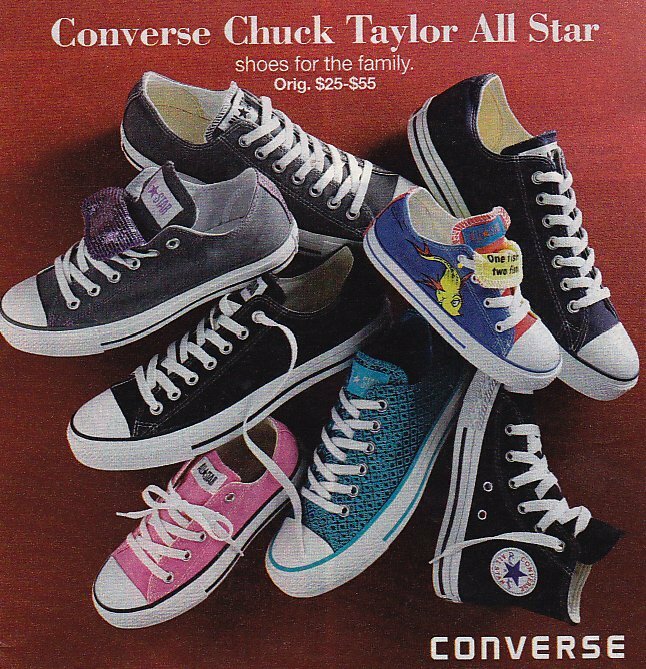 92 Ads for Chuck Taylor Shoes Popular high top and low cut models of chucks. 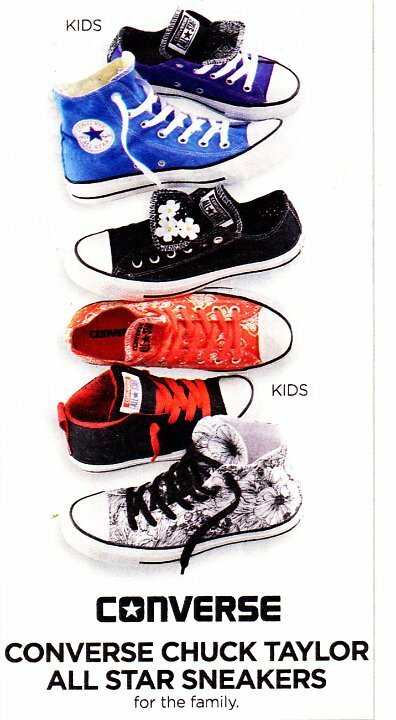 93 Ads for Chuck Taylor Shoes Selection of mid and low cut chucks for kids. 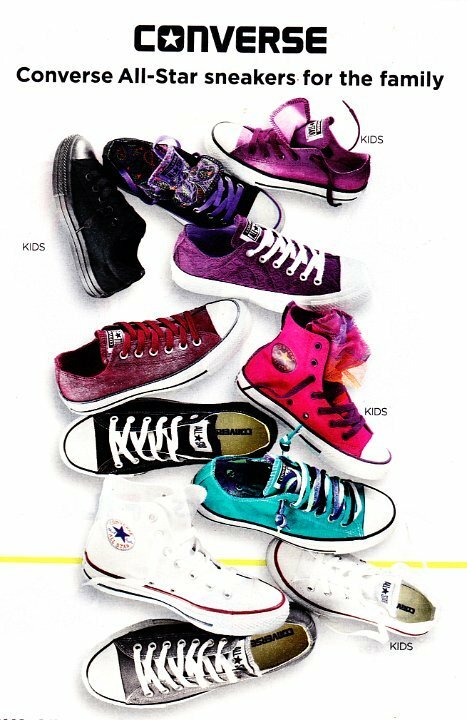 94 Ads for Chuck Taylor Shoes Several core color low cut chucks along with zipper, multi-tongue, and print pattern chucks for kids. 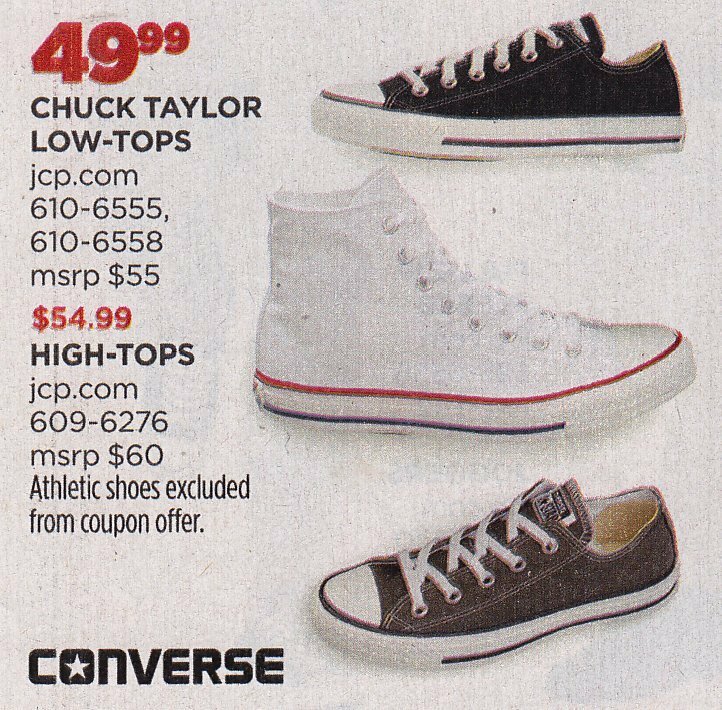 95 Ads for Chuck Taylor Shoes Black high top and a variety of core and seasonal low cuts. 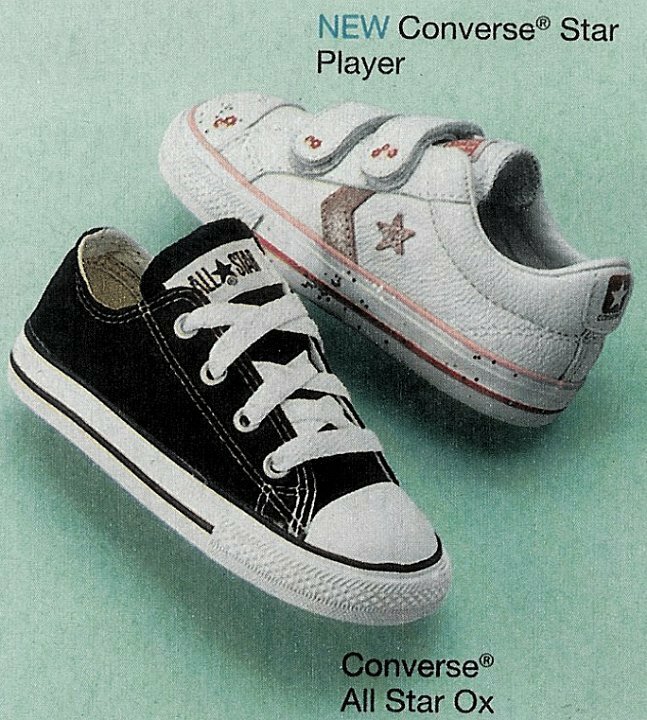 96 Ads for Chuck Taylor Shoes Ad showing mens black low cut, mens black and olive camouflage high top, black/olive camouflage and pink gingham high tops for toddlers, granny apple green and black and red slip ons for women. 97 Ads for Chuck Taylor Shoes Ad for low cut chucks. 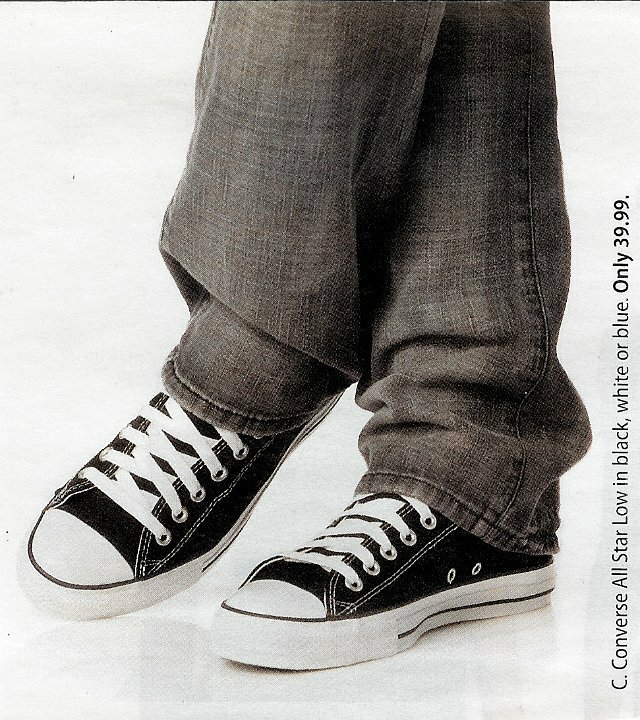 98 Ads for Chuck Taylor Shoes Ad for a charcoal low cut. 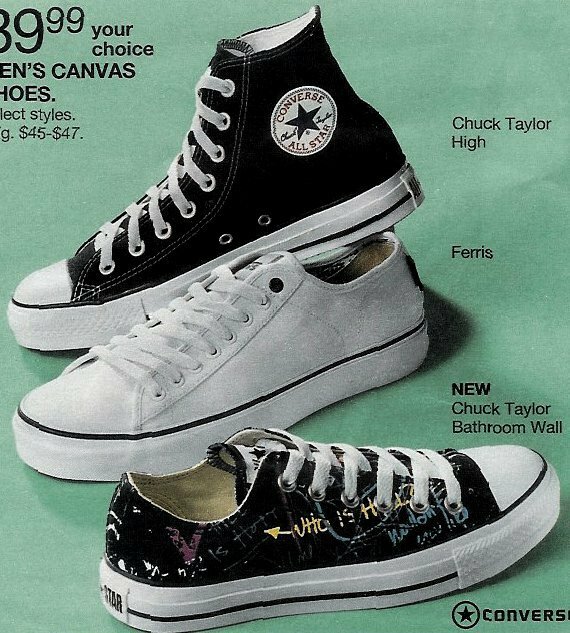 99 Ads for Chuck Taylor Shoes Ad for charcoal and black high top and low cut chucks. 100 Ads for Chuck Taylor Shoes Ad for low cut chucks. 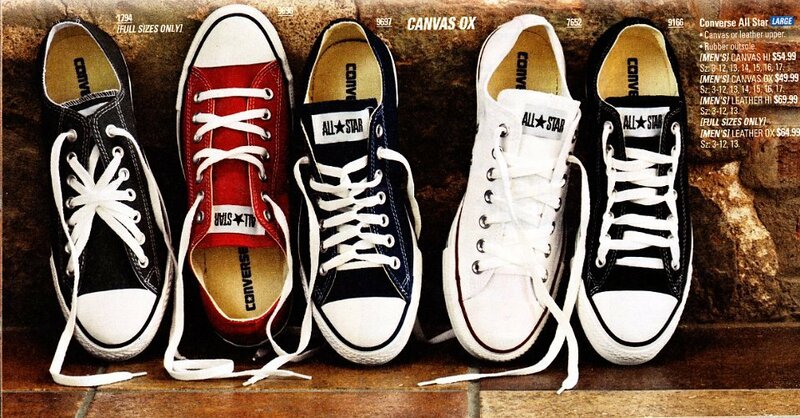 101 Ads for Chuck Taylor Shoes Ad showing optical white and classic black low cut chucks. 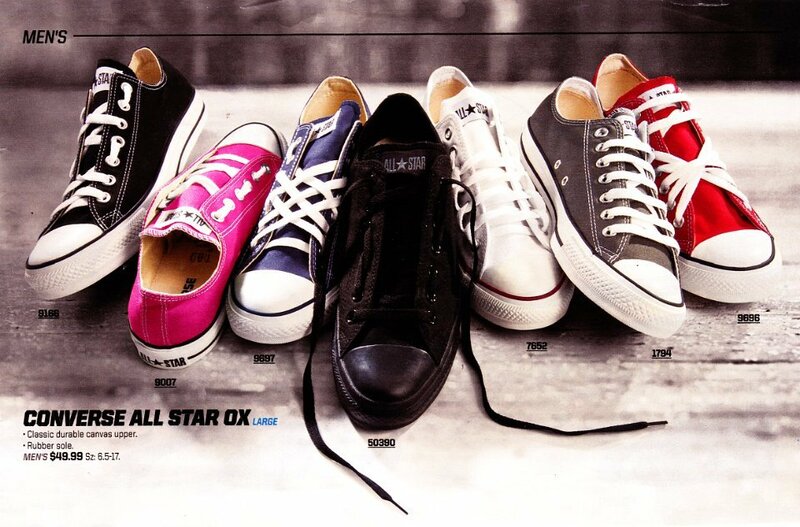 102 Ads for Chuck Taylor Shoes Ad showing raspberry, optical white, and black low cut chucks. 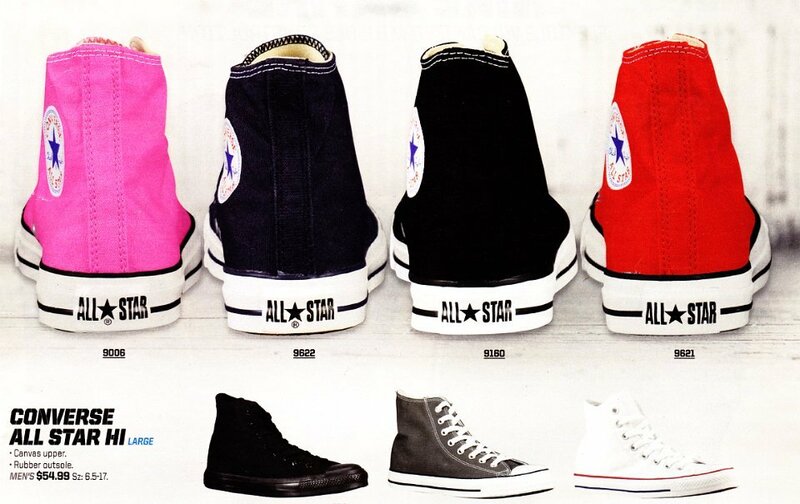 103 Ads for Chuck Taylor Shoes Core black high, with blue, charocal, optical white, pink, red, and charocal double-tongue low cut. 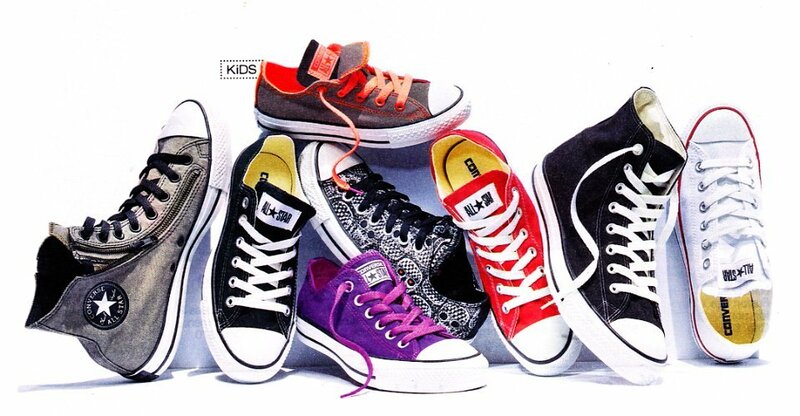 104 Ads for Chuck Taylor Shoes A few core chucks and some seasonal models for kids and women. 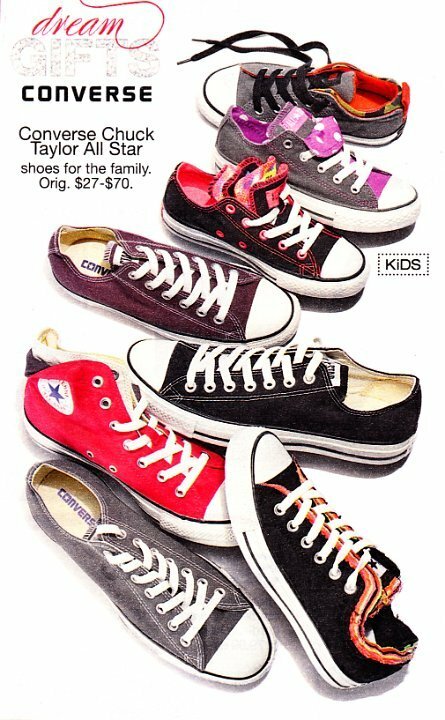 105 Ads for Chuck Taylor Shoes Black high tops, red and optical white low cuts, and some seasonal models. 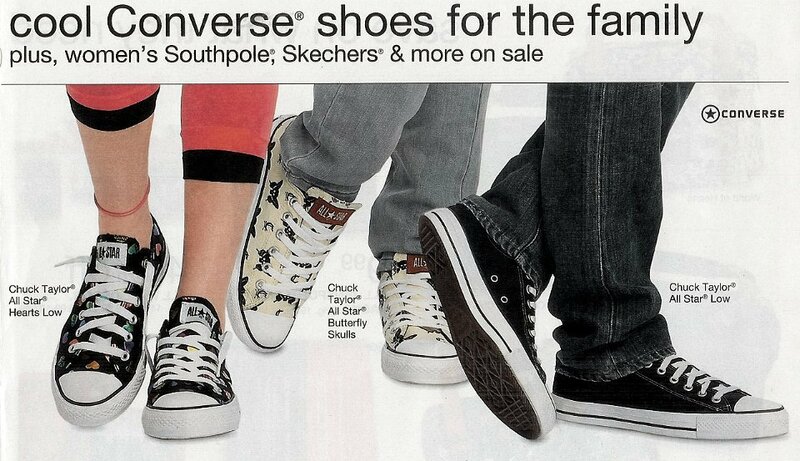 106 Ads for Chuck Taylor Shoes Ad with seasonal print models and core chucks. 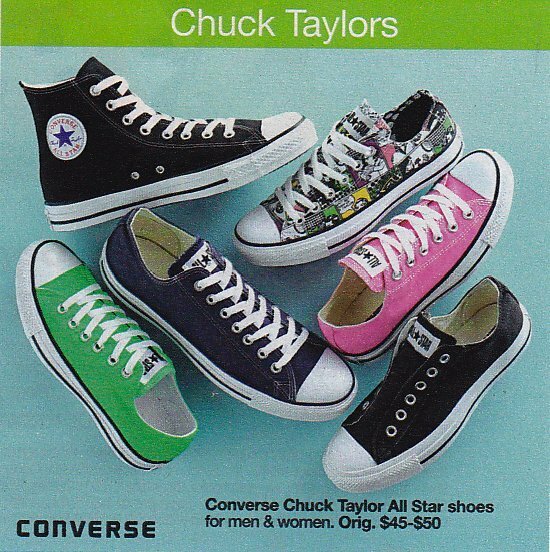 107 Ads for Chuck Taylor Shoes Ad for womens brown and pink 2-tone high tops and jade green low cut chucks. 108 Ads for Chuck Taylor Shoes Ad for low cut chucks. 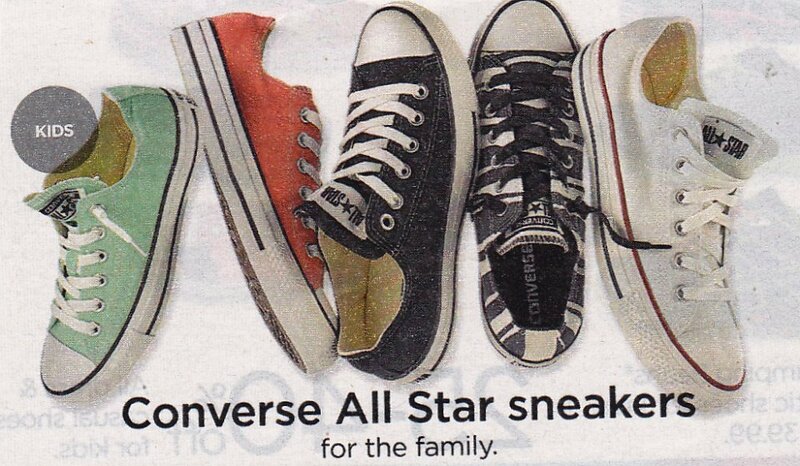 109 Ads for Chuck Taylor Shoes Family ad with a selection of core chucks and a lot of seasonal issues. 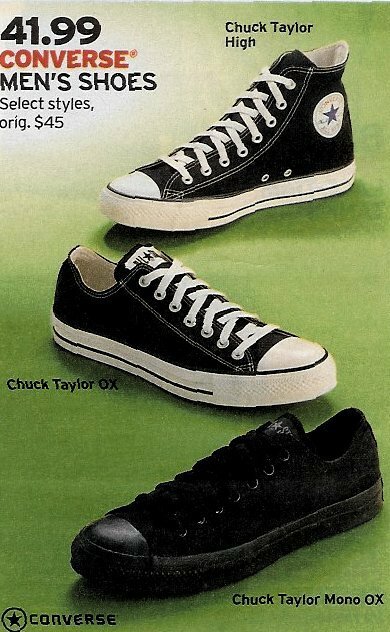 110 Ads for Chuck Taylor Shoes Ad showing black low cut, black double tongue, and black and royal mid high. 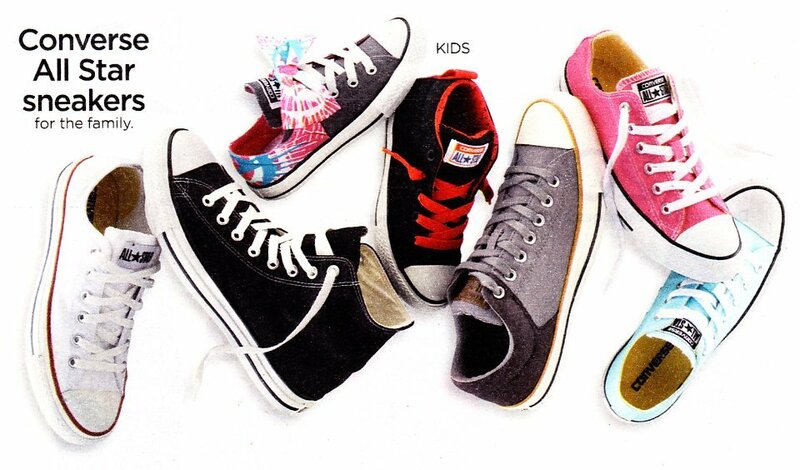 111 Ads for Chuck Taylor Shoes Ad with mostly seasonal models for kids. 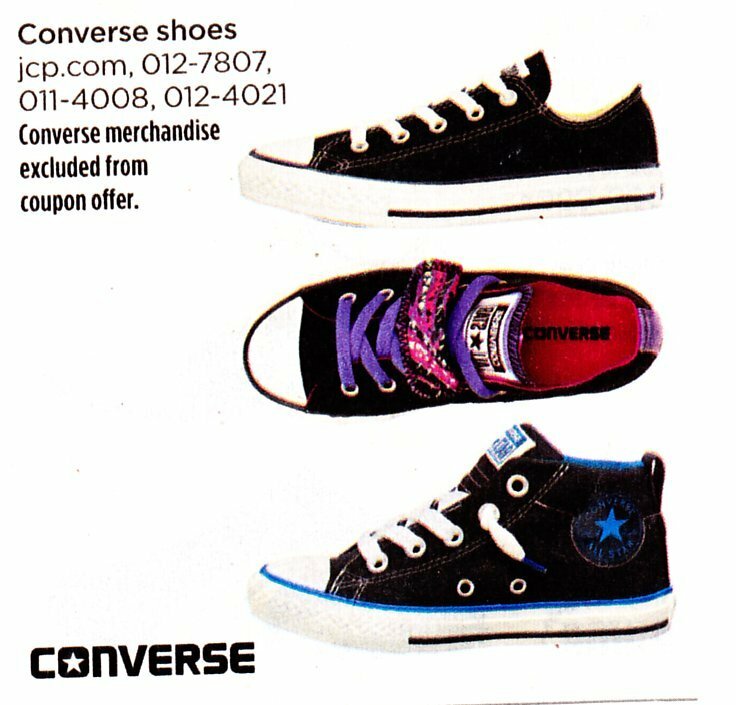 112 Ads for Chuck Taylor Shoes Black low cut, mid high, and high top chucks. 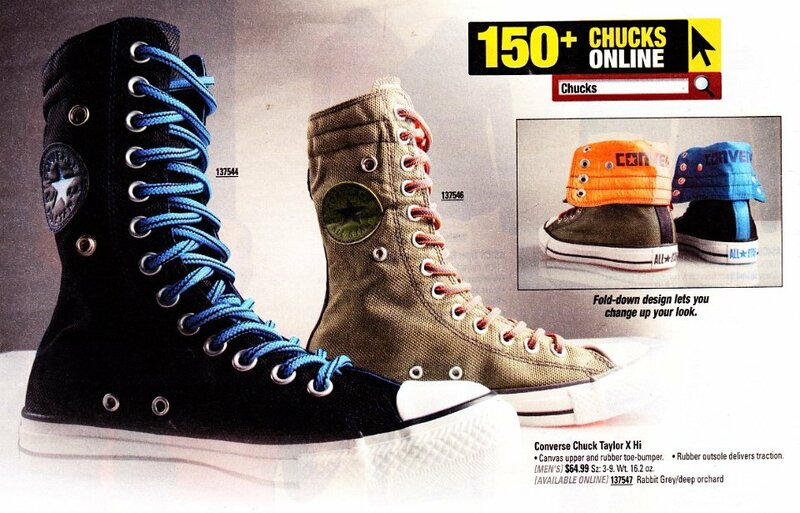 113 Ads for Chuck Taylor Shoes Seasonal models include double tongues and zip high top chucks. 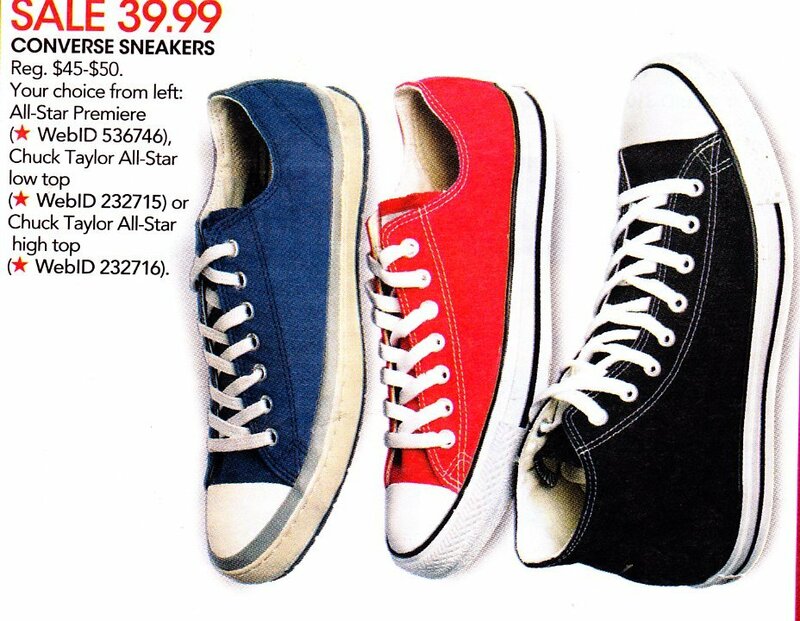 114 Ads for Chuck Taylor Shoes Ad showing a black and red static high top and the optical white core high top. 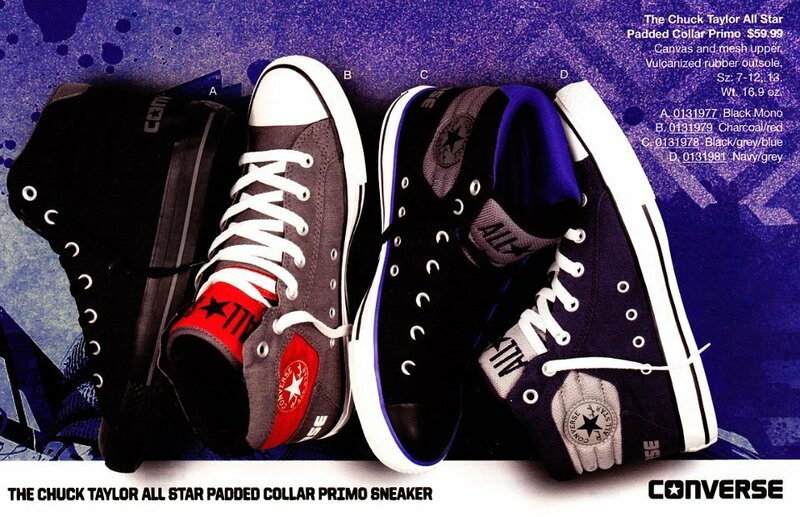 115 Ads for Chuck Taylor Shoes Ad showing front views of core low cut chucks. 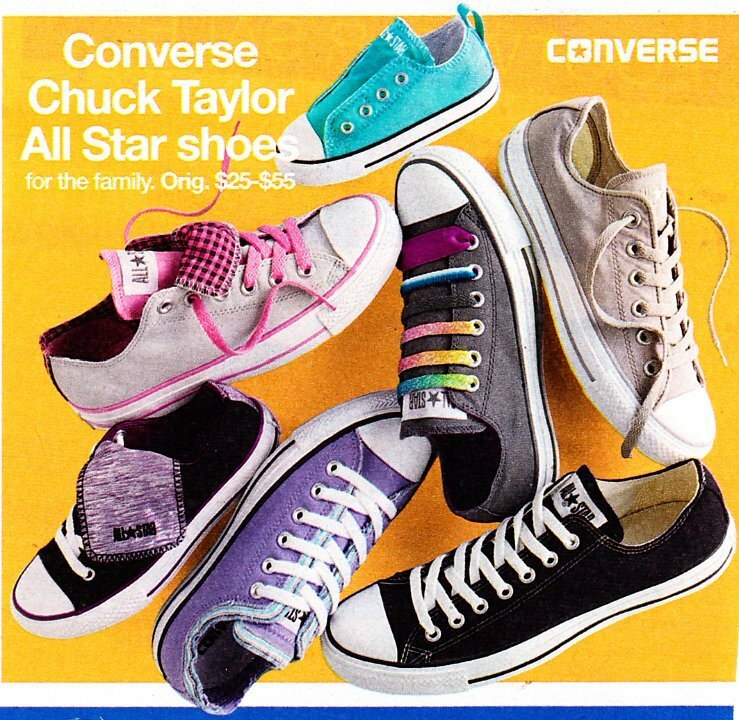 116 Ads for Chuck Taylor Shoes Ad for Chuck Taylor high tops. 117 Ads for Chuck Taylor Shoes Ad for red and black low cut chucks. 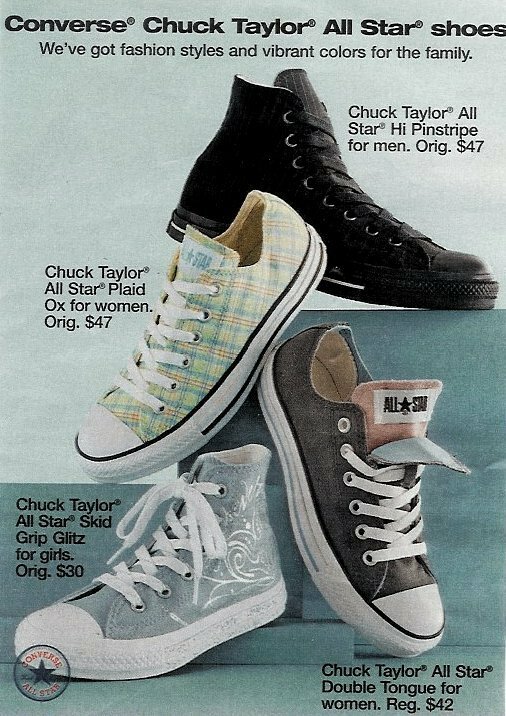 118 Ads for Chuck Taylor Shoes Ad for mens black high top and low cut, optical white low cut, and womens dot pattern low cut. 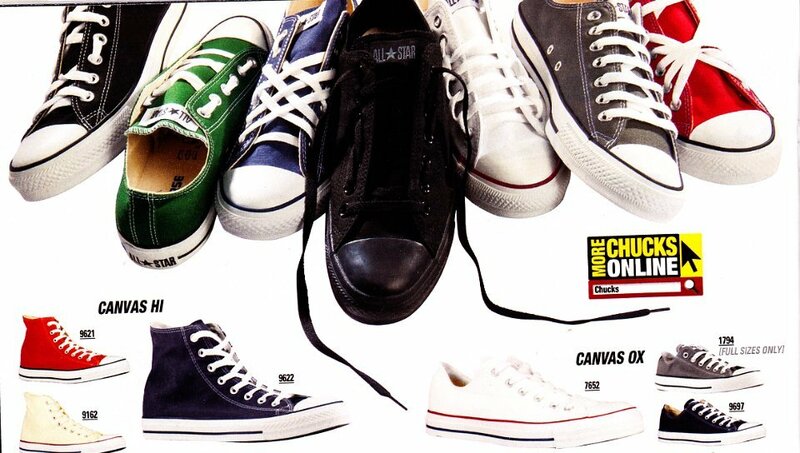 119 Ads for Chuck Taylor Shoes Ad showing outside views of core and seaonal chucks. 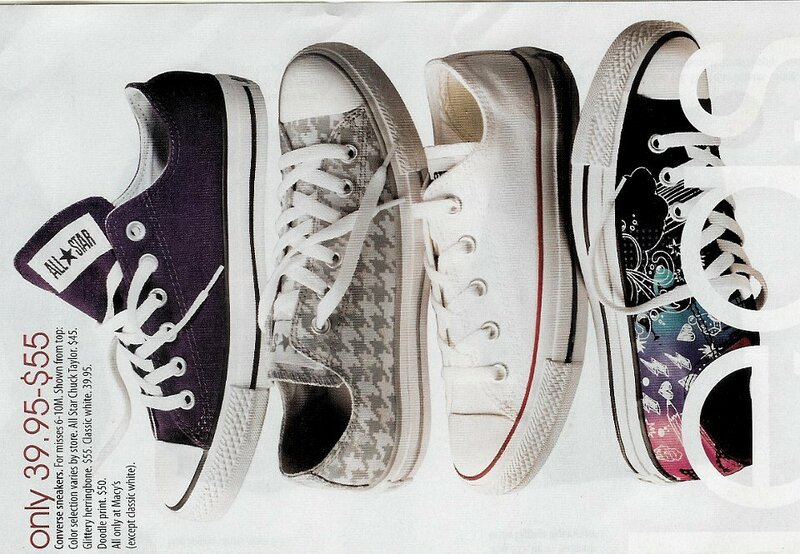 120 Ads for Chuck Taylor Shoes Ad featuring zip, print pattern, double tongue and mid high seasonal chucks. 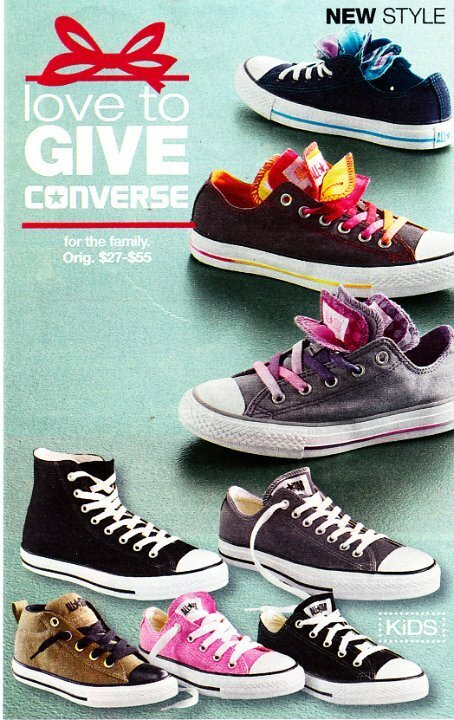 121 Ads for Chuck Taylor Shoes Low cut, double tongue, and foldover chucks for kids. 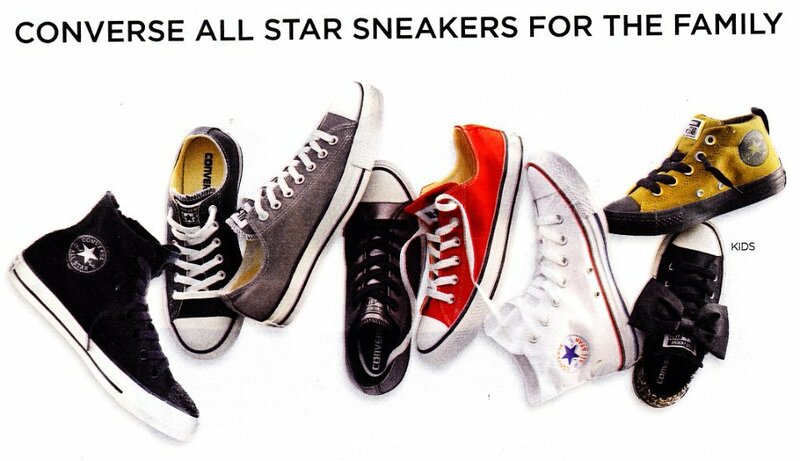 122 Ads for Chuck Taylor Shoes Ad showing seasonal high tops and core low cut chucks. 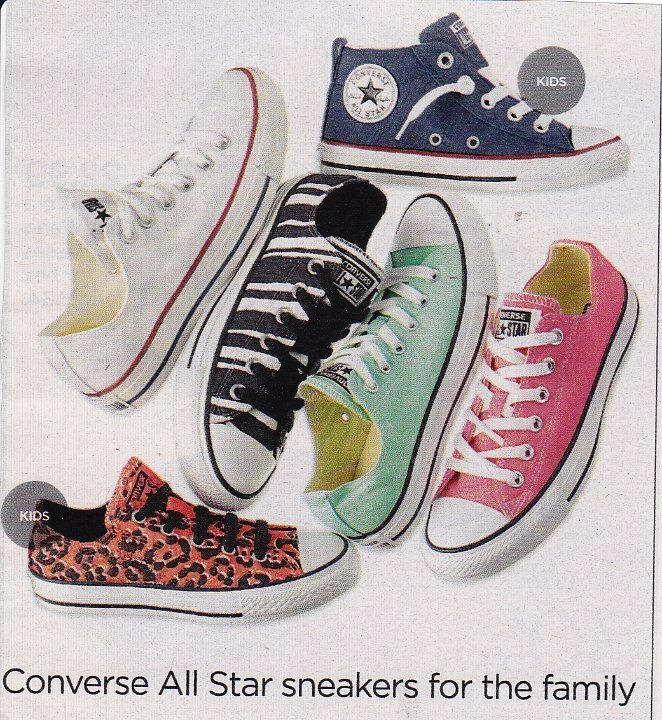 123 Ads for Chuck Taylor Shoes Seasonal models of chucks plus the optical white low cut. 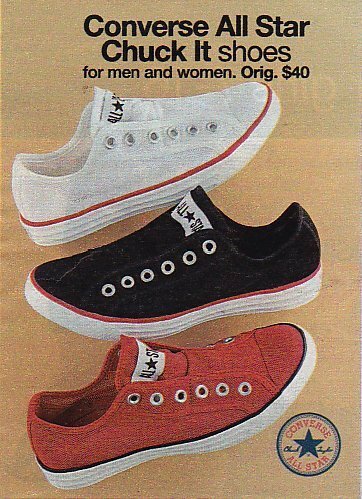 124 Ads for Chuck Taylor Shoes Ad showing red, charcoal, and black low cuts, optical white high tops, and seasonal mid and high top chucks. 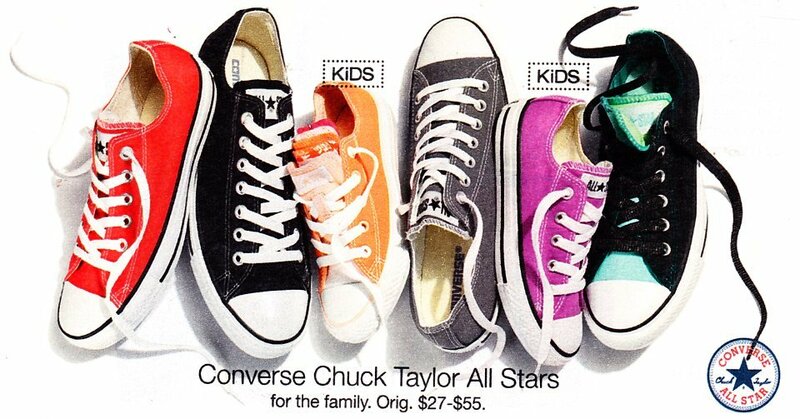 125 Ads for Chuck Taylor Shoes Ad showing core and seasonal chucks. 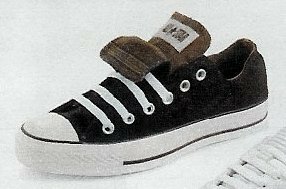 126 Ads for Chuck Taylor Shoes Angled top view of core low cut chucks with unusual lacings. 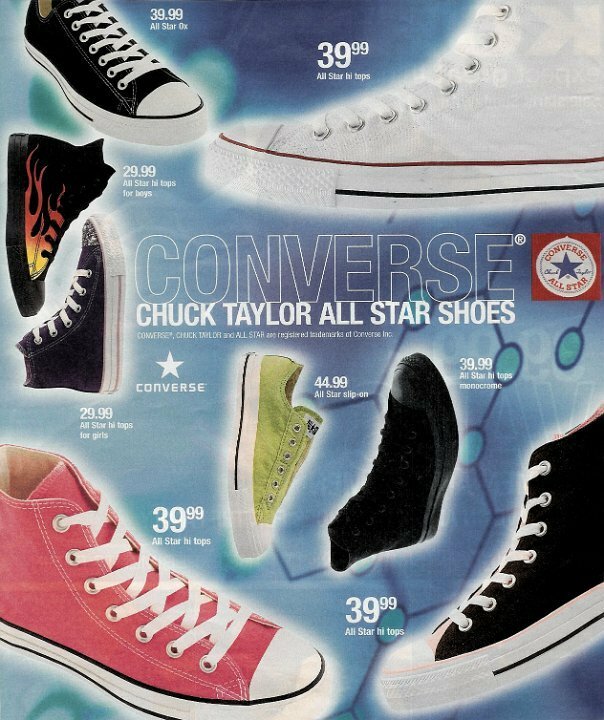 127 Ads for Chuck Taylor Shoes Catalog page showing a selection of high top chucks. 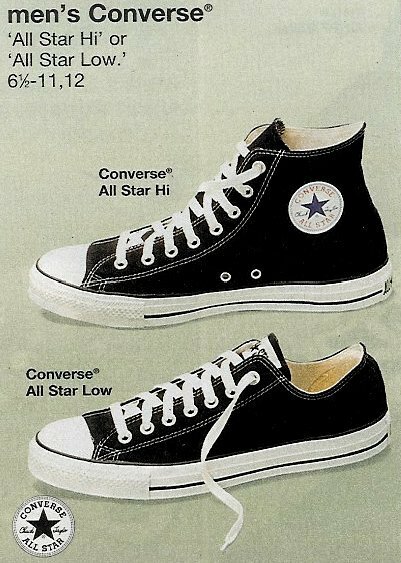 128 Ads for Chuck Taylor Shoes Ad for black high top and low cut chucks. 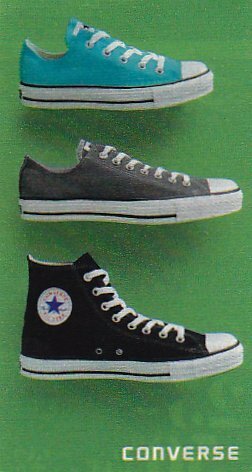 129 Ads for Chuck Taylor Shoes Classic core high tops in black and optical white, navy low cut, and several seasonal models. 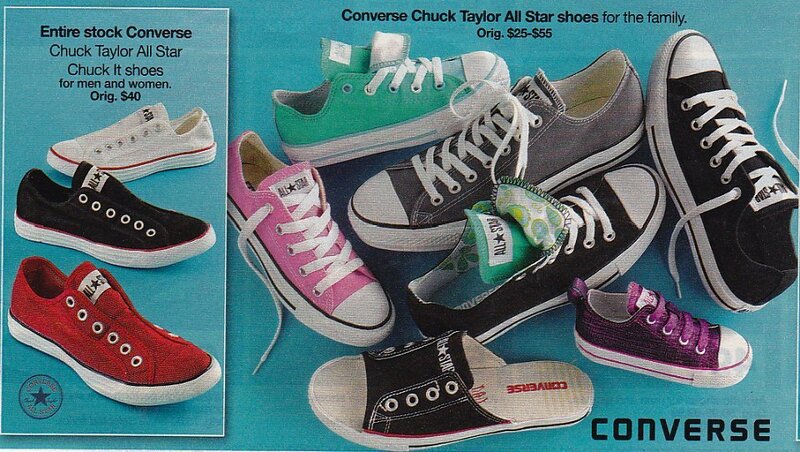 130 Ads for Chuck Taylor Shoes Catalog page showing low cut chucks. 131 Ads for Chuck Taylor Shoes Front view of high top chucks. 132 Ads for Chuck Taylor Shoes Rear view of core color chucks. 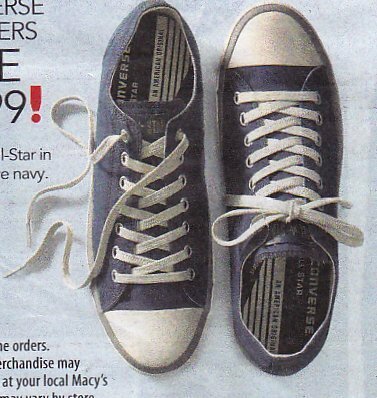 133 Ads for Chuck Taylor Shoes Read view of core low cut chucks. 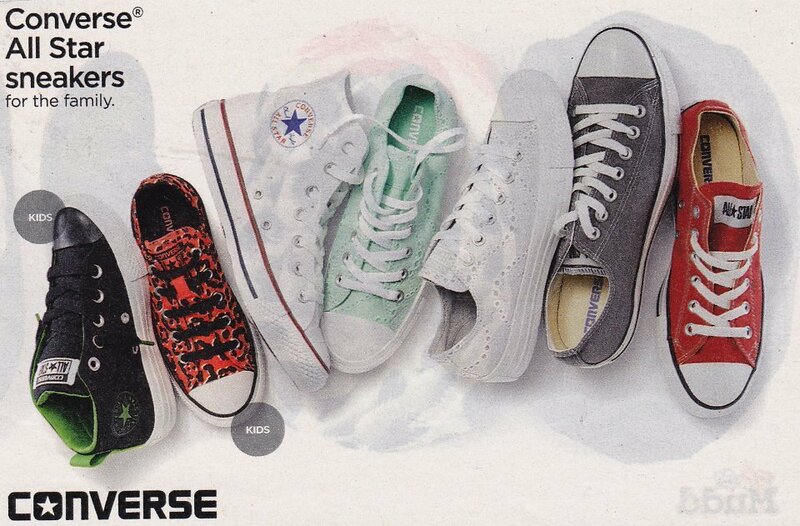 134 Ads for Chuck Taylor Shoes Core optical white low, core black high, and a selection of seasonal chucks. 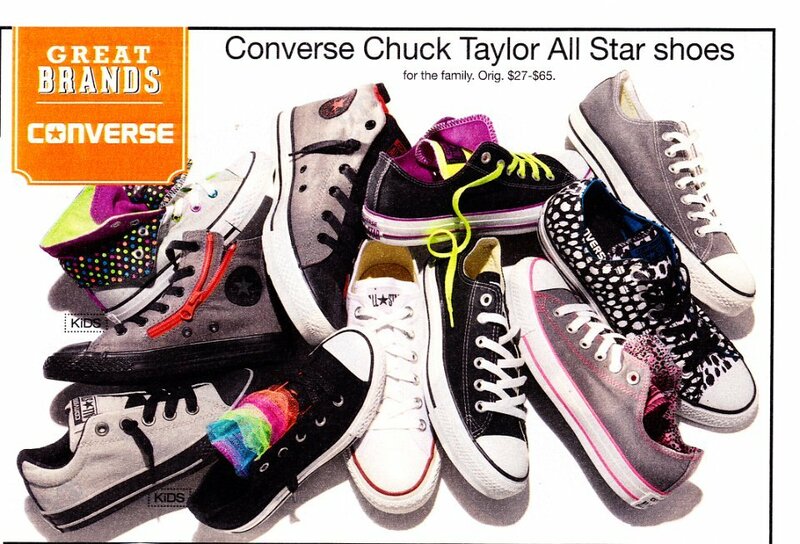 135 Ads for Chuck Taylor Shoes Ad featuring mostly seasonal chucks. 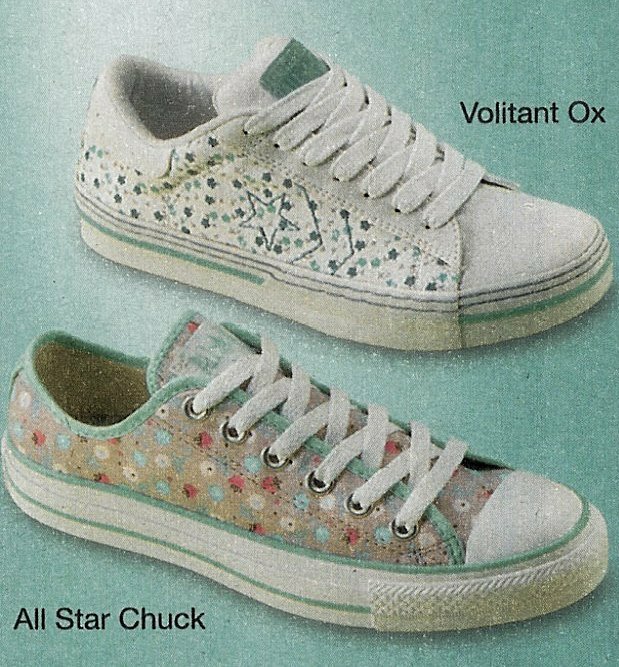 136 Ads for Chuck Taylor Shoes Double tongue, zipper, and print pattern seasonal models. 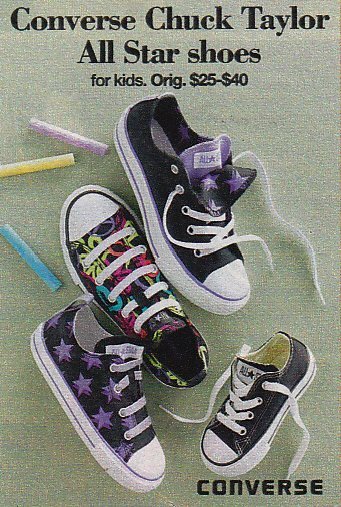 137 Ads for Chuck Taylor Shoes Print pattern and optical white high tops, turquoise, raspberry low cut, and purple double tongue. 138 Ads for Chuck Taylor Shoes Another view of the previous ad. 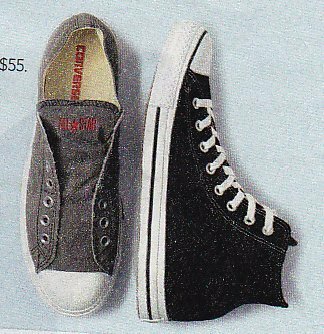 139 Ads for Chuck Taylor Shoes Ad for mens simple details black high top and black low cut. 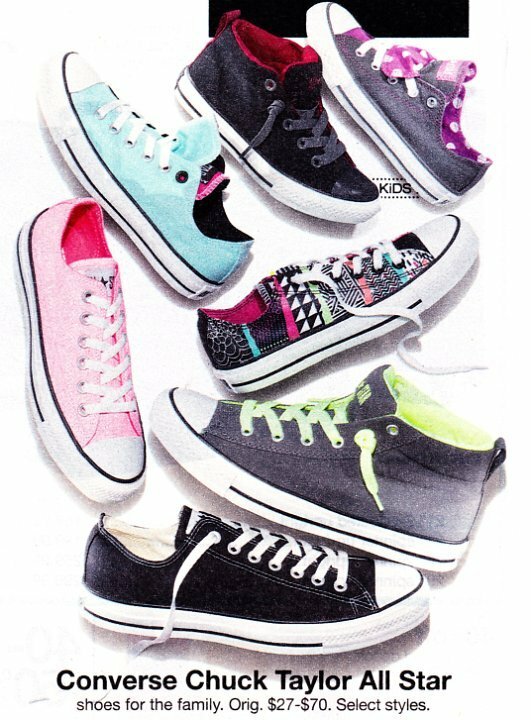 140 Ads for Chuck Taylor Shoes Print pattern and optical white high tops, turquoise, raspberry low cut, and purple double tongue. 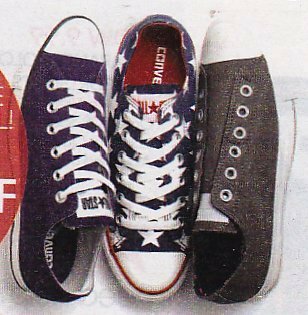 141 Ads for Chuck Taylor Shoes Ad with purple low, flag print high, red low, optical white high top, and black low cut chucks. 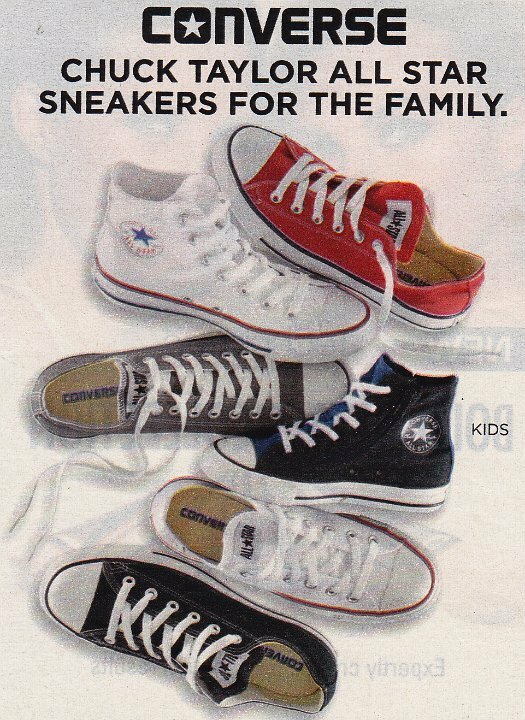 142 Ads for Chuck Taylor Shoes Optical white high and low, charcoal, black, and red low, and black and blue 2-tone for kids. 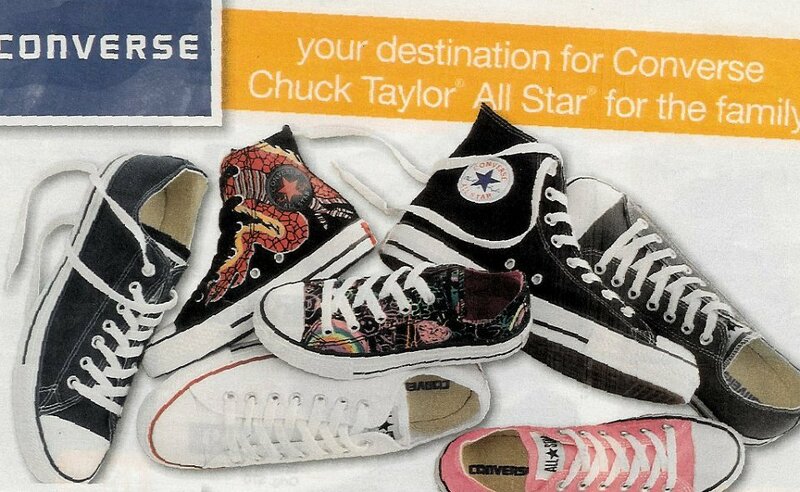 143 Ads for Chuck Taylor Shoes Selection of seasonal high top and low cut chucks. 144 Ads for Chuck Taylor Shoes Mostly seasonal models of chucks. 145 Ads for Chuck Taylor Shoes Another view of the previous ad. 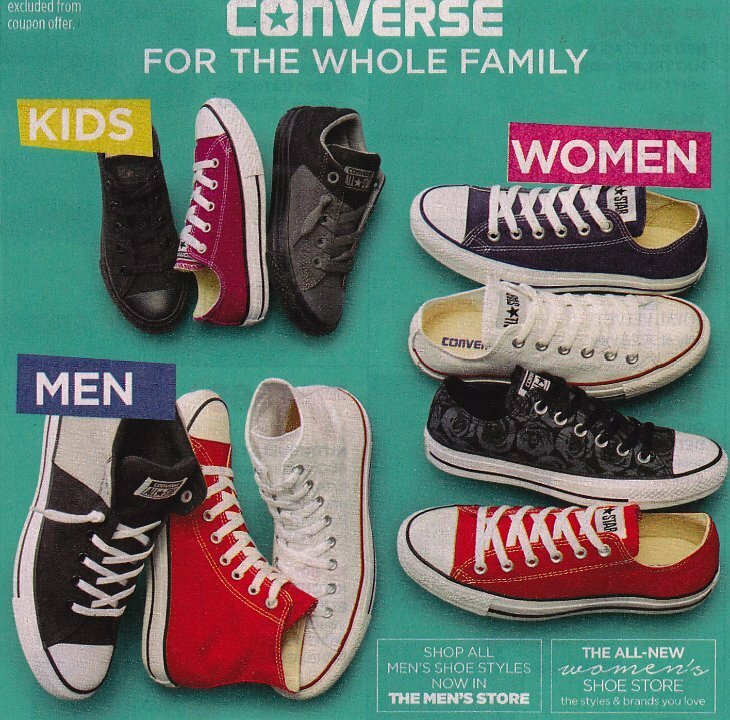 146 Ads for Chuck Taylor Shoes Selection of high tops for me, low cuts for women, and low cuts for kids. 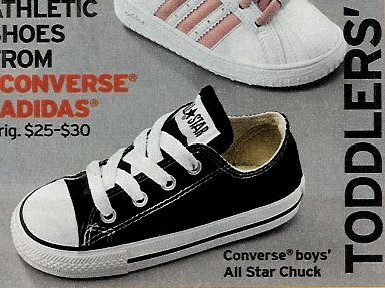 147 Ads for Chuck Taylor Shoes Ad showing black and charcoal low cuts and optical white high tops. 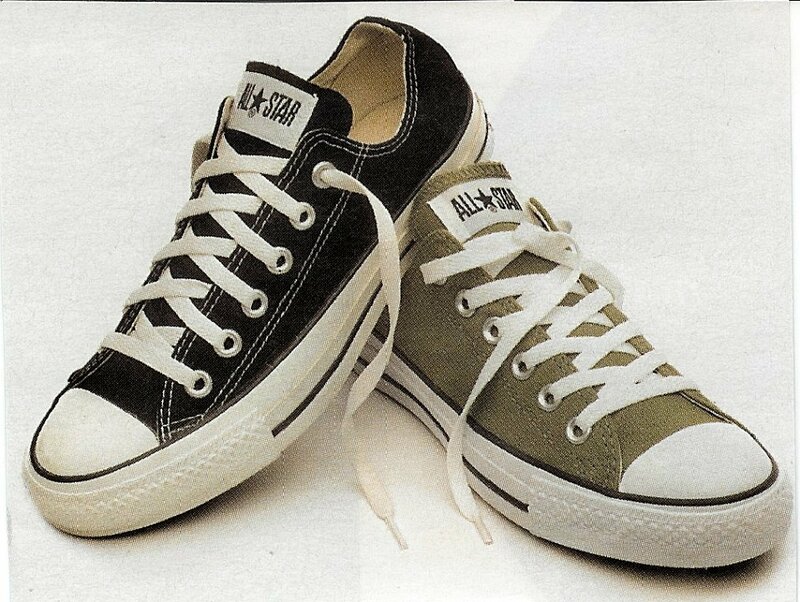 148 Ads for Chuck Taylor Shoes Ad for black and bog green low cut chucks. 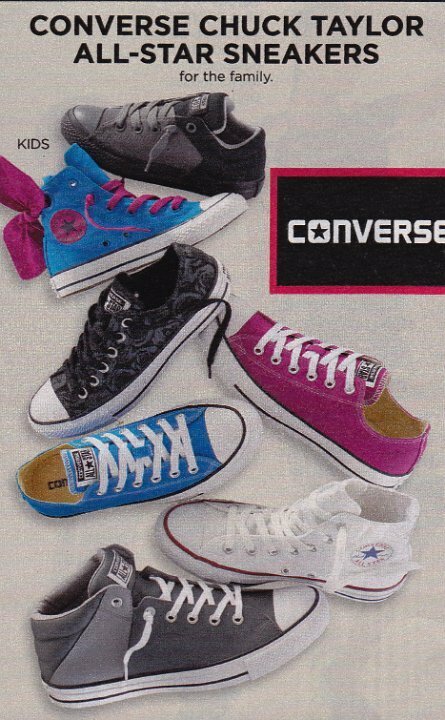 149 Ads for Chuck Taylor Shoes Chucks for kids in gray, black, maroon, and charcoal, blue and pink double tongue. 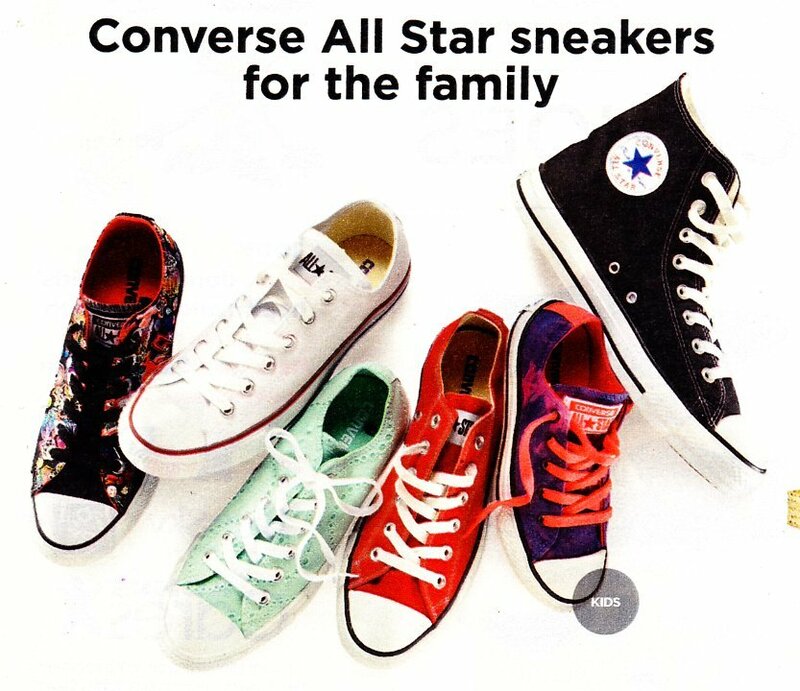 150 Ads for Chuck Taylor Shoes Selection of seasonal chucks for the family. 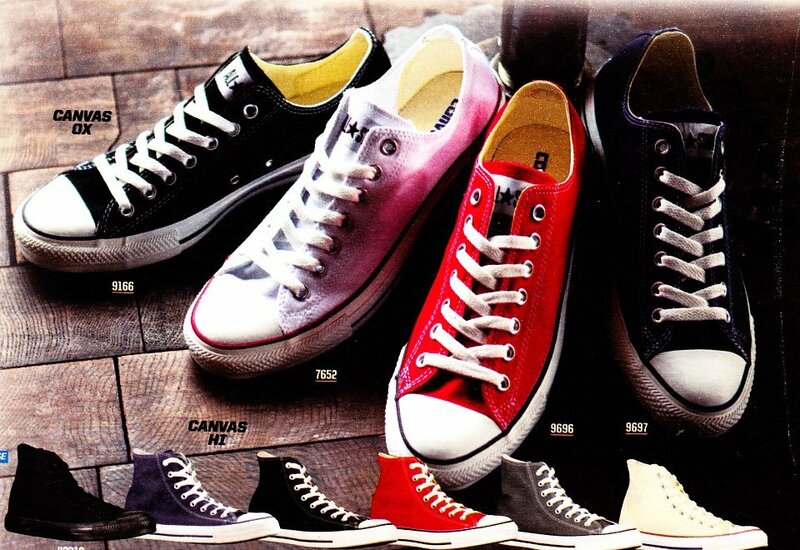 151 Ads for Chuck Taylor Shoes Ad for hibiscus low cut, white, blue and black double tongue low, and black high top. 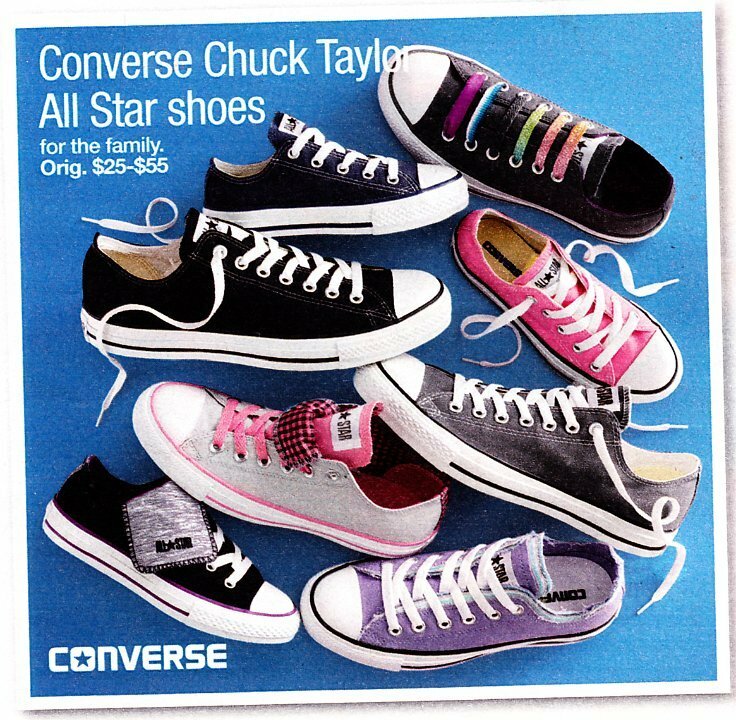 152 Ads for Chuck Taylor Shoes Ads for camouflage, pink, black, hearts high tops, and black low cut. 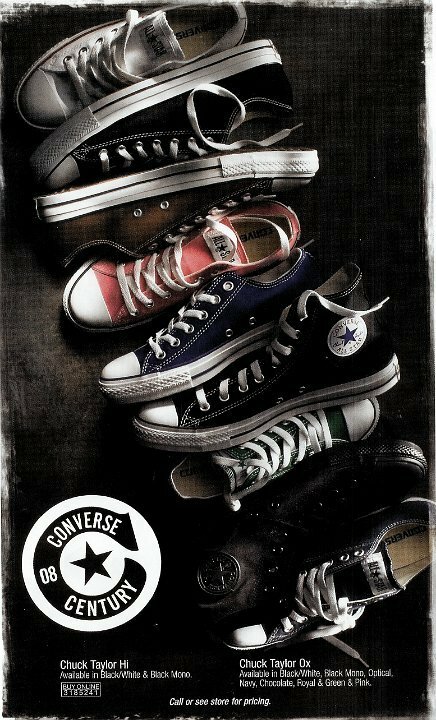 153 Ads for Chuck Taylor Shoes Ad for low cut double tongue chucks and black high top chucks. 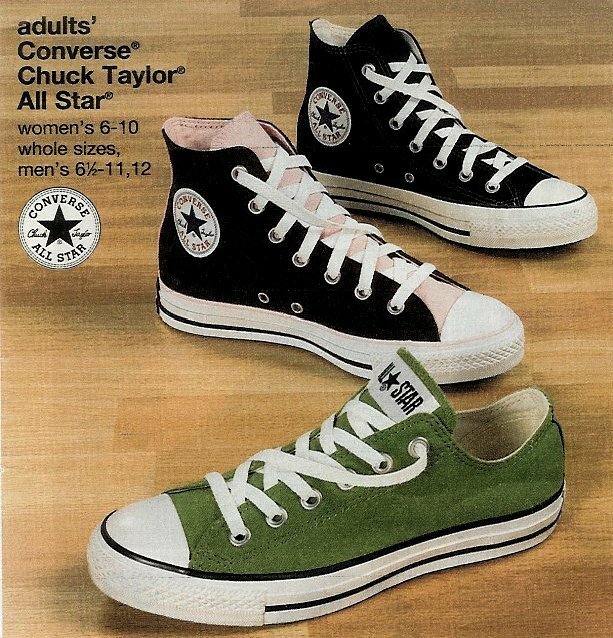 154 Ads for Chuck Taylor Shoes Ad for black and pink 2 tone high top, and green low cut. 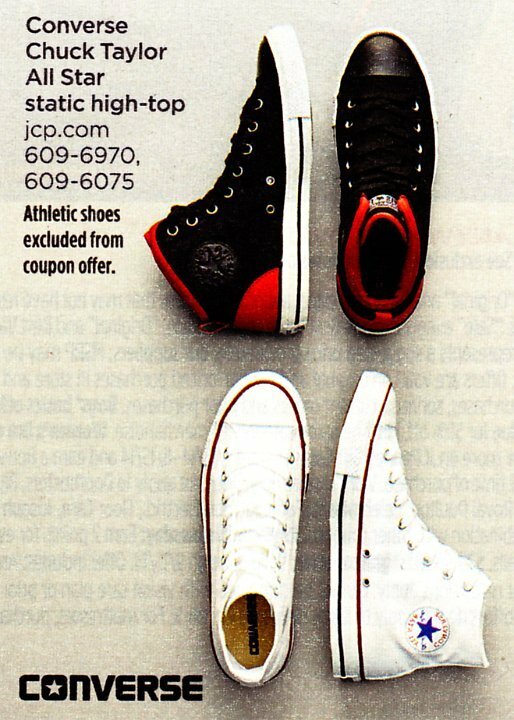 155 Ads for Chuck Taylor Shoes Ad for black, red, and gray double tongue high tops. 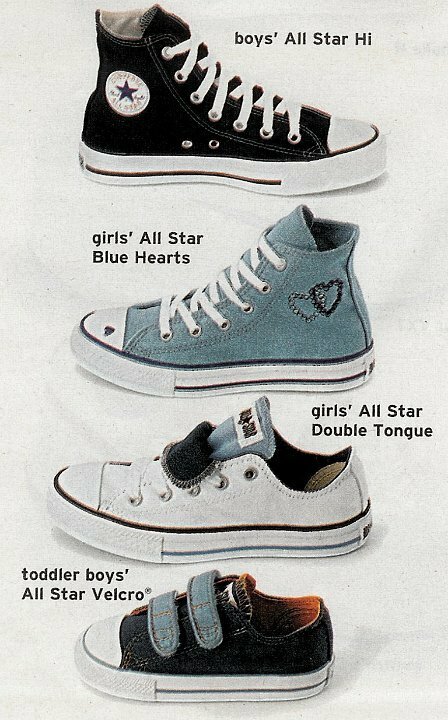 156 Ads for Chuck Taylor Shoes Ad for kids chucks, including the black high top, blue hearts high top, low cut white, blue and black double tongue, and toddlers velcro low cut. 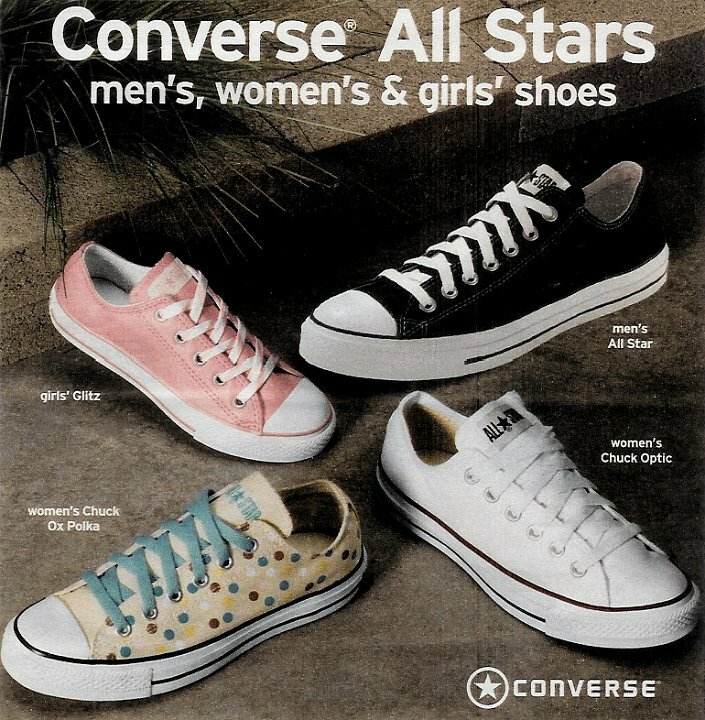 157 Ads for Chuck Taylor Shoes Ad for womens Converse, including the polka dots low cut, black double time low cut, red skimmer, and opical white low cut. 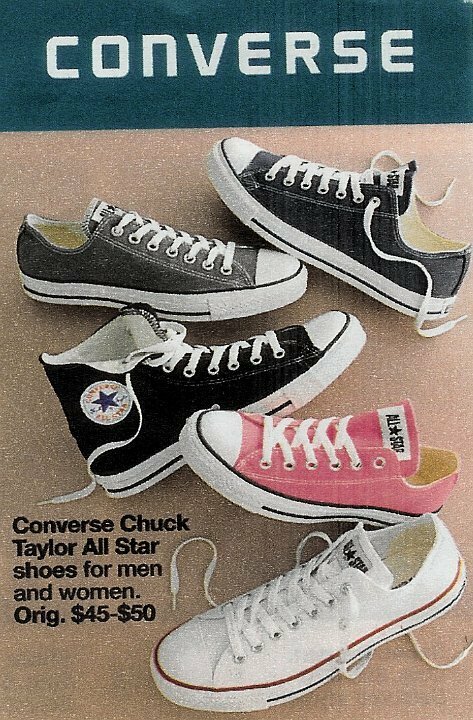 158 Ads for Chuck Taylor Shoes Ad for black high top and low cut, with a black, blue, and pink double tongue low cut. 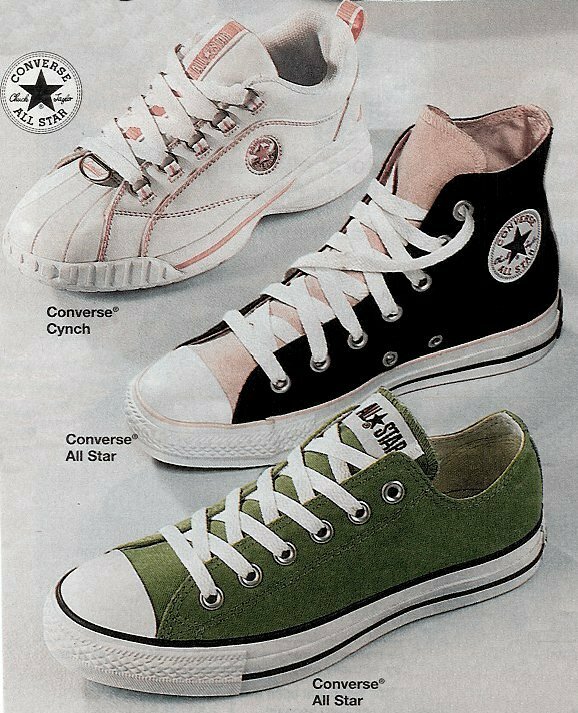 159 Ads for Chuck Taylor Shoes Ad for black high top, monochrome black low cut, and white and green low cuts. 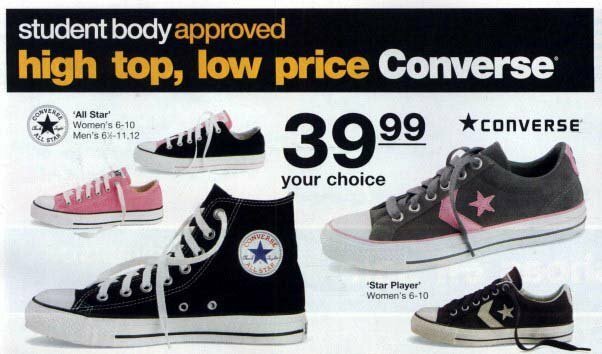 160 Ads for Chuck Taylor Shoes Ad for boys black high top and low cut, girls black, hearts high top, and pink low cut. 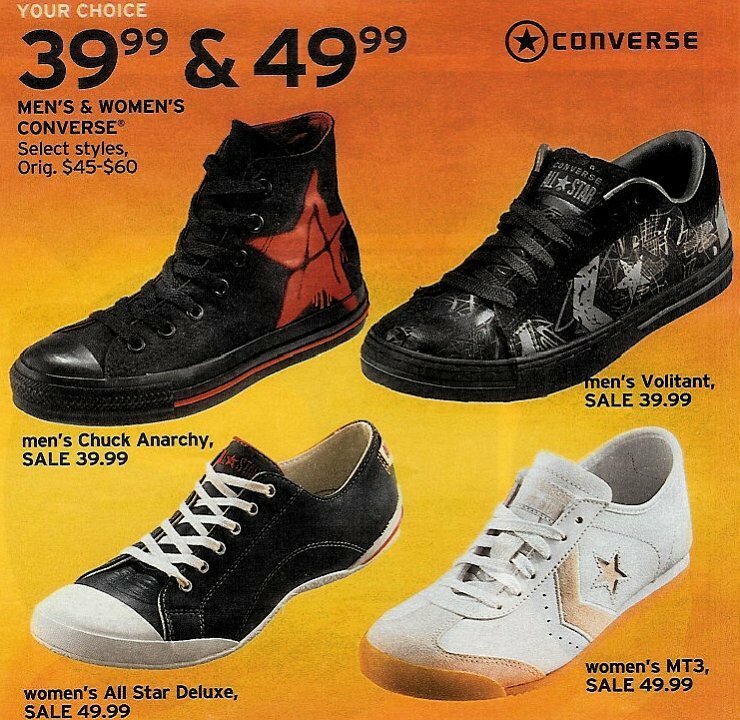 161 Ads for Chuck Taylor Shoes Ad for black and red anarchy high top and some other Converse models. 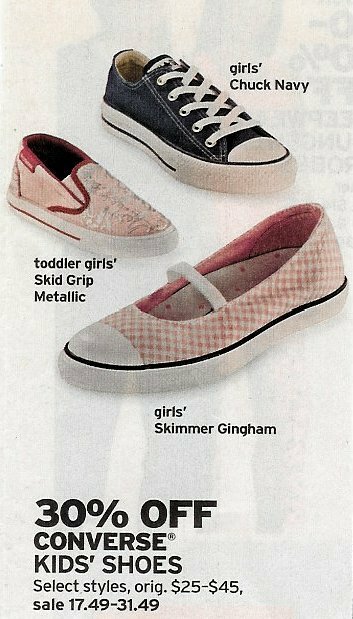 162 Ads for Chuck Taylor Shoes Ad for black pinstripe hi top, plaid low cut, double tongue low and skid grip glitz hi top for girls. 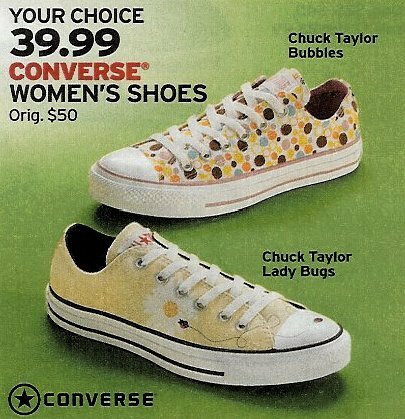 163 Ads for Chuck Taylor Shoes Ad for women's low cut pattern chucks. 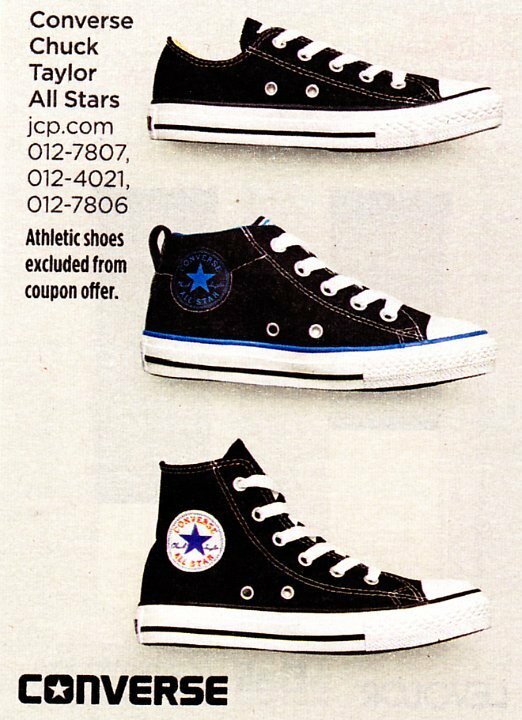 164 Ads for Chuck Taylor Shoes Ad for core black high top and low cut chucks. 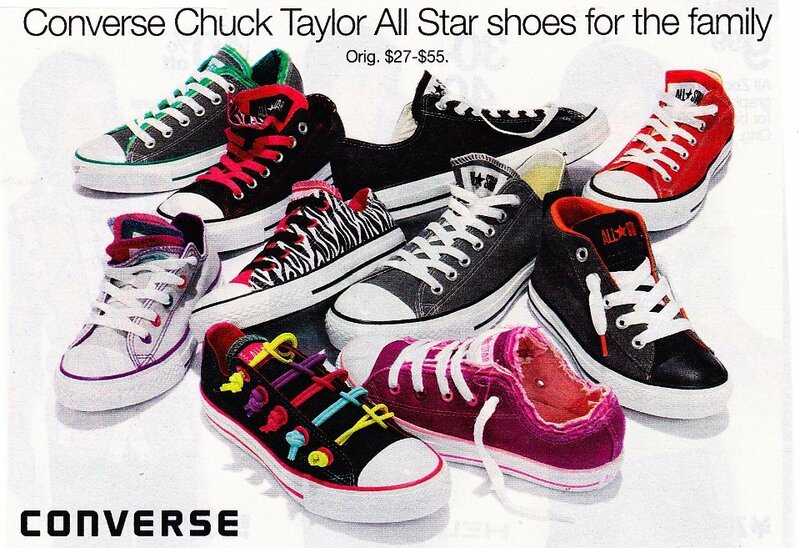 165 Ads for Chuck Taylor Shoes Ad for Converse kids shoes. 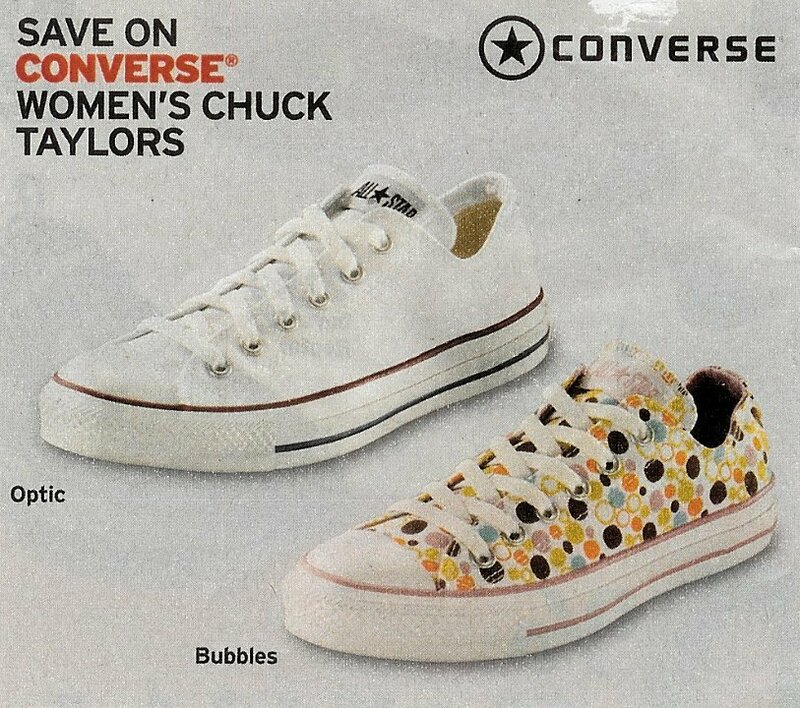 166 Ads for Chuck Taylor Shoes Ad for optical white and bubbles low cut chucks. 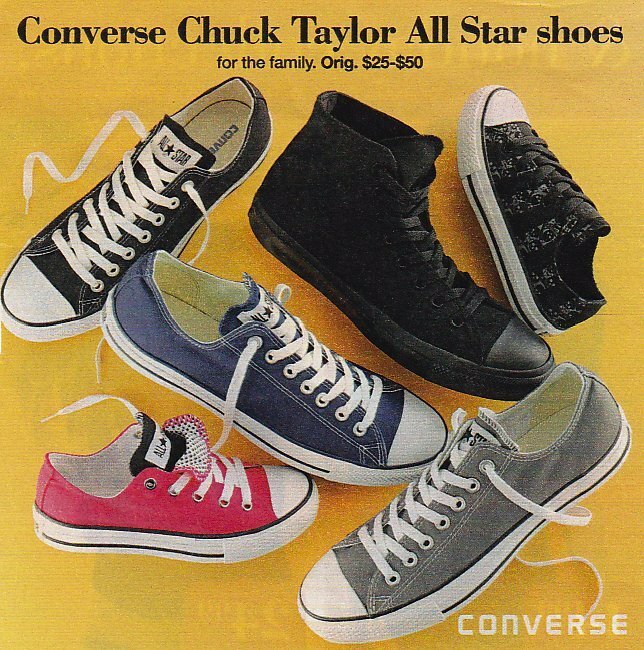 167 Ads for Chuck Taylor Shoes Ad for black high top, black slip on, and various low cut chucks. 168 Ads for Chuck Taylor Shoes Ad for black low cut chucks. 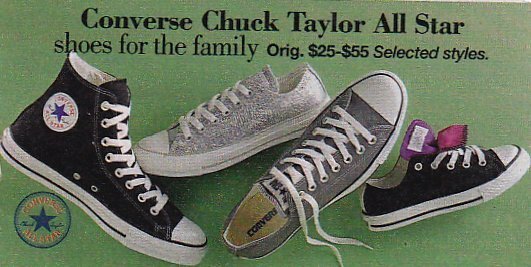 169 Ads for Chuck Taylor Shoes Ad for repeat patch high tops and other seasonal models of low cut chucks. 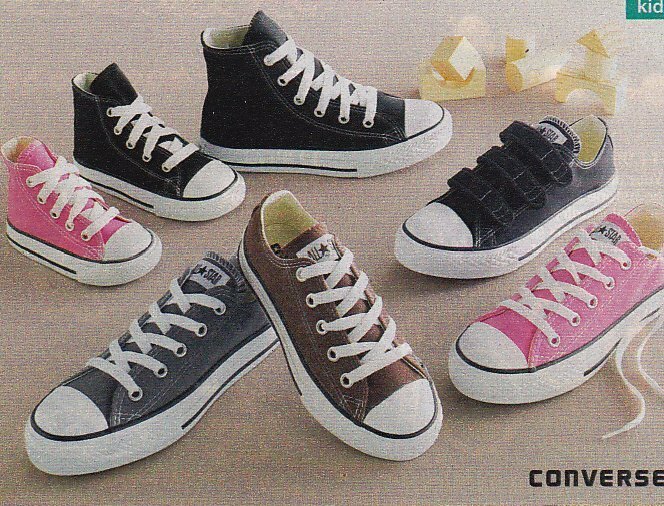 170 Ads for Chuck Taylor Shoes Ad for core model high tops and low cuts. 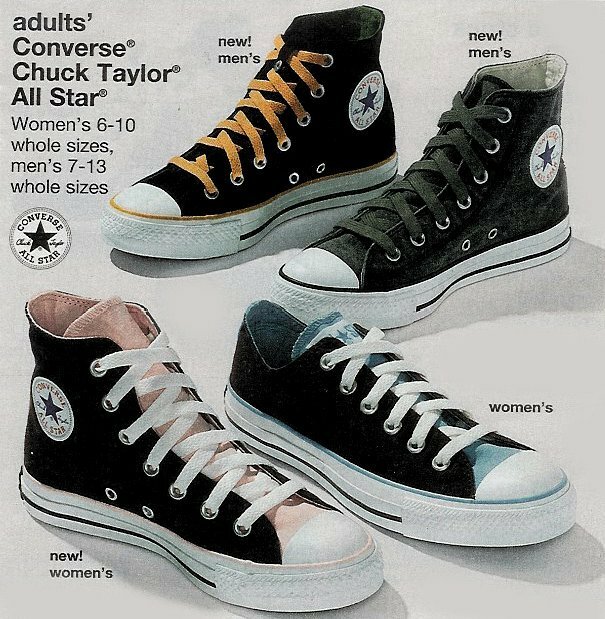 171 Ads for Chuck Taylor Shoes Ad for men's and women's high top and low cut chucks. 172 Ads for Chuck Taylor Shoes Ad for low cut chucks. 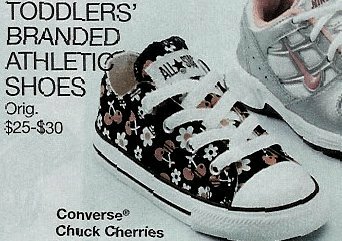 173 Ads for Chuck Taylor Shoes Ad for toddlers chucks. 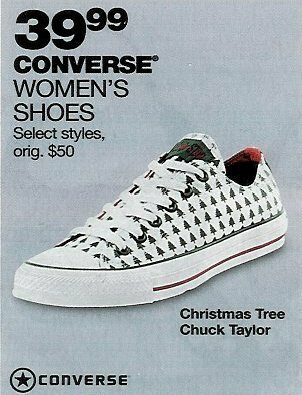 174 Ads for Chuck Taylor Shoes Ad for Christmas tree print low cut. 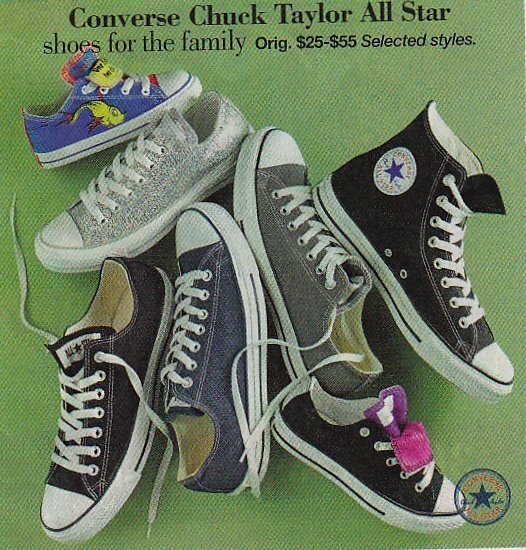 175 Ads for Chuck Taylor Shoes Ad for black high top and low cut chucks. 176 Ads for Chuck Taylor Shoes Ad for white and black print oxford. 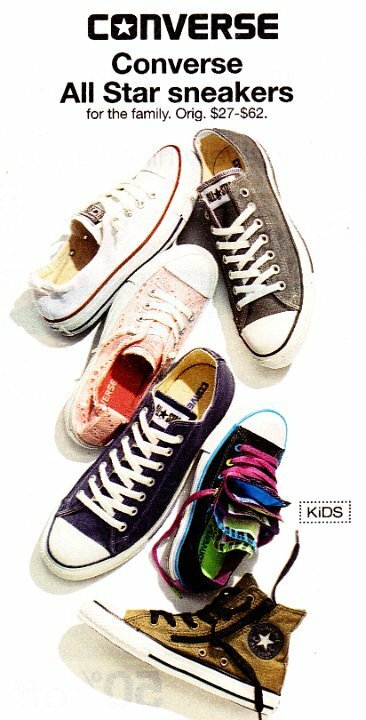 177 Ads for Chuck Taylor Shoes Ad for kid's character shoes. 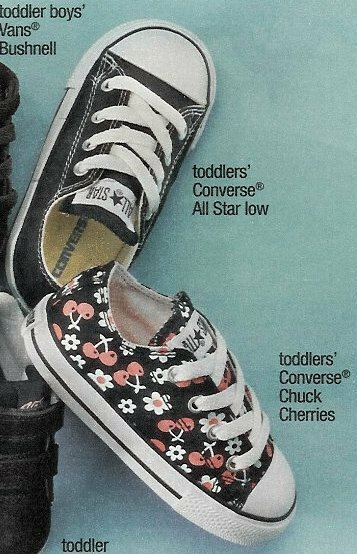 178 Ads for Chuck Taylor Shoes Ad for toddler print low cut. 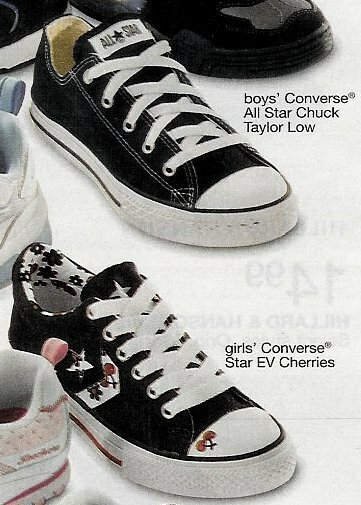 179 Ads for Chuck Taylor Shoes Ad for one stars at Target. 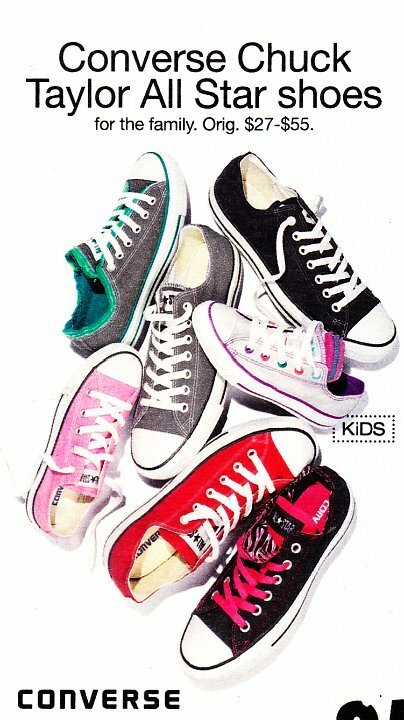 180 Ads for Chuck Taylor Shoes Converse low cuts for kids. 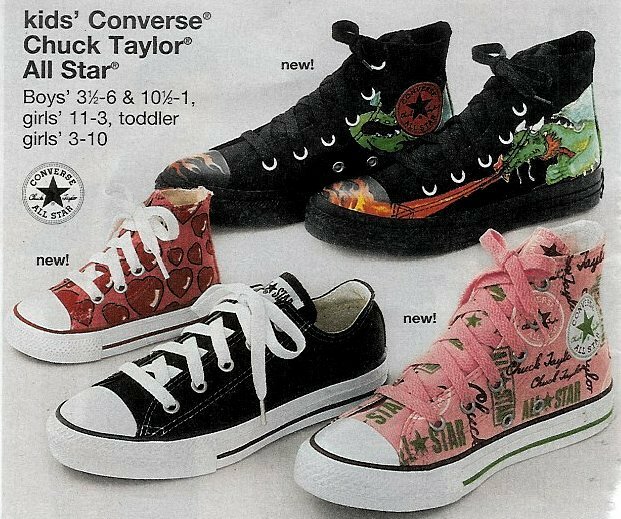 181 Ads for Chuck Taylor Shoes Ad for toddlers chucks. 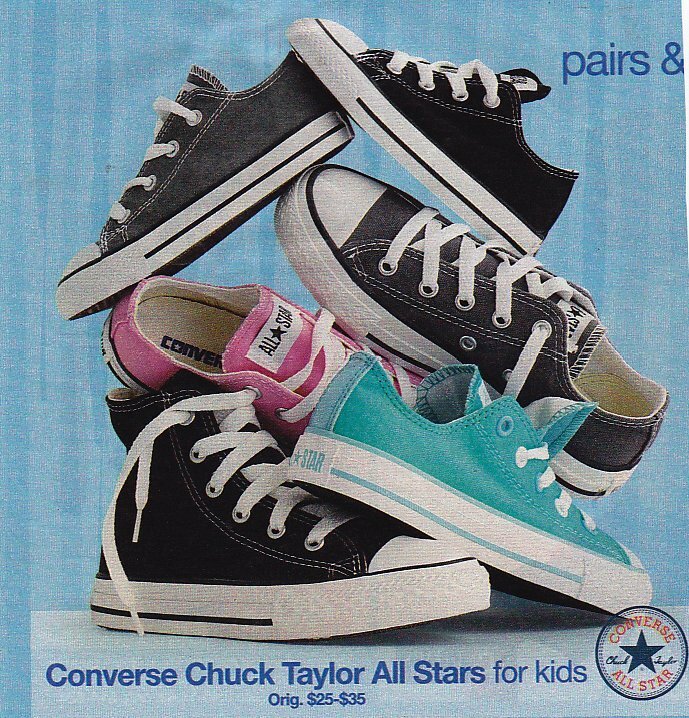 183 Ads for Chuck Taylor Shoes Ad for kids' low cut chucks. 184 Ads for Chuck Taylor Shoes Ad for print low cut chucks. 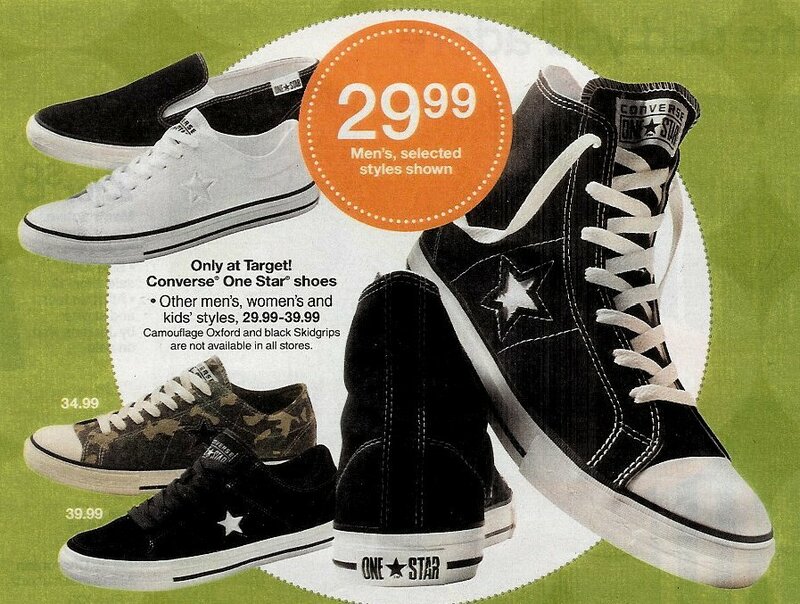 185 Ads for Chuck Taylor Shoes Ad for one stars sold at Target. 186 Ads for Chuck Taylor Shoes Ad for men's chucks. 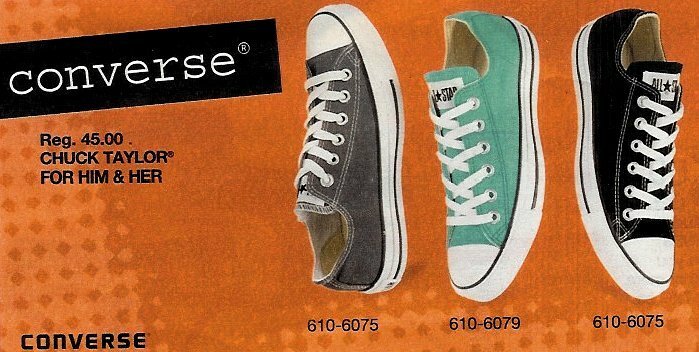 187 Ads for Chuck Taylor Shoes Women's low cut chucks. 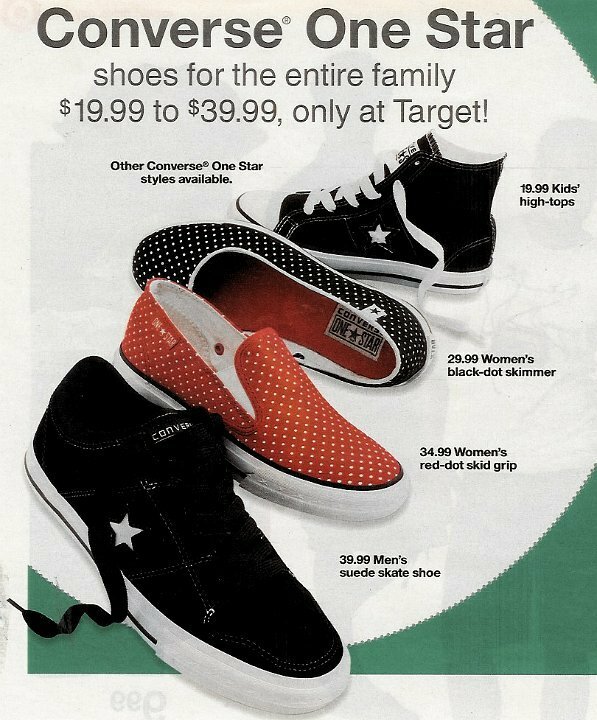 188 Ads for Chuck Taylor Shoes Ad for one stars sold at Target. 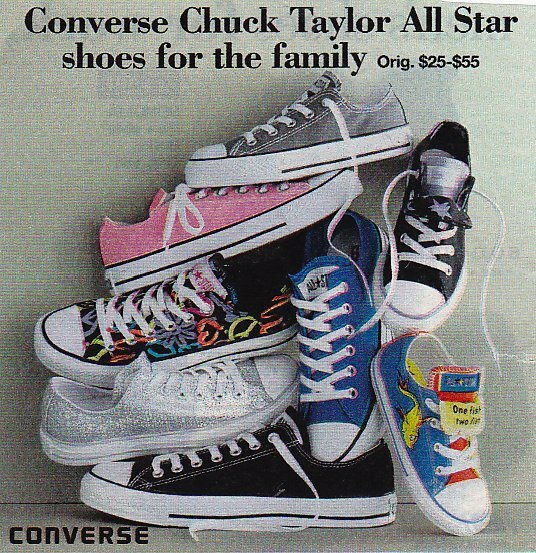 189 Ads for Chuck Taylor Shoes Ad for chucks for little kids. 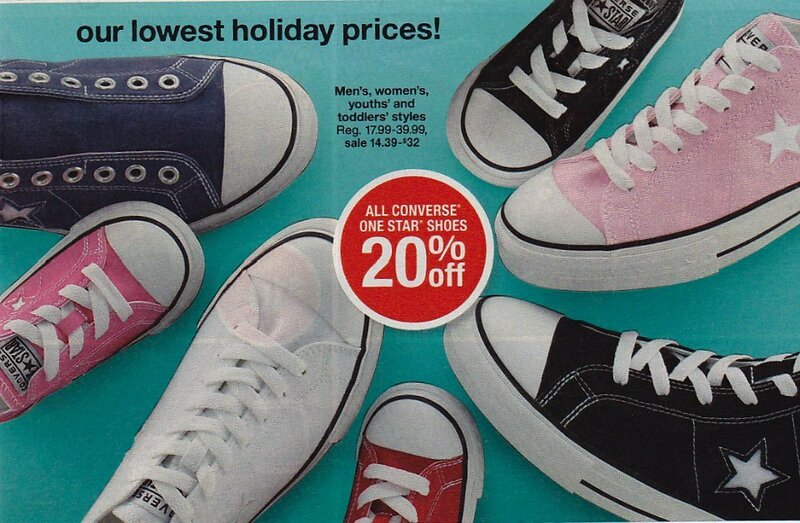 190 Ads for Chuck Taylor Shoes Ad for low cut chucks. 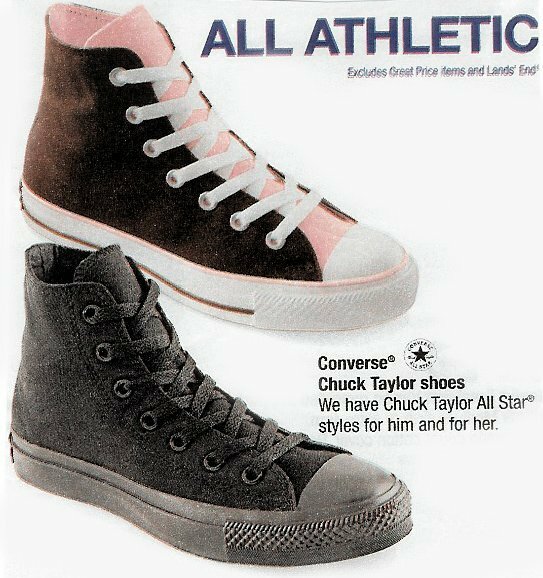 191 Ads for Chuck Taylor Shoes Black low cuts with knee high star socks. 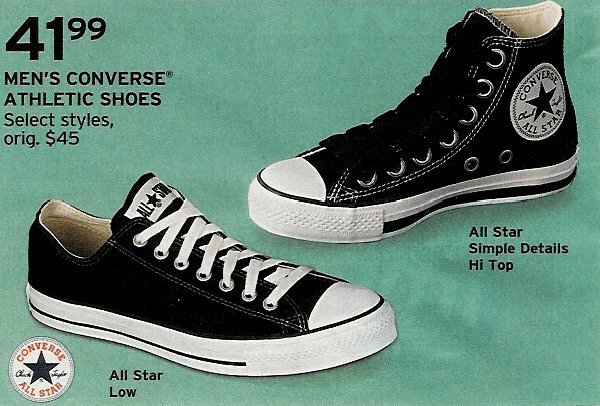 192 Ads for Chuck Taylor Shoes Ad for low cut and black high top chucks. 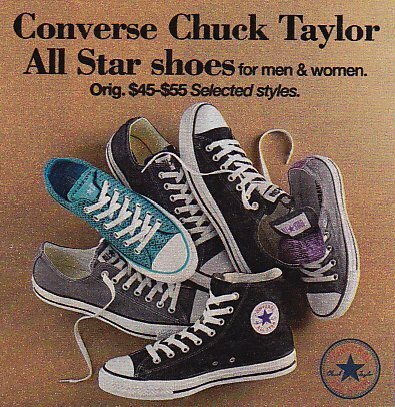 193 Ads for Chuck Taylor Shoes Ad for low cut and black high top chucks. 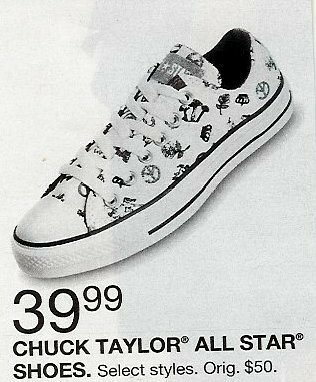 194 Ads for Chuck Taylor Shoes Ad for one star chucks at Target. 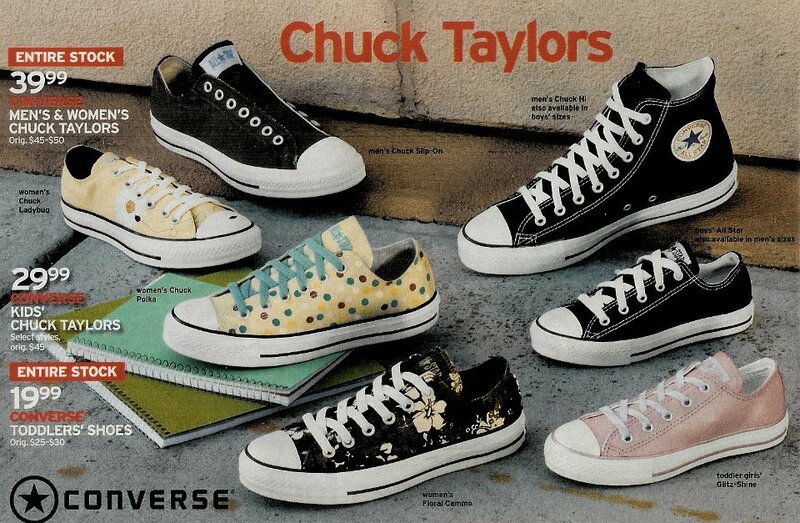 195 Ads for Chuck Taylor Shoes Ad for print pattern low cut chucks. 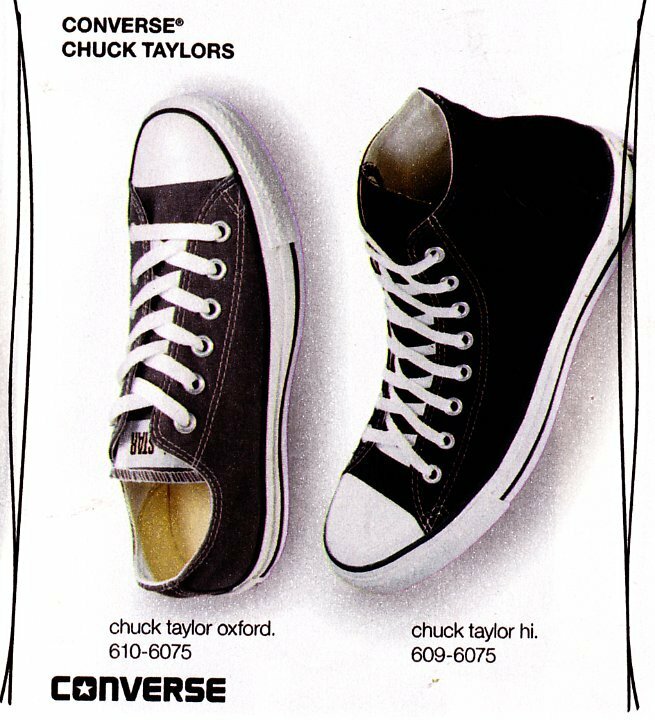 196 Ads for Chuck Taylor Shoes Ad for black and olive double tongue low cut chucks. 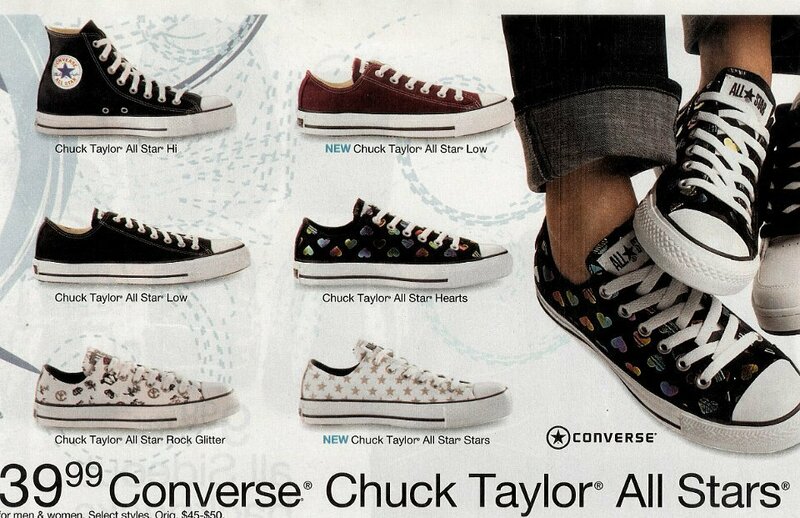 197 Ads for Chuck Taylor Shoes Ad for All Star Premiere canvas low cuts. 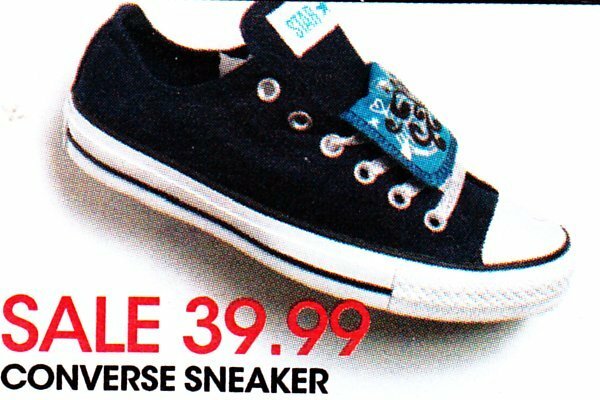 198 Ads for Chuck Taylor Shoes Ad for core low cut cbucks. 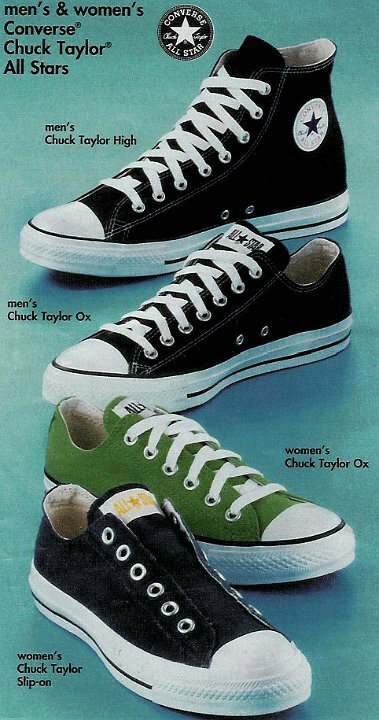 199 Ads for Chuck Taylor Shoes Ad for charcoal, green, white, and black low cut chucks, and monochrome black high tops. 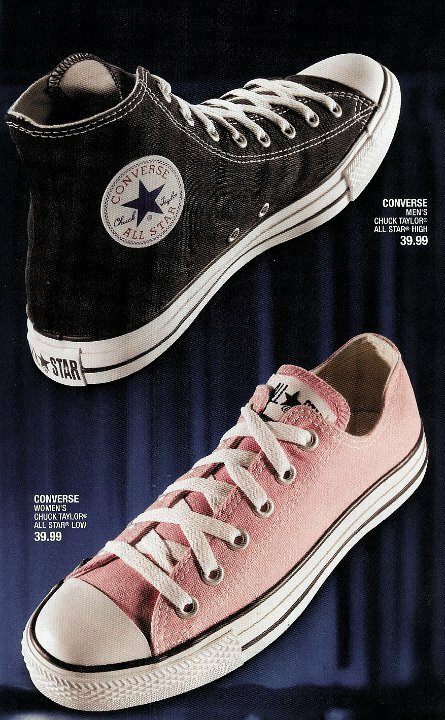 200 Ads for Chuck Taylor Shoes Ad for pink and black high top chucks. 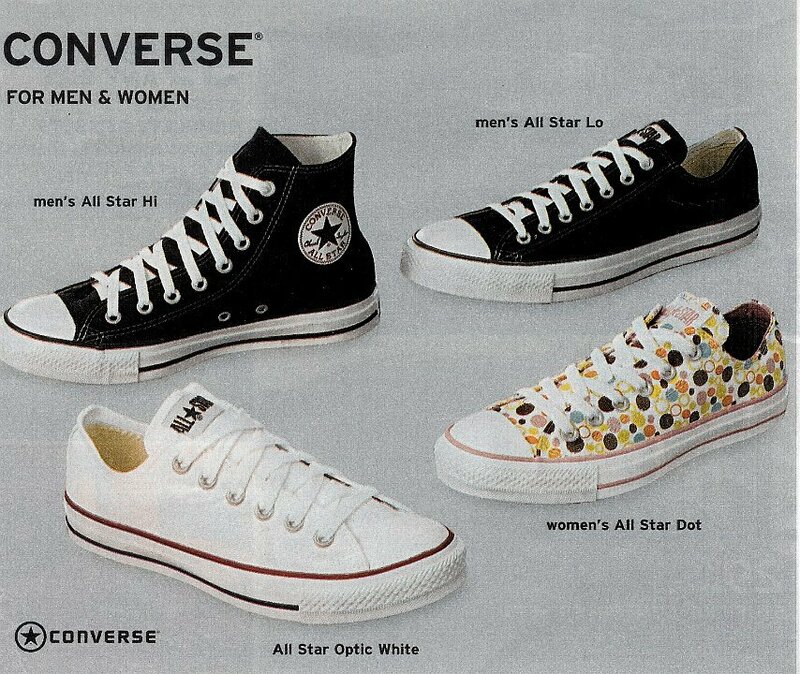 201 Ads for Chuck Taylor Shoes Black and white ad for assorted low cut and high top chucks featuring polka dot and plaid designs. 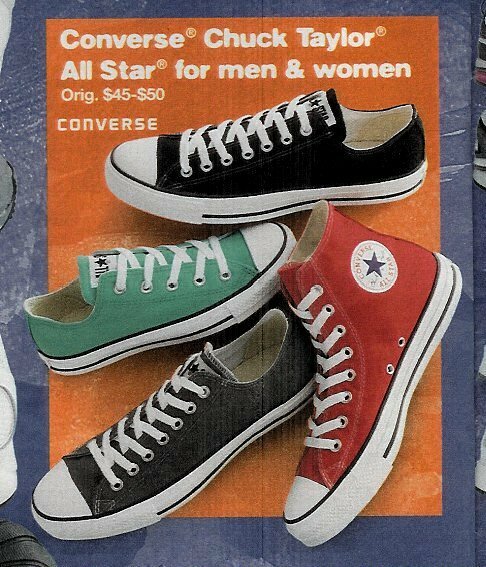 202 Ads for Chuck Taylor Shoes Ad for black, green, and charcoal low cut chucks, and red high tops. 203 Ads for Chuck Taylor Shoes Ad for low cut chucks featuring unique designs. 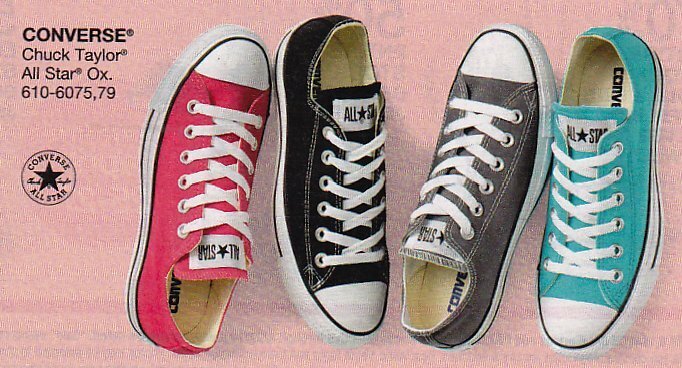 204 Ads for Chuck Taylor Shoes Ad for low cut white, black, and pink chucks, and black and print design high top chucks. 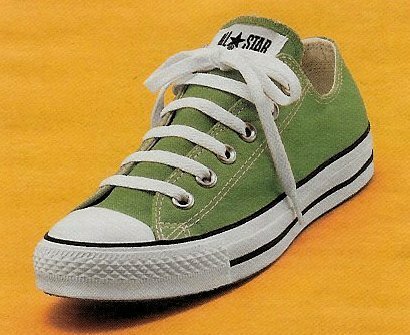 205 Ads for Chuck Taylor Shoes Ad for low cut green chucks. 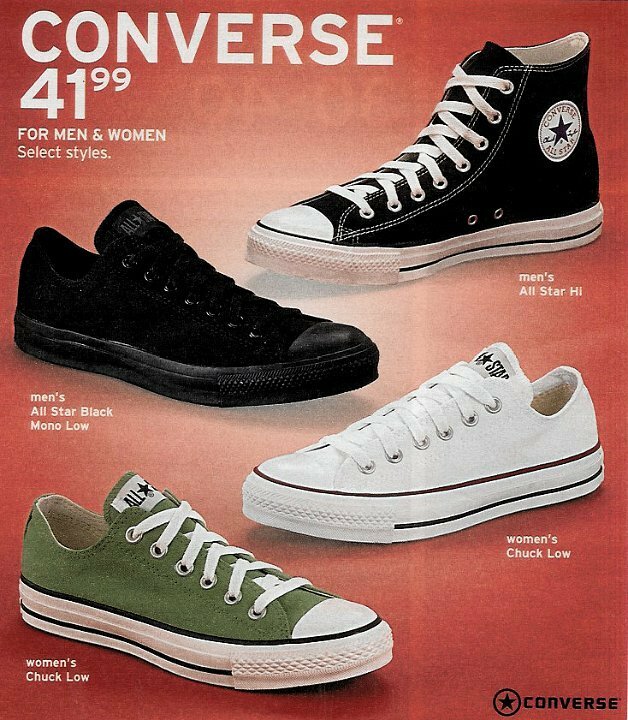 206 Ads for Chuck Taylor Shoes Ad for charcoal, green, and black low cut chucks. 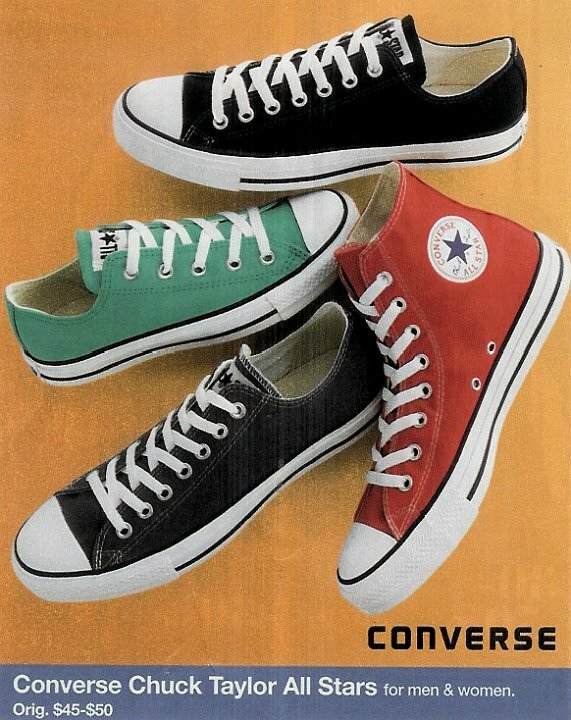 207 Ads for Chuck Taylor Shoes Ad showing black, green, and charcoal low cut and red high top chucks. 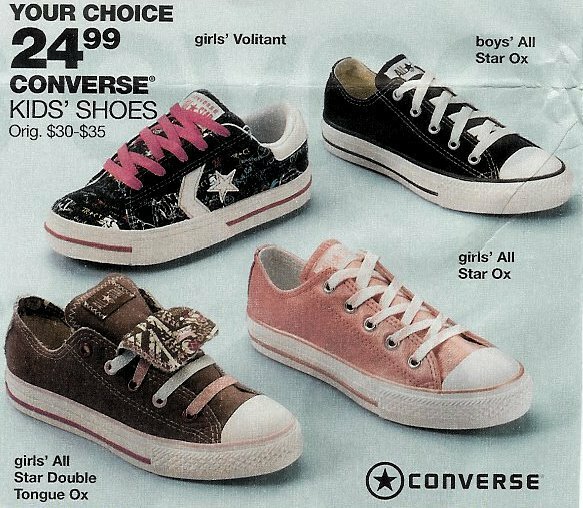 208 Ads for Chuck Taylor Shoes Ad showing black high tops and optical white, pink, gray and black low cuts. 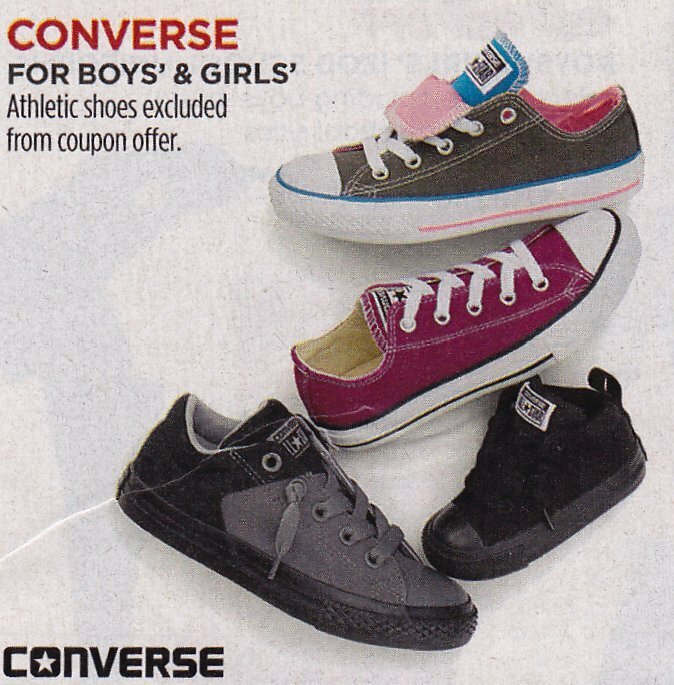 209 Ads for Chuck Taylor Shoes Ad showing black, navy, gray, and green low cuts for men and women and pink and black high tops for kids. 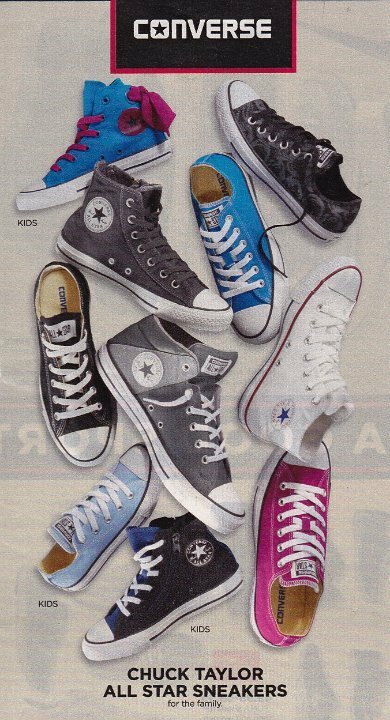 210 Ads for Chuck Taylor Shoes Ad showing monochrome black high tops, black, grey, and navy low cuts, and print and double tongue low cuts for kids. 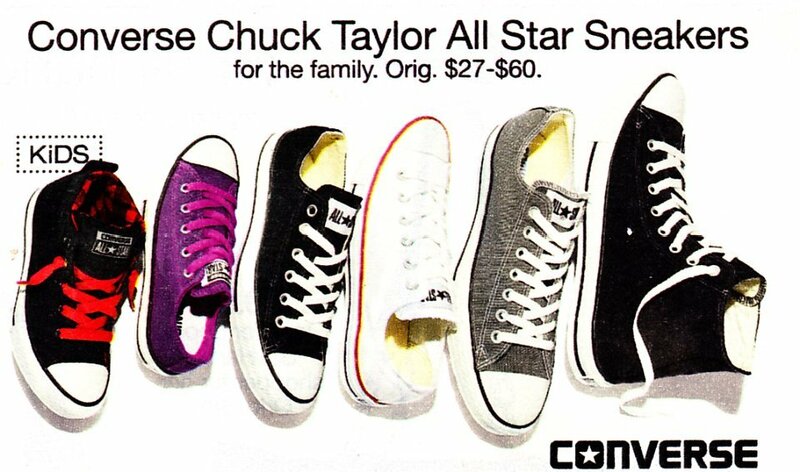 211 Ads for Chuck Taylor Shoes Ad showing Converse One Stars. 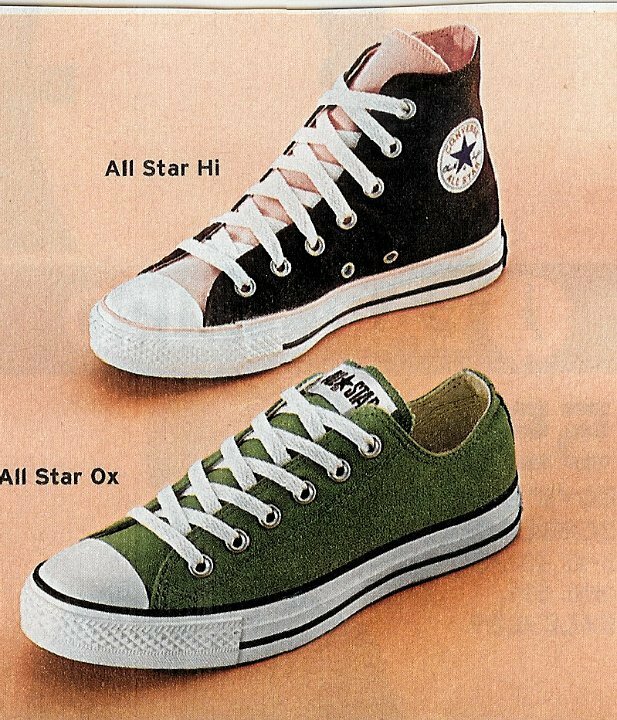 212 Ads for Chuck Taylor Shoes Ad showing black high top, and grey and green low cut chucks. 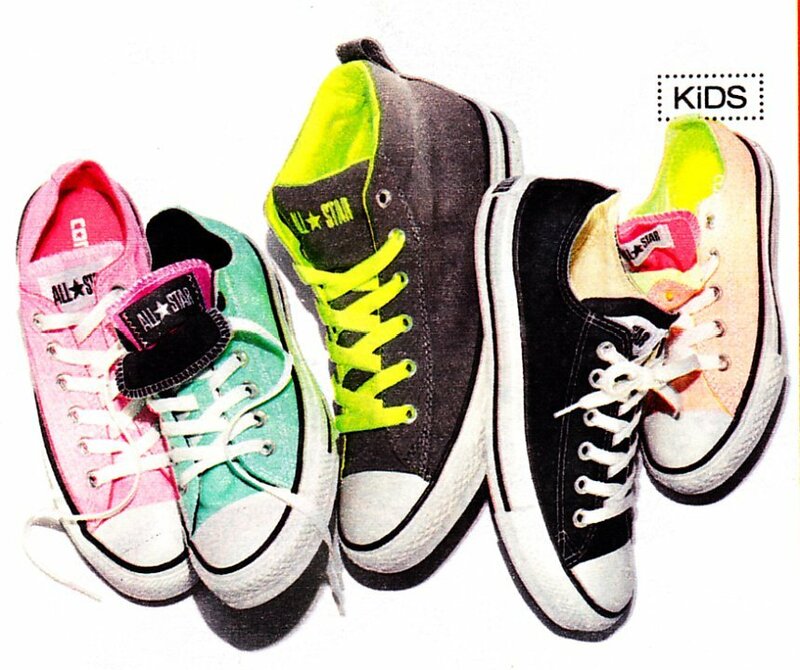 213 Ads for Chuck Taylor Shoes Ad showing black high tops and low cut, grey low cut, and seasonal models for kids. 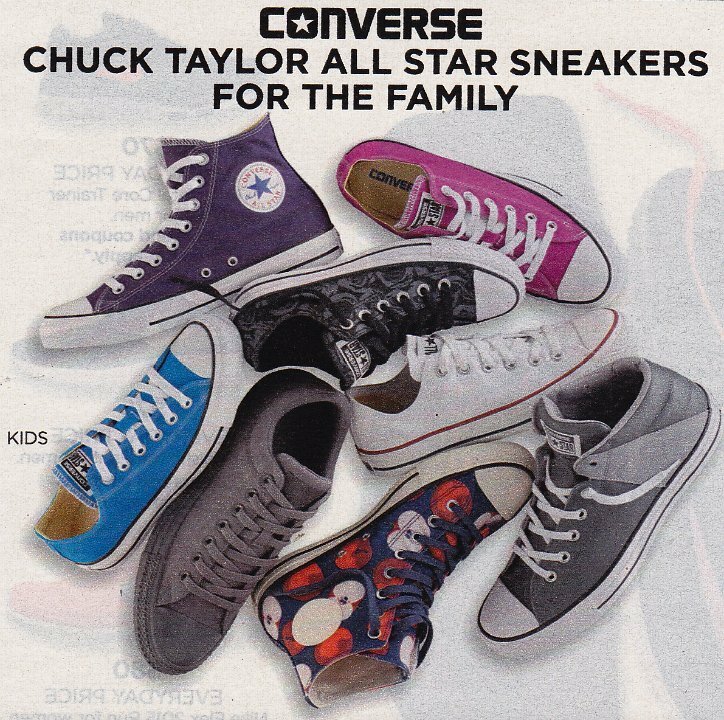 214 Ads for Chuck Taylor Shoes Black high tops for adults and kids, along with various sesaonal models. 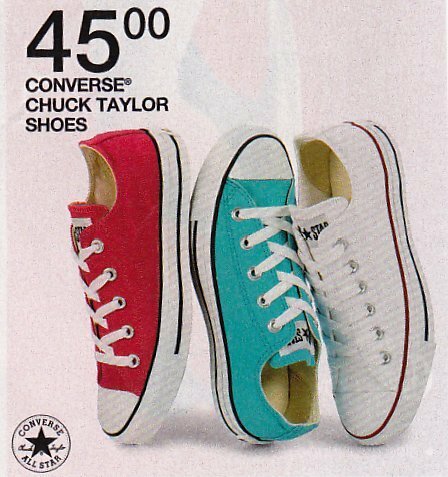 215 Ads for Chuck Taylor Shoes Ad showing red, turquoise, and optical white low cuts. 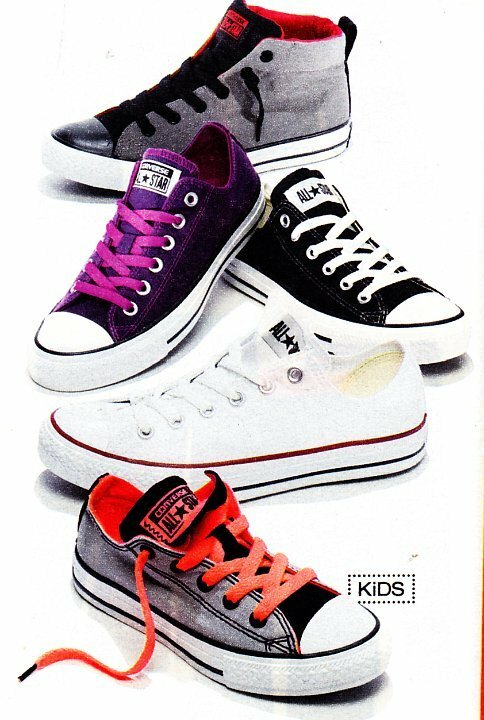 216 Ads for Chuck Taylor Shoes Ad shwoing popular models of chucks for kids. 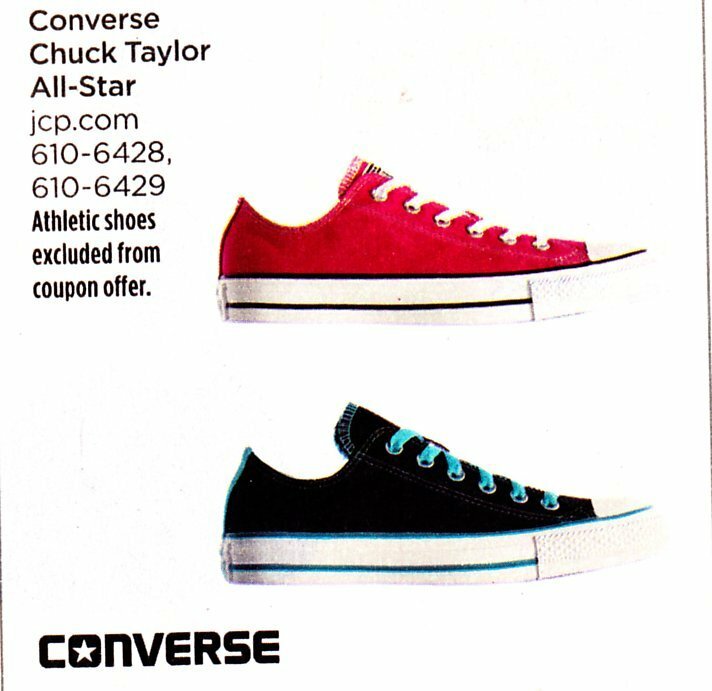 217 Ads for Chuck Taylor Shoes Ad showing red, black, grey, and turquoise low cuts. 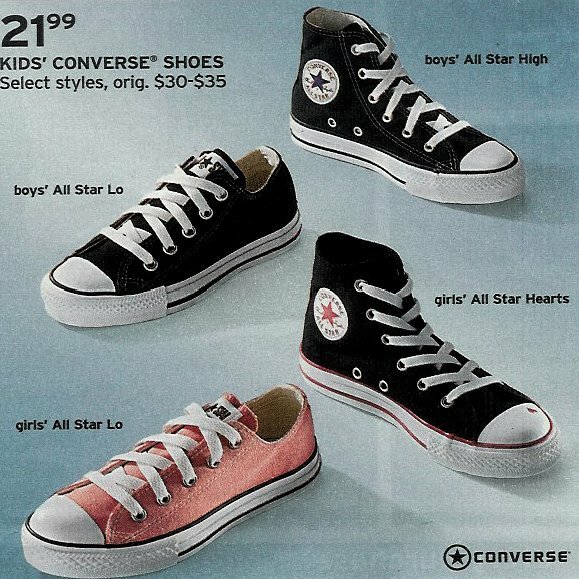 218 Ads for Chuck Taylor Shoes Ad showing black high tops, black low cut, pink, green, and print low cuts, and brown slip ons. 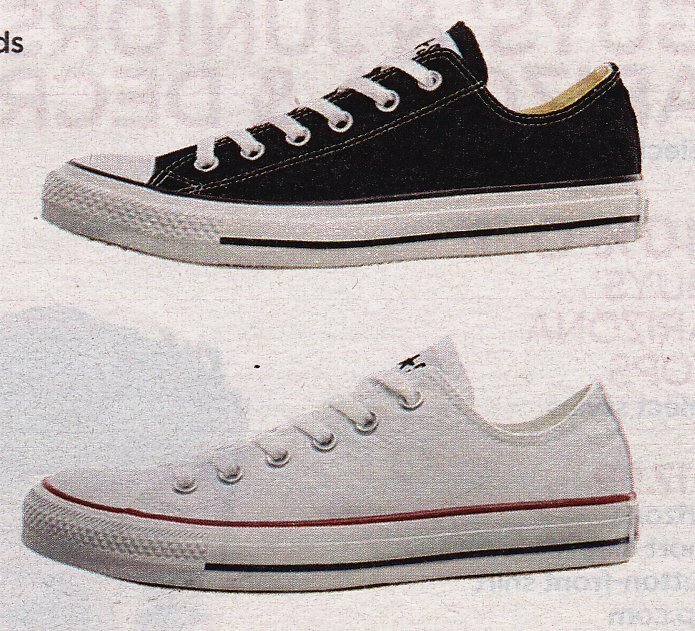 219 Ads for Chuck Taylor Shoes Ad showing black high top and low cut, and grey low cut chucks. 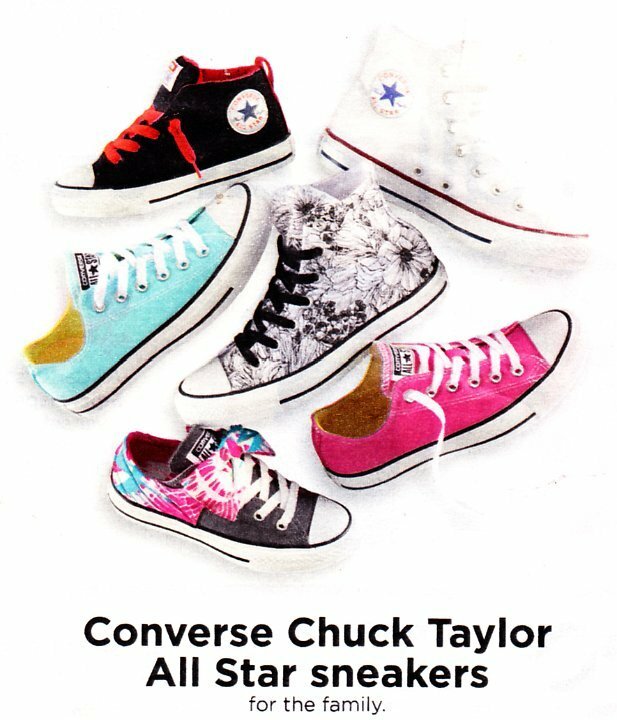 220 Ads for Chuck Taylor Shoes Ad showing print and raspberry low cut models. 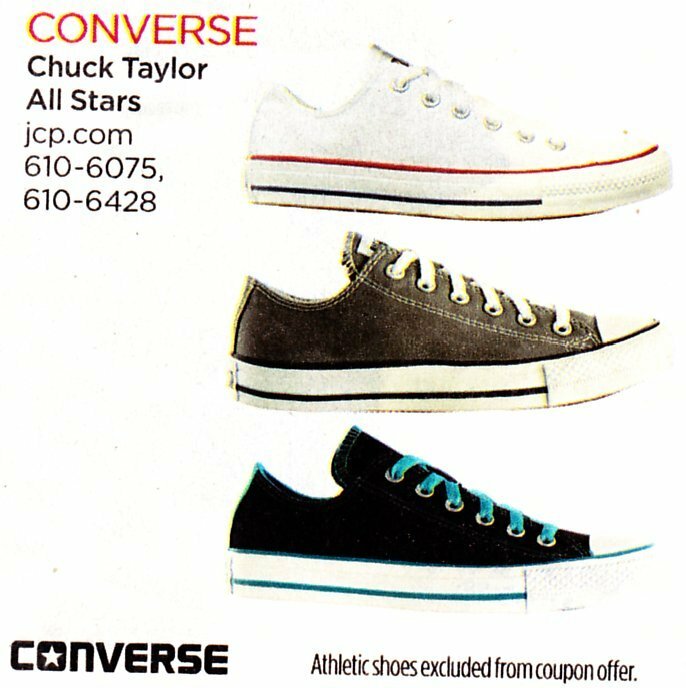 221 Ads for Chuck Taylor Shoes Ad showing black high top and grey slip-on chucks. 222 Ads for Chuck Taylor Shoes Ad showing a variety of low cut models. 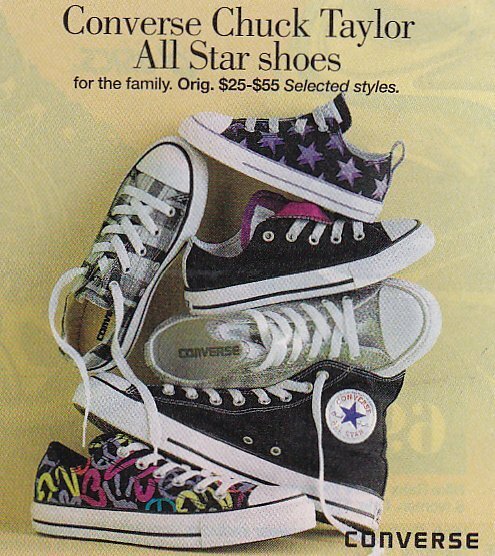 223 Ads for Chuck Taylor Shoes Ad showing black high tops and several print pattern low cuts. 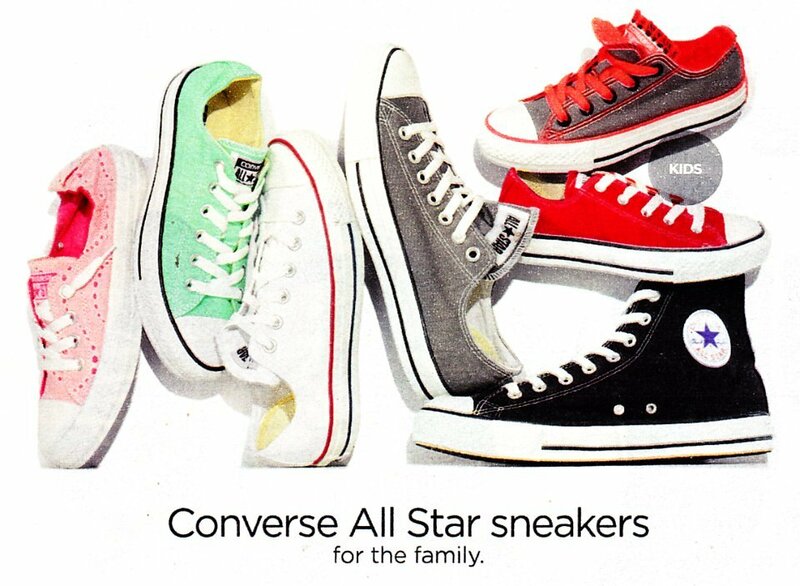 224 Ads for Chuck Taylor Shoes Ad showing chucks for the entire family. 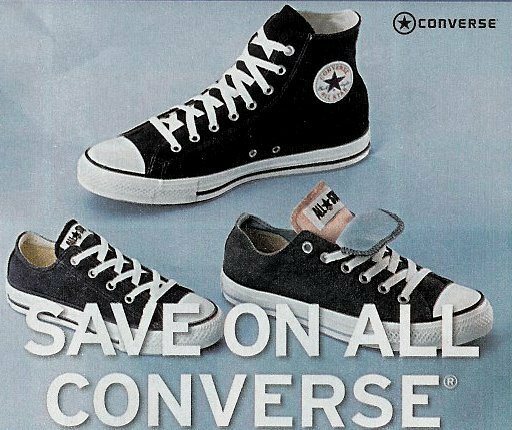 This gallery contains advertisements for Chuck Taylor high top and low cut shoes that have appeared in newspaper supplements for department, shoe, and sporting goods stores.